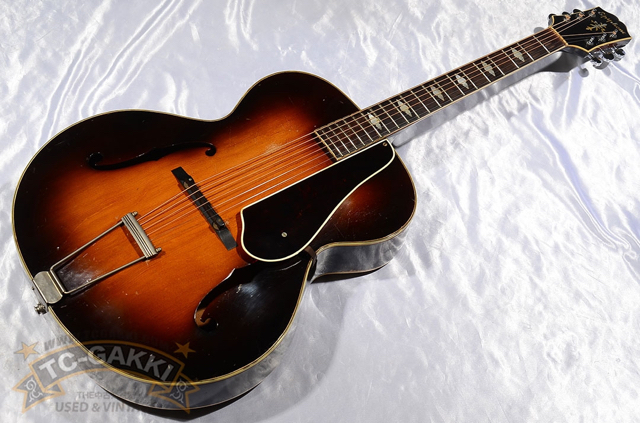 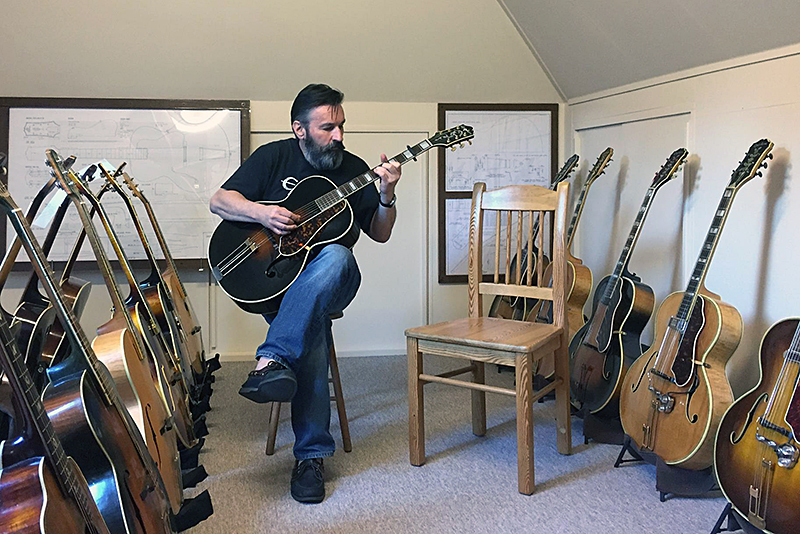 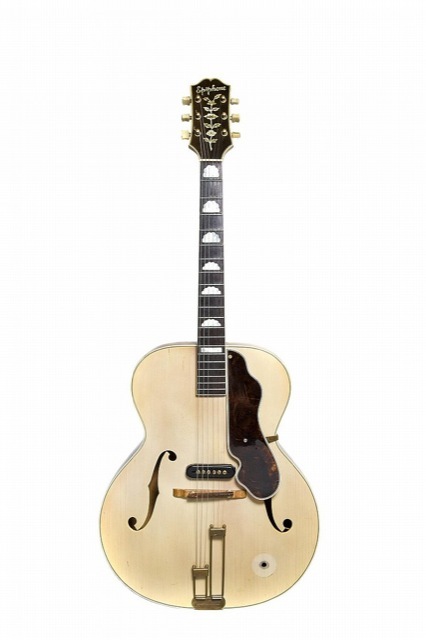 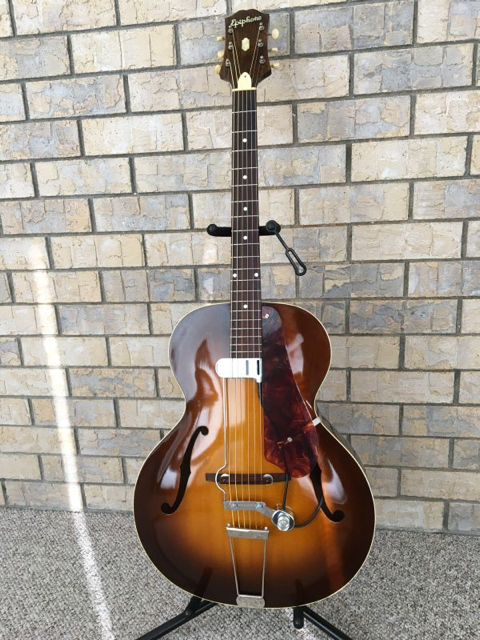 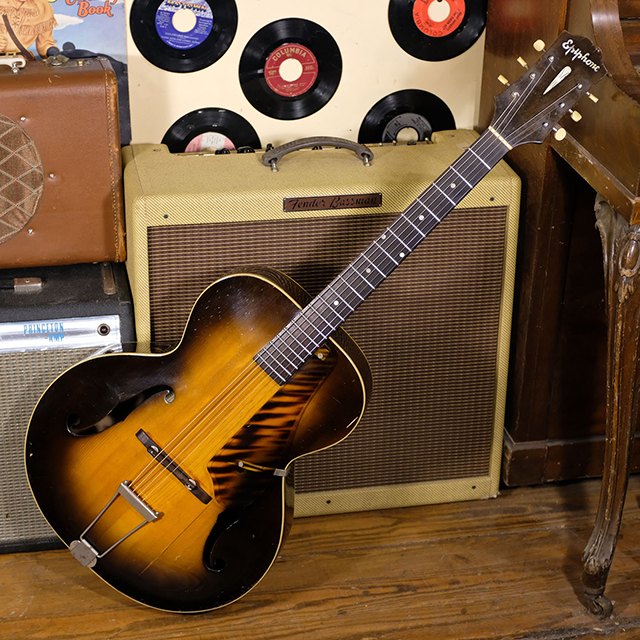 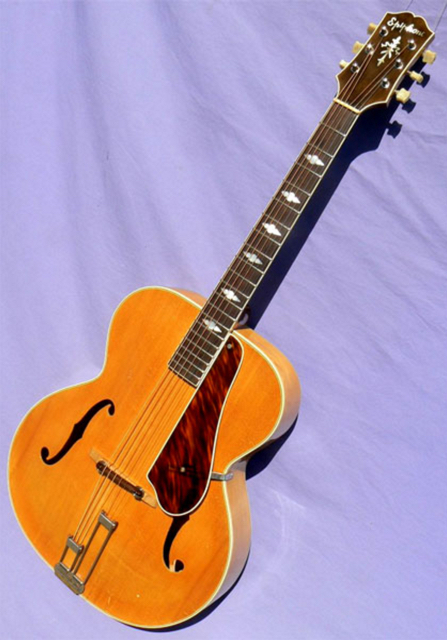 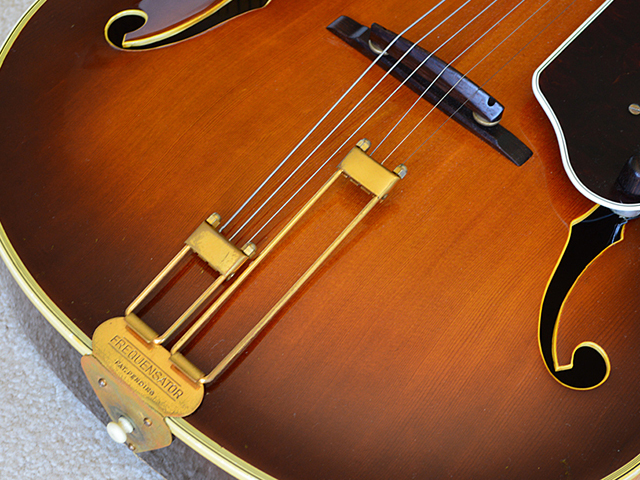 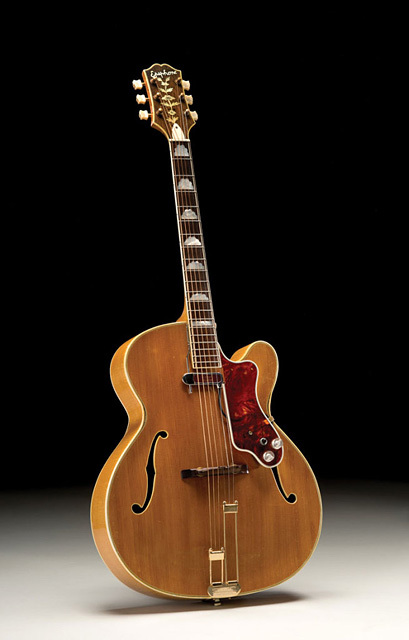 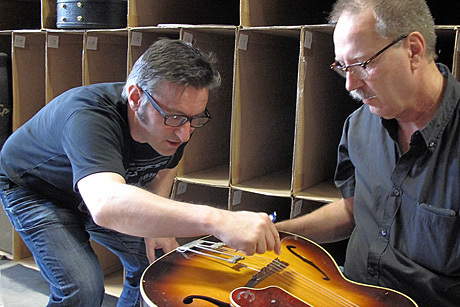 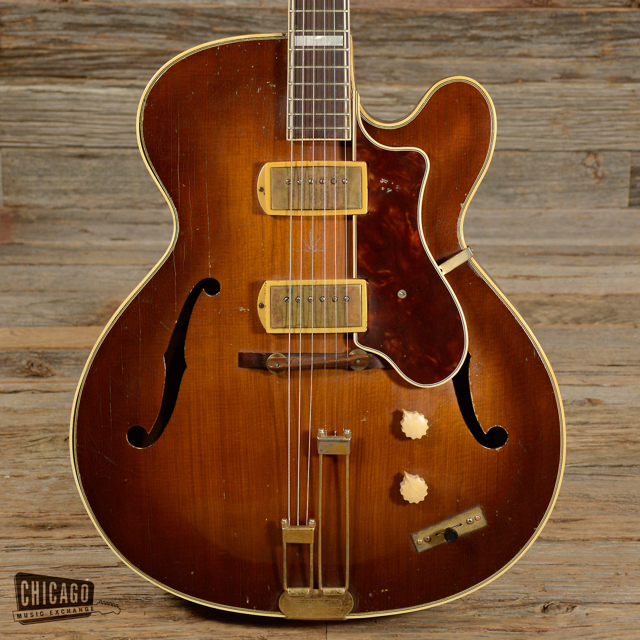 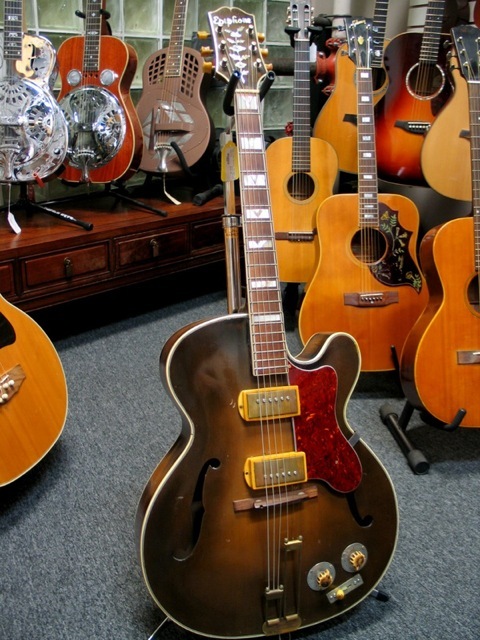 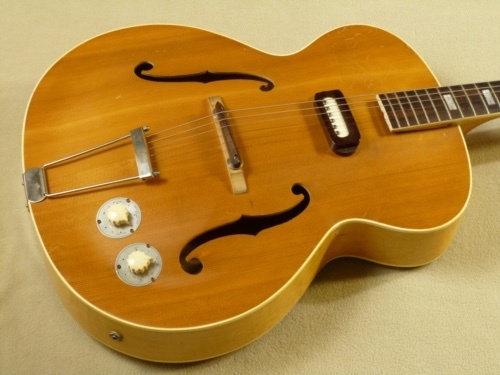 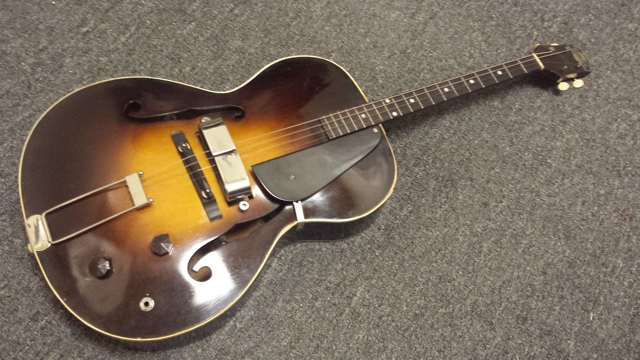 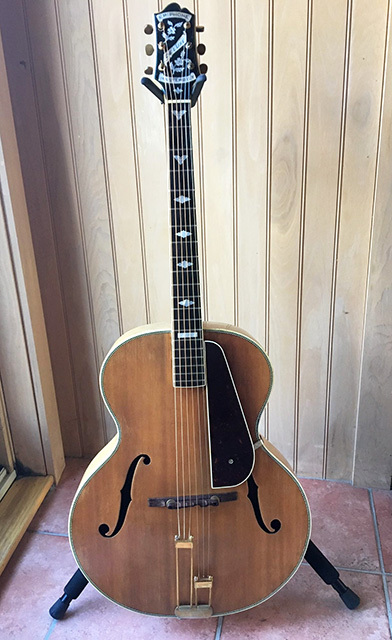 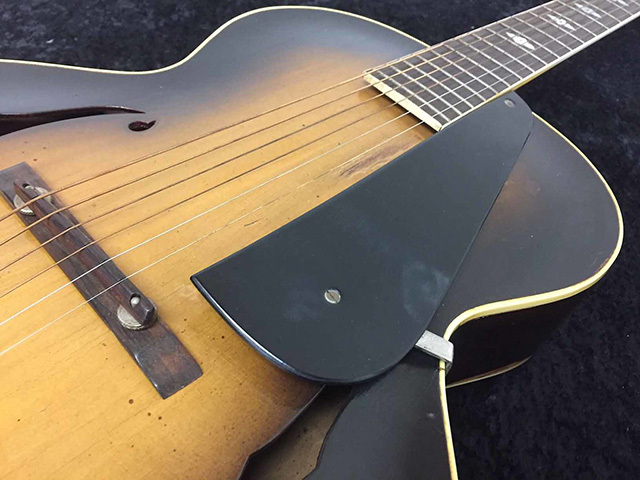 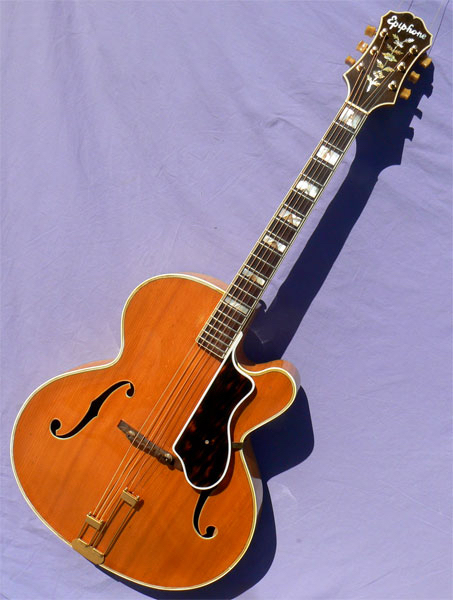 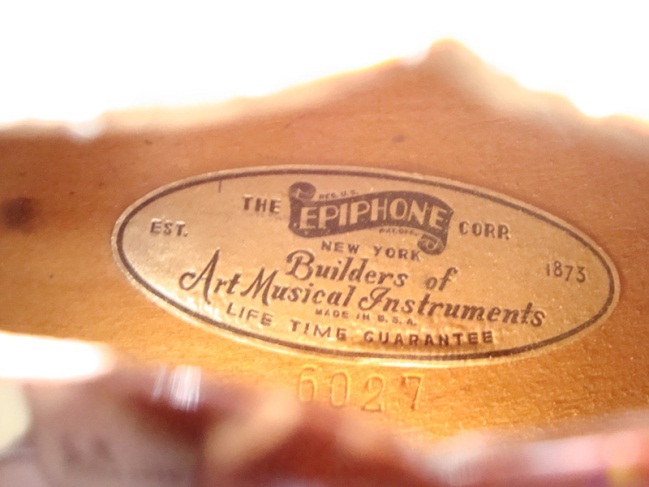 This timeline provides a chronology of milestones, developments and changes related to Epiphone instruments over the years 1931 to 1956. 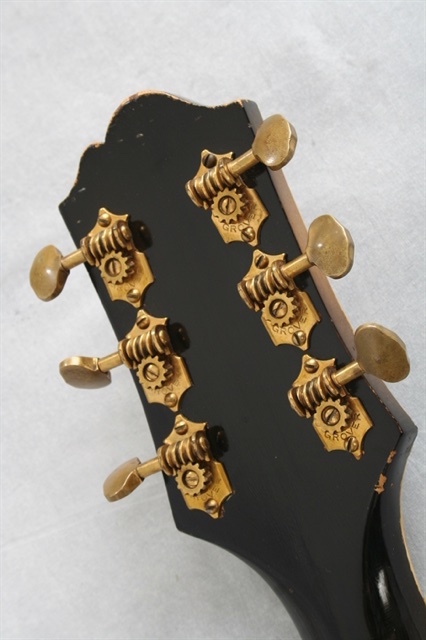 The timeline focuses on general aspects, while detailed info about individual models and their development can be found on the Models page. 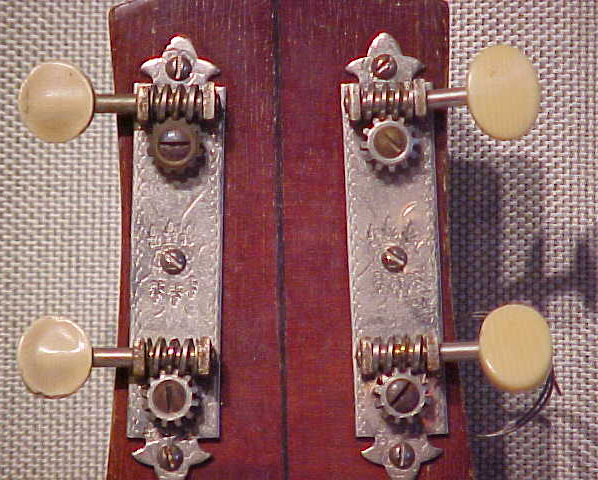 Click on links to see photo of example. 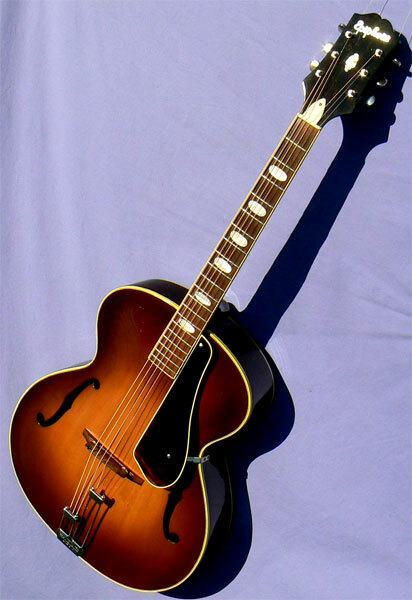 Note: The quoted serial numbers (SN) refer to the first/last examples of a model/feature as documented in our Registry – i.e. 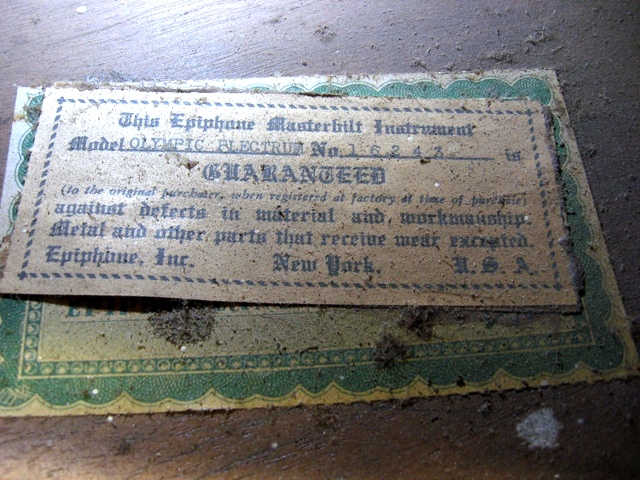 not necessarily the first/last example in existence. 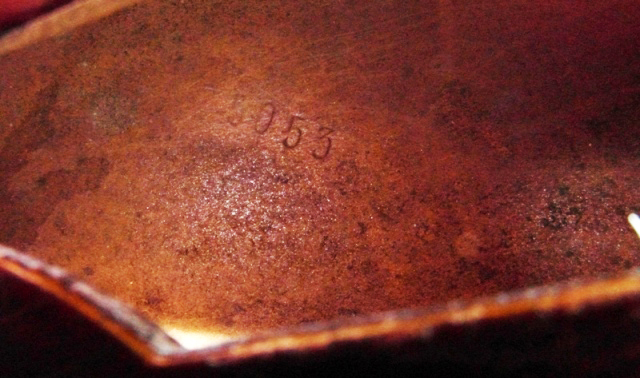 The timeline is a working document and subject to corrections as new evidence material surfaces. 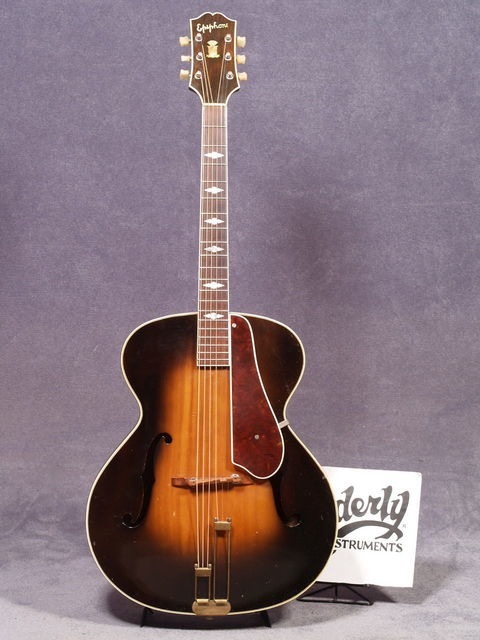 Updated version of 1934 catalog "Masterbilt Fretted Instruments"
In catalog Chicago Musical Instruments: "Sorrentino guitars"
Body shape (archtop guitars, most pronounced in new large size models): design of upper bouts changed to join at the neck in a more curved, slope-shoulder shape. 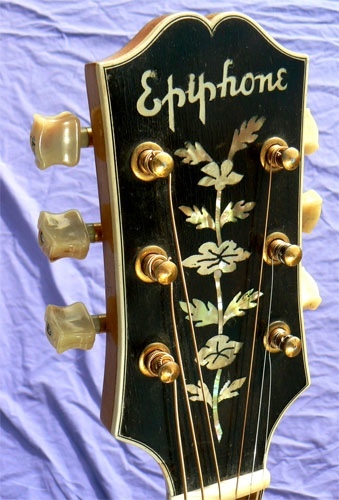 Epaminondas "Epi" A. Stathopoulo passes away on June 6, 1943. 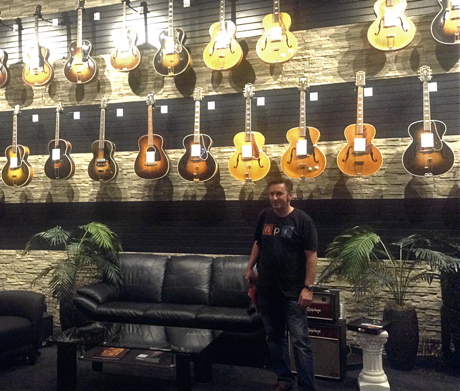 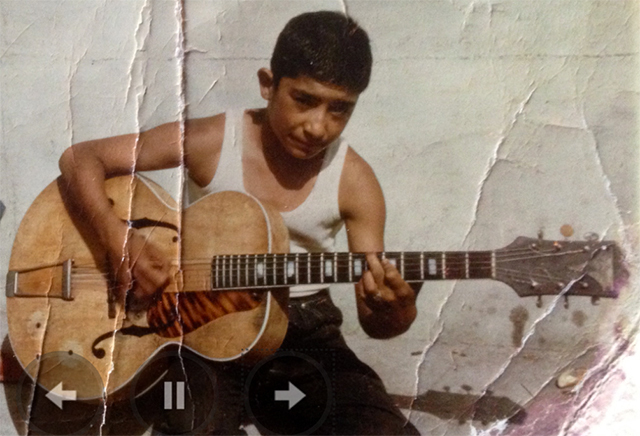 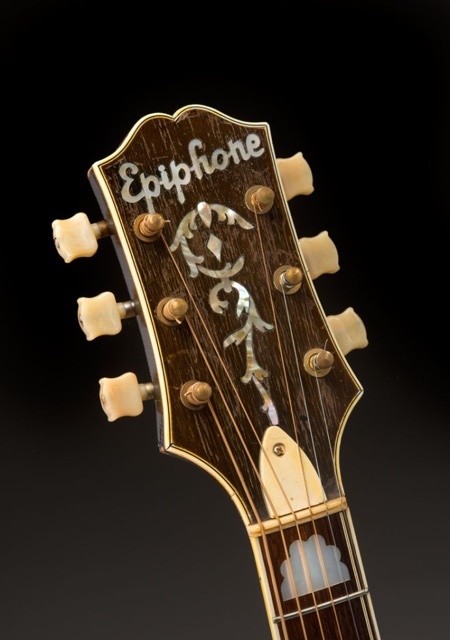 Epi's brother, Orpheus "Orphie" A. Stathopoulo, is successor as President of Epiphone Inc.
Century Spanish: upsized 2nd time, now to 16⅜"
Strings: new company/address "Epiphone Musical Strings Inc., Box 55, E. Station, Yonkers 4, N.Y."
Catalog "Dedicated to the best"
Go to bibliography of quoted sources. 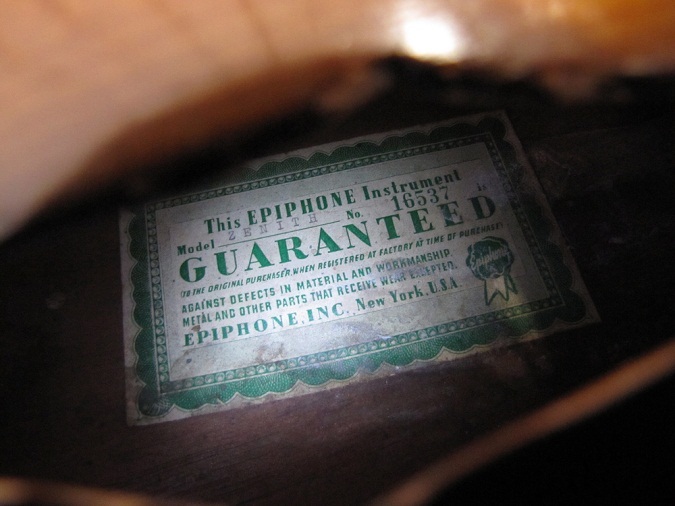 1) Source: Wheeler 1982, p29; quoted by later sources (Fisch, Gruhn, Carter), however no further details about the announcement documented. 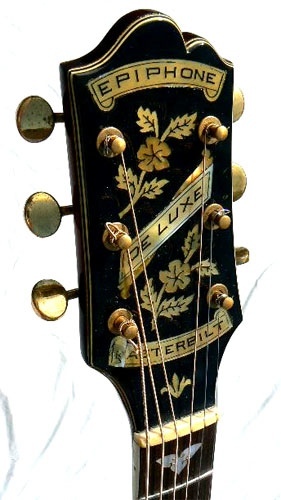 We have not located any Masterbilt instruments related adverts in any major music industry publication of 1931; the earliest documented advert found in "Metronome", issue February 1932 (info: Rod McDonald, Anthony Hendrix). 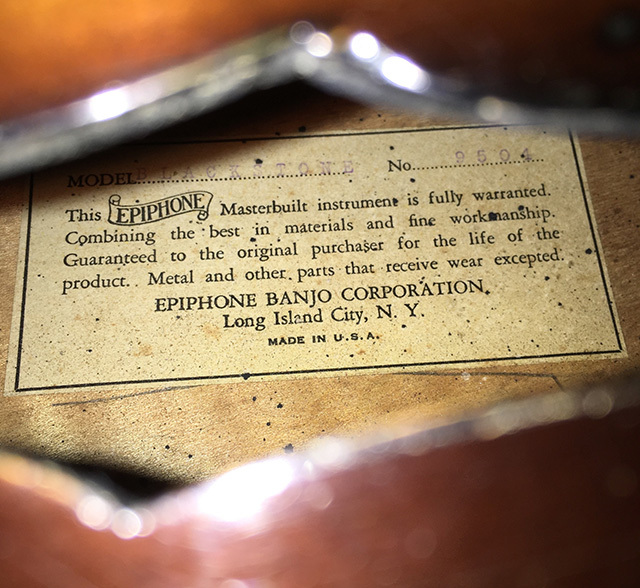 2) See advert in "Metronome", Jan 1933 p13, referring to "Our New Catalog – just off the press", using some image printing blocks from the catalog. 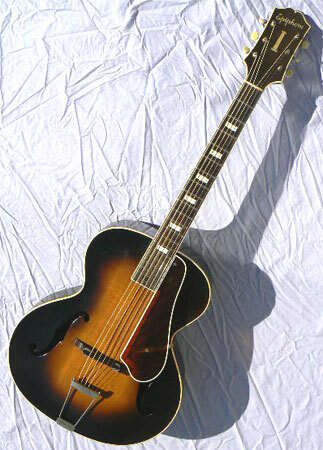 guitarist Carl Kress who was prominently featured in the 1932 catalog is no longer mentioned (obviously because Kress had become an endorser of Gibson by 1933). 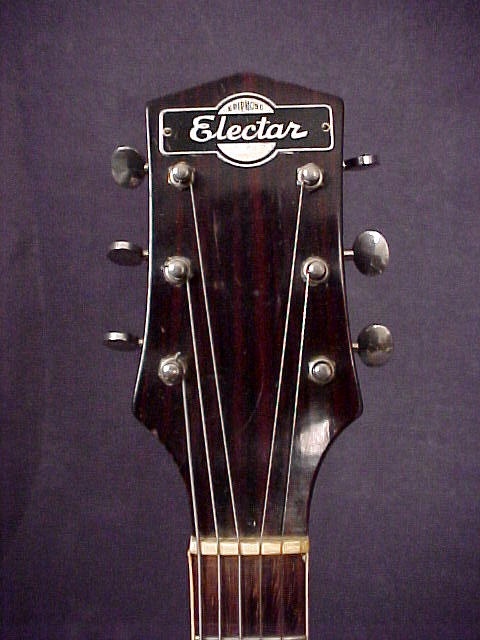 There are two slightly different versions of this flyer, the later one stating changes to the models Blackstone (increased price $75, "brown mahogany") and Olympic (increased price $35). 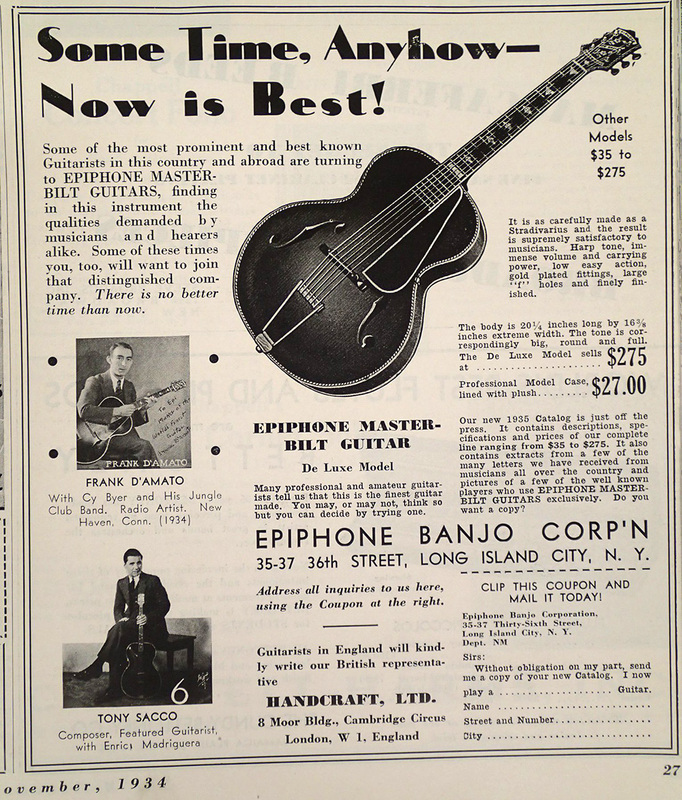 4) See advert in "Metronome", Sep 1934 p24: Coupon "Send me your new Guitar Book as soon as it is off the press"; advert in "Metronome", Nov 1934 p27: "Our new 1935 Catalog is just off the press". 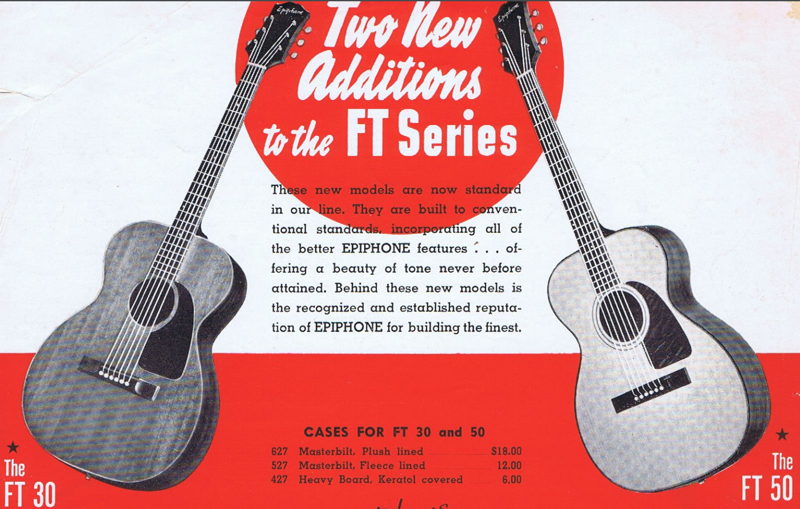 5) See advert in "Metronome", Dec 1935: "2 new and greater Epiphone guitars" (Fisch 1996, p85). 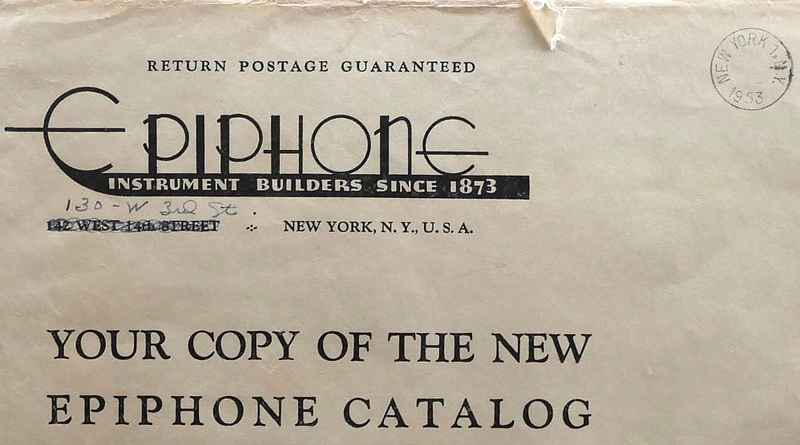 6) These changes can be found in an updated version of the 1934 catalog (corrected by text stickers) which also was stamped with the new NYC address (see catalogs). 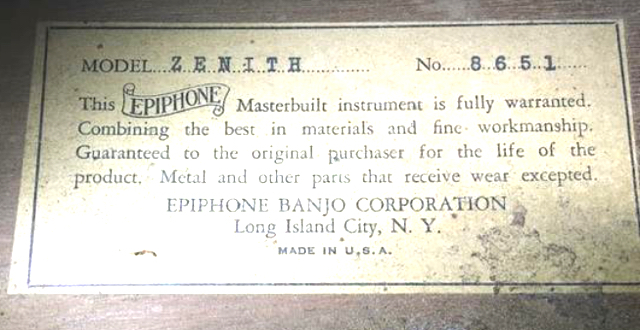 Advert in "Metronome", June 1935: "New oversize Zenith" (Fisch 1996, p100). 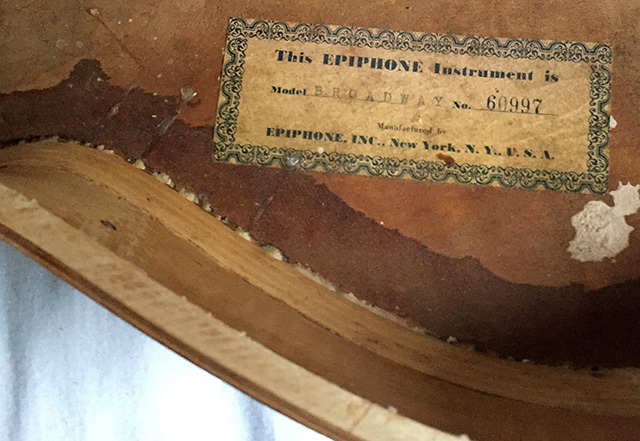 7) Earliest known advert in: "Metronome", Nov 1935, p32 (info: Rod McDonald, see also: Fisch 1996, p29+133); the earliest Electar instruments don't bear a SN. 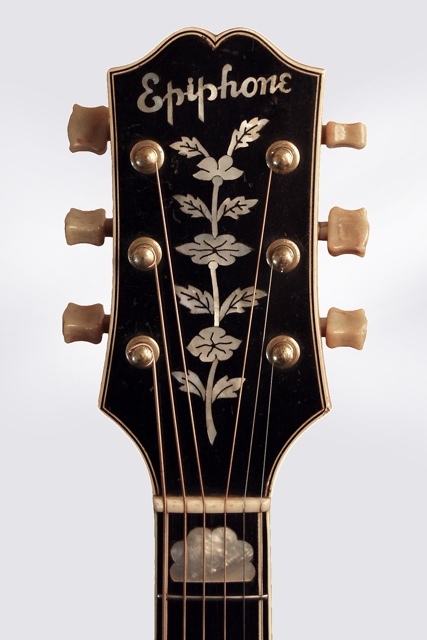 8) Carter 1995, p26: photo of catalog cover with "received" stamp dated July 6, 1936. 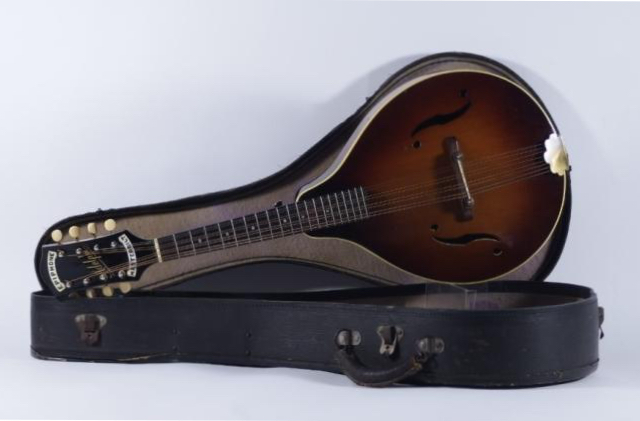 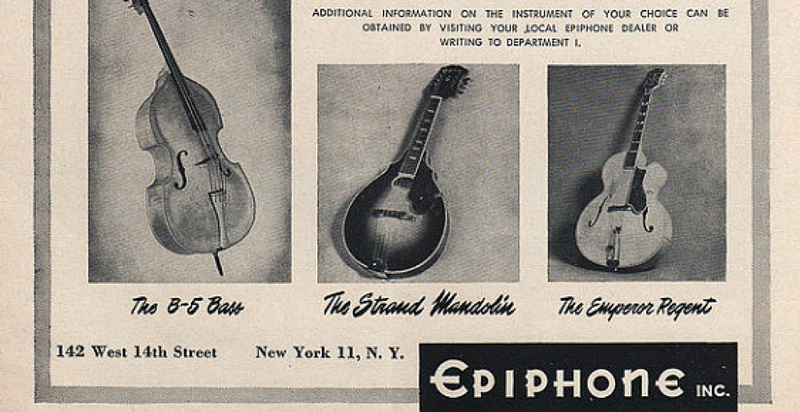 The mandolin models were still illustrated with images from the 1932 and 1934 catalogs (not showing the changed specs). 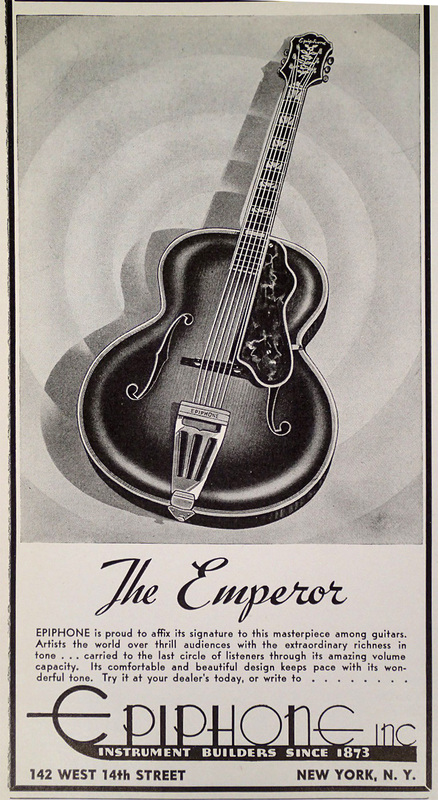 The Emperor flyer shares similar artwork with an advert in "Metronome", Dec 1936. 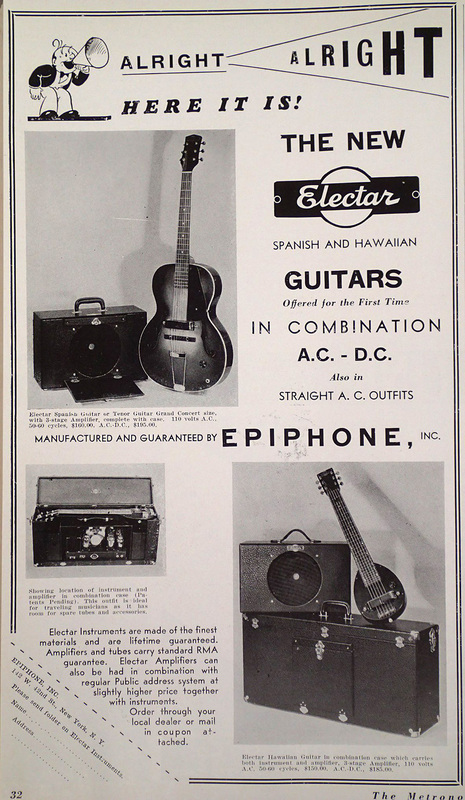 9) Fisch 1996, p148: Electar catalog "released late 1936". 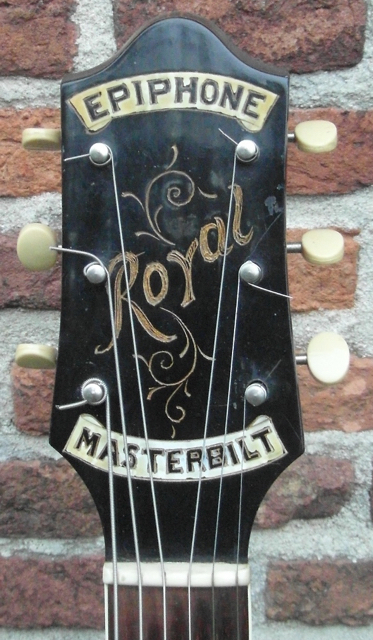 10) The Masterbilt label – and later type labels – featured printed SNs (likely applied by a letterpress numbering machine). 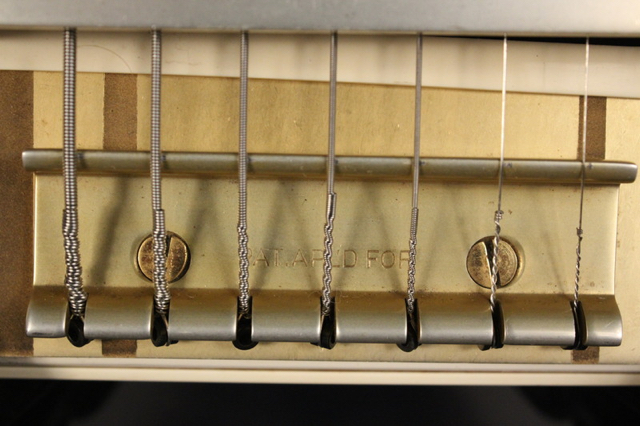 However in some cases "blank" labels with a typed SN were used: There are numerous examples of instruments which have the original SN typed on an untypical, later period label – possibly glued in as replacement for the original label during a later repair at the factory. 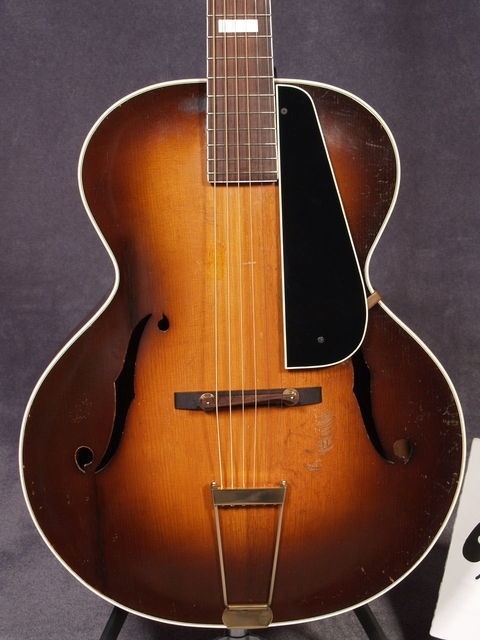 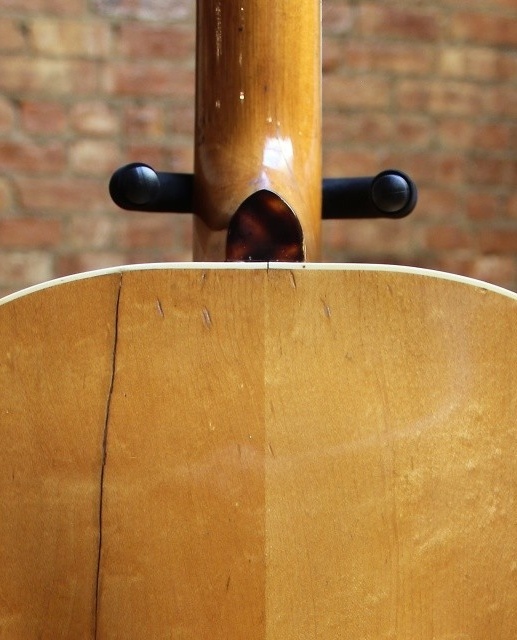 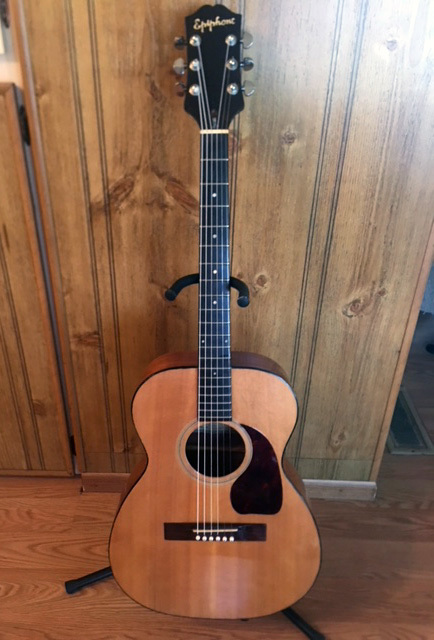 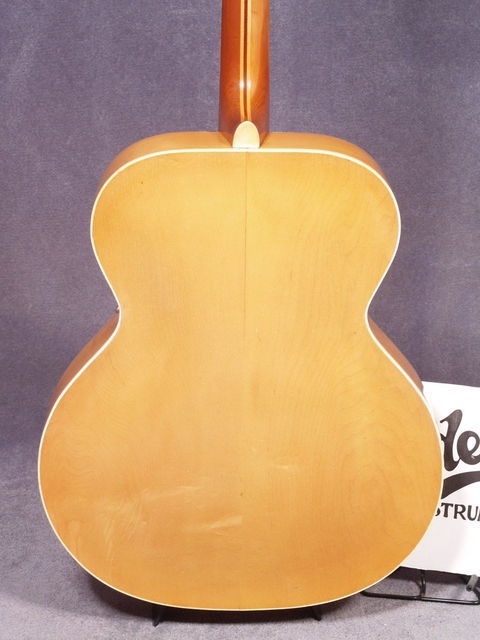 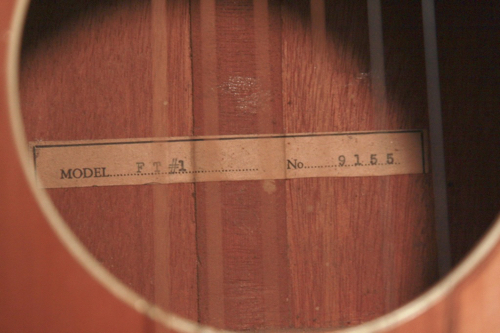 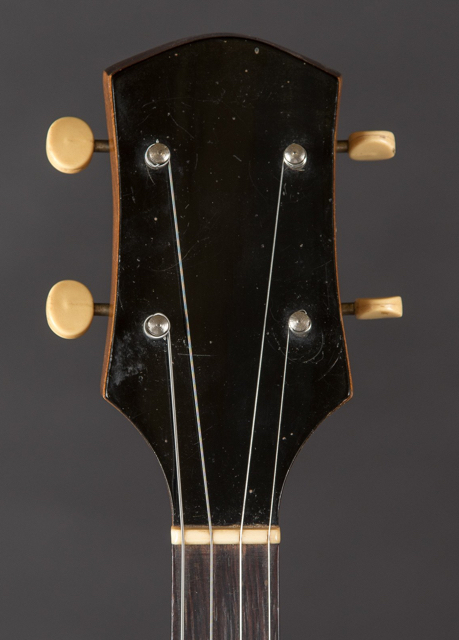 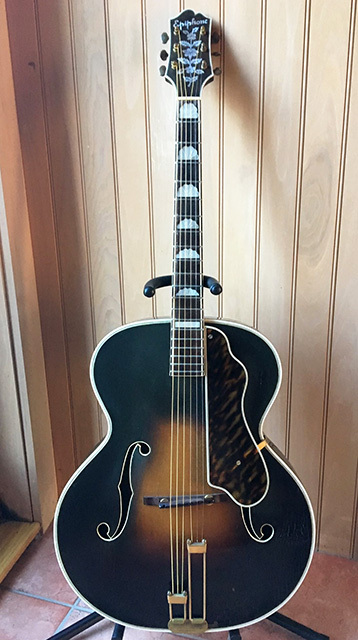 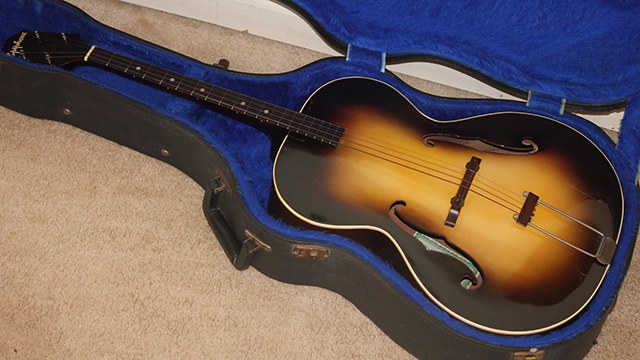 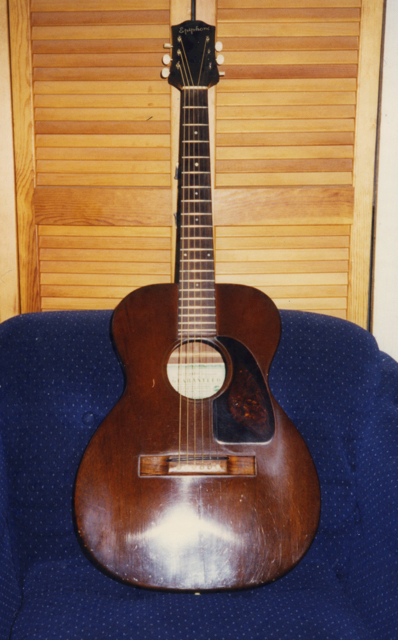 Apparently there were no "blank" examples of green labels (1939-1943) – instead earlier "blank" Masterbilt labels with typed SN were used as replacements during that period. 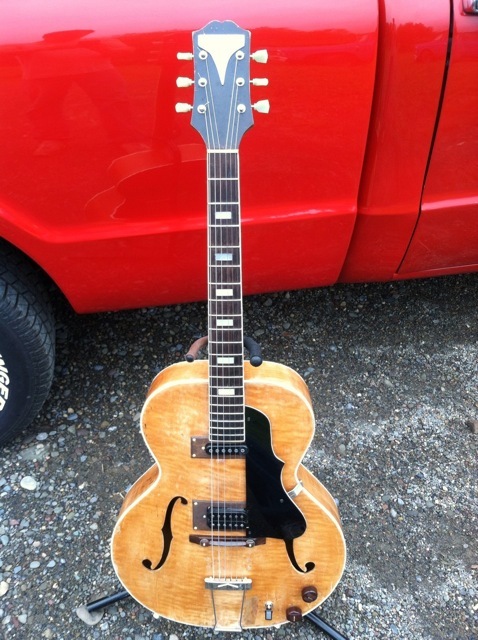 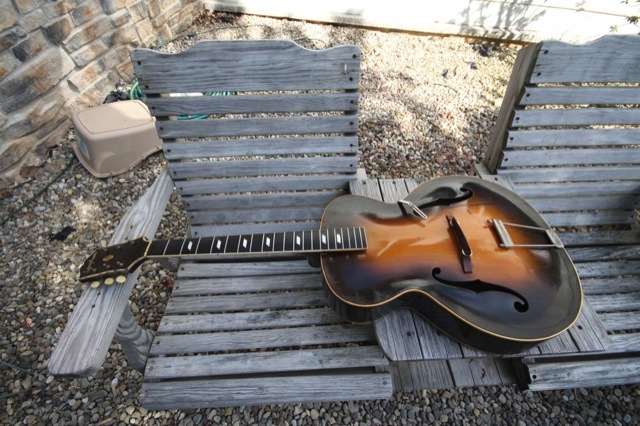 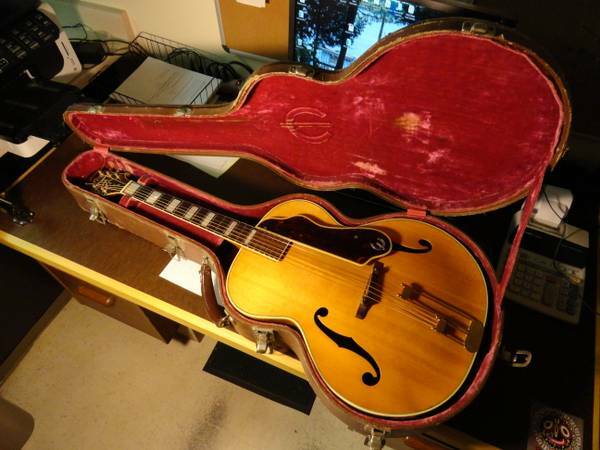 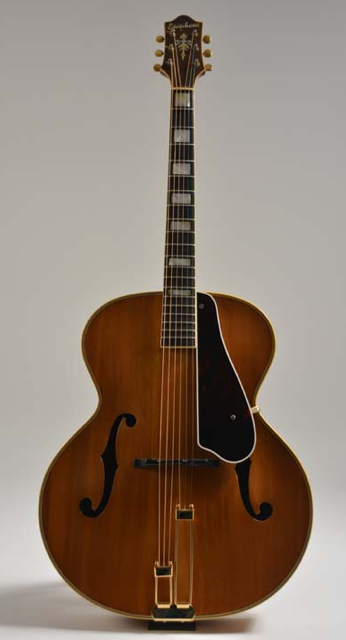 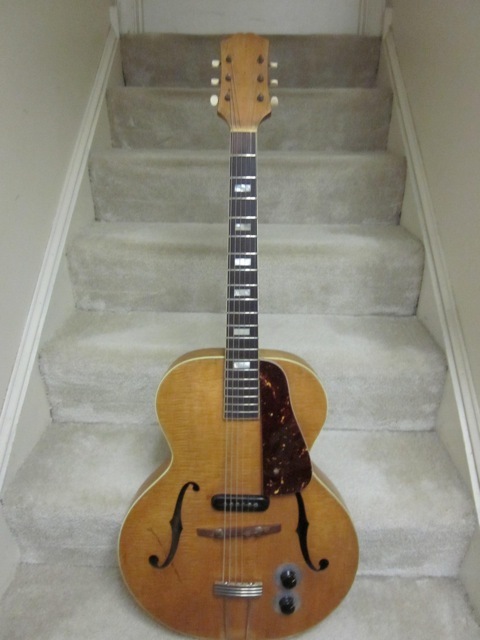 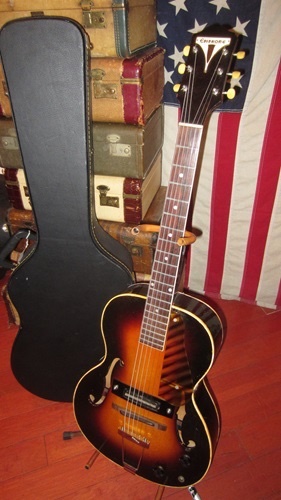 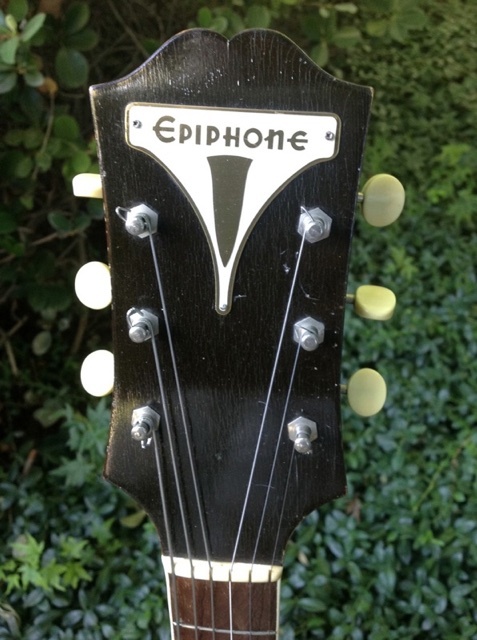 11) Fisch 1996, p69; quoting a letter to dealers dated July 17, 1936: "All EPIPHONE Guitars are now furnished in the new large sizes and greatly enhanced in appearance, representing in many cases a 50% increase in value with no increase in prices." 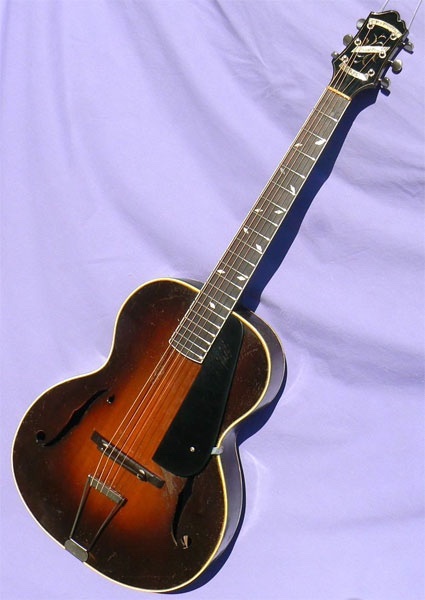 12) Rocco model named after musician Anthony Rocco; Frixo Stathopoulo filed patent March 9, 1938. 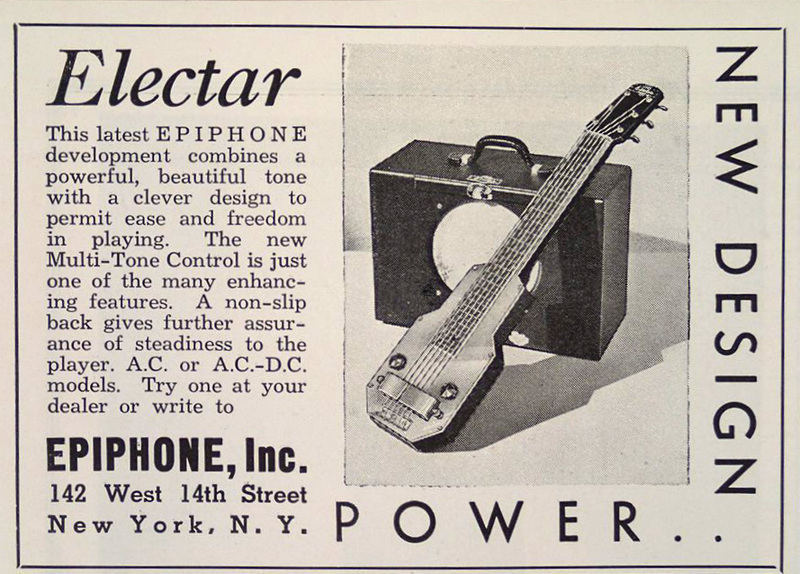 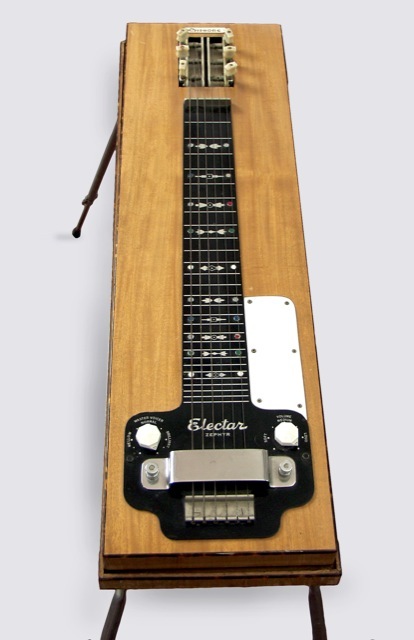 13) See advert "Metronome", July 1936, p28: "Electar New Design" (info: Rod McDonald); Epi Stathopoulo filed a patented design for Model M Hawaiian on June 12, 1937. 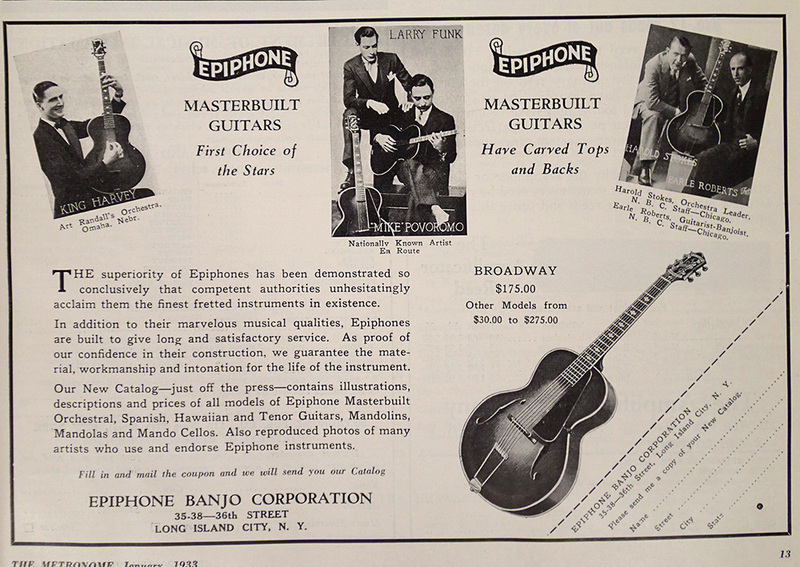 14) Advert "The Music Trades", Dec 1936 (Fisch 1996, p146). 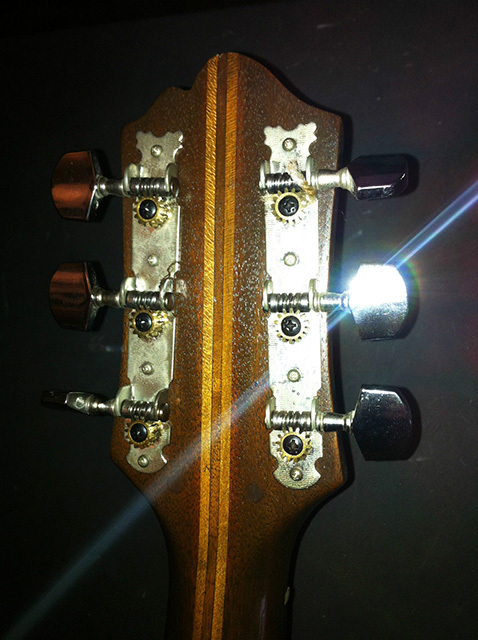 furthermore, some of the artists' photos were changed. 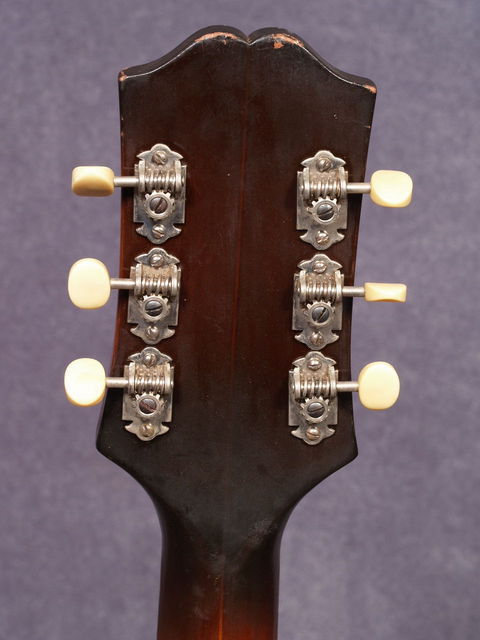 This catalog was likely published before fall 1937 (note: no reference to Frequensator tailpiece or adjustable neck reinforcement yet). 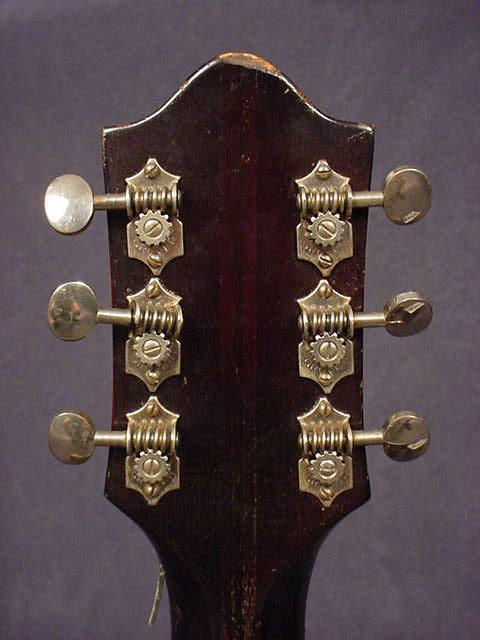 The 1937 flyer used the same images; the Spartan model now described with "carved back". 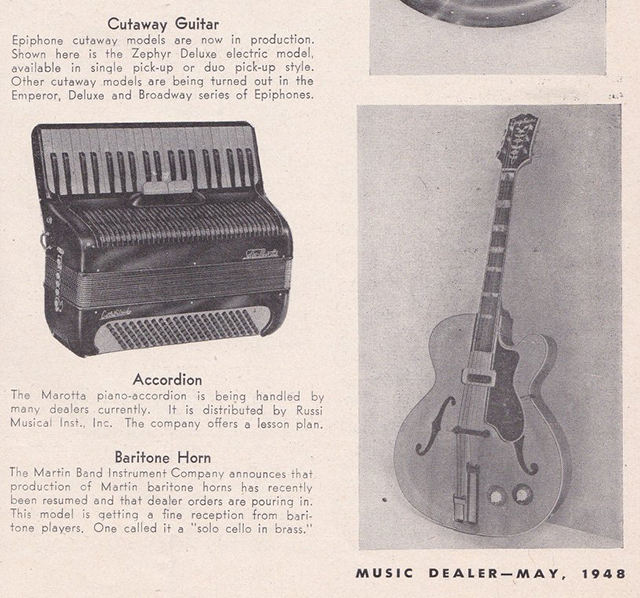 16) See advert "Down beat", Sept 1937, p37; Frequensator prototype pictured in advert "Down beat", July 1936, on Tom Morgan's DeLuxe (source: Fisch 1996, p188/p74); Herb Sunshine filed patent June 12, 1937; see also Fisch 1996, p71f. 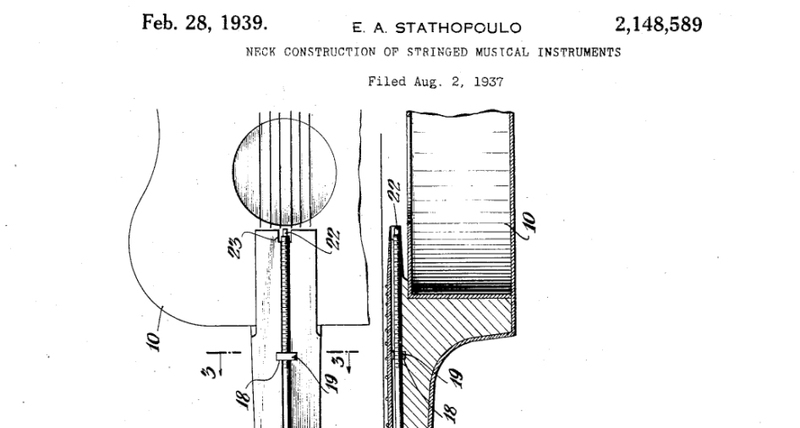 17) Epi Stathopoulo filed patent Aug 2, 1937; Fisch 1996, p75. 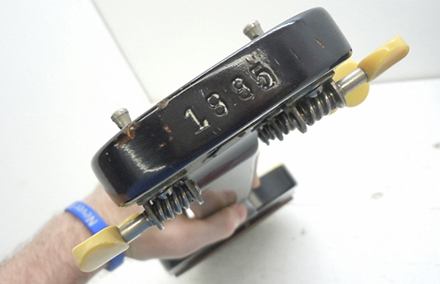 18) Herb Sunshine filed patent Nov 10, 1937; Fisch 1996, p109f; initially named "TruBalance" pickup (see note 21), renamed to "Master" pickup in the 1939 catalog. 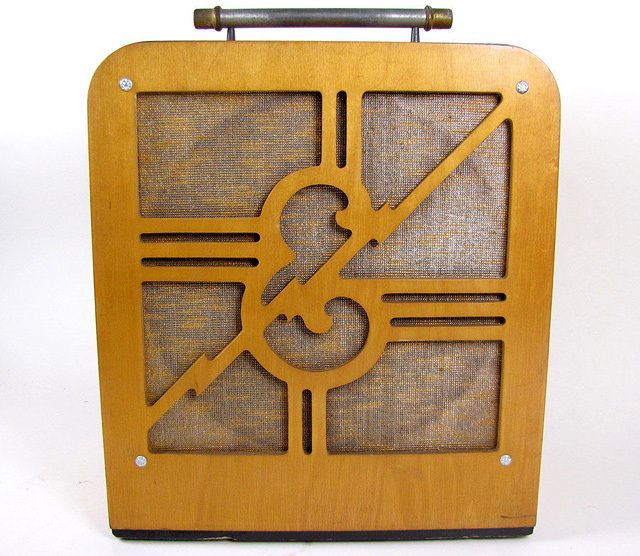 19) "Rhythm Control" announced in a letter to dealers June 29, 1937 (Fisch 1996, p117). 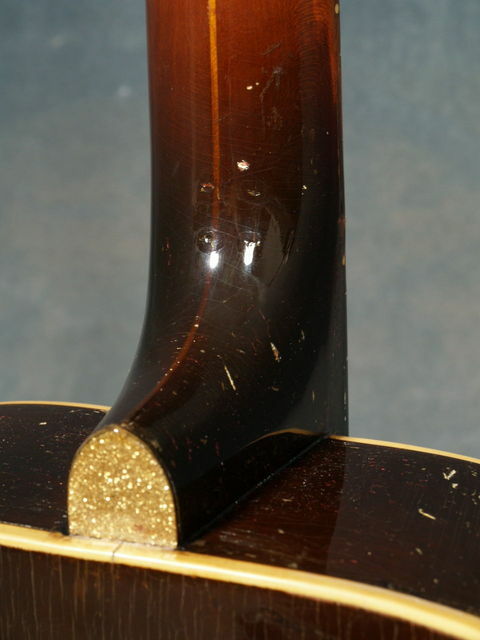 20) Fisch 1996, p105. 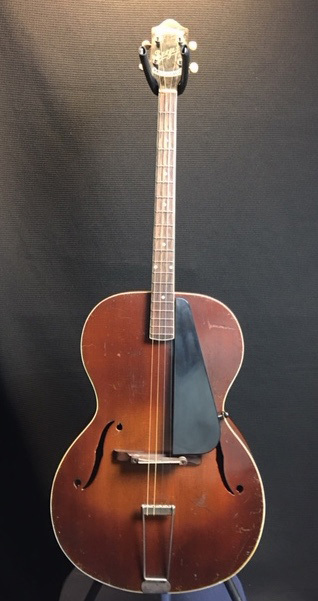 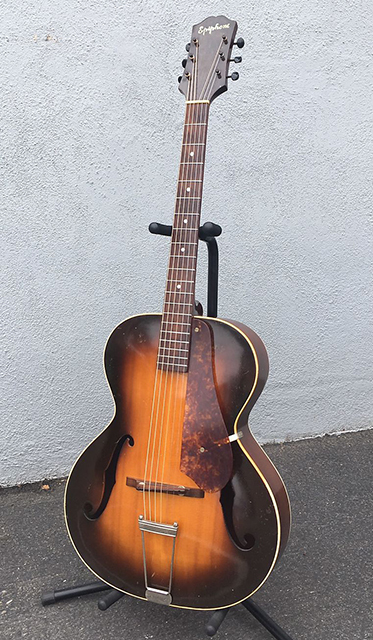 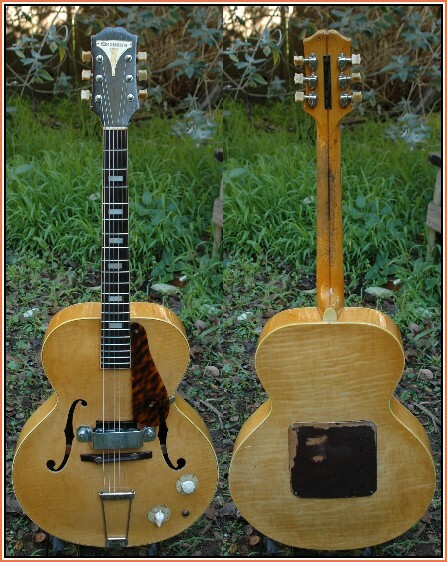 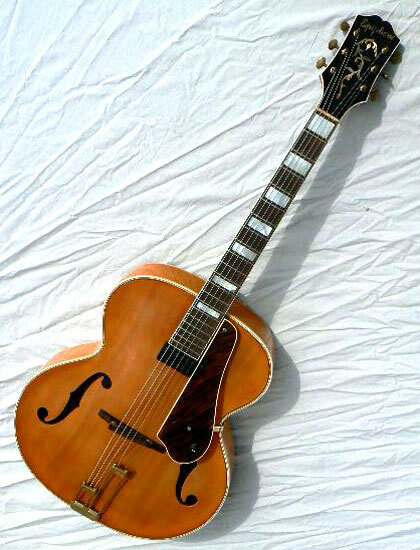 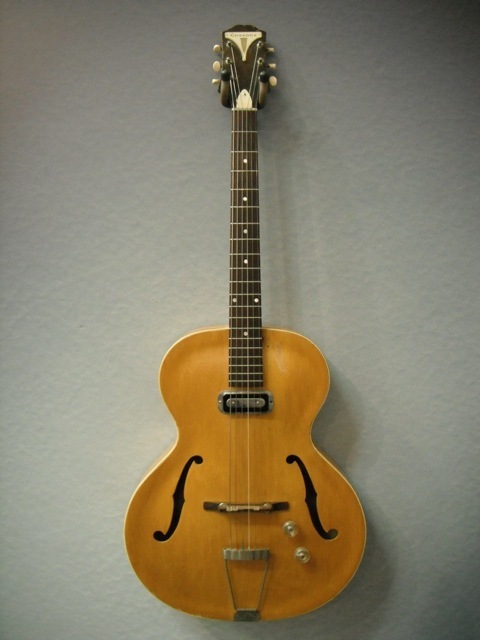 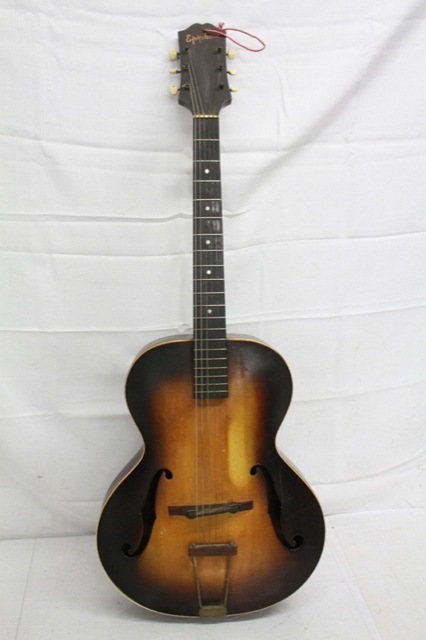 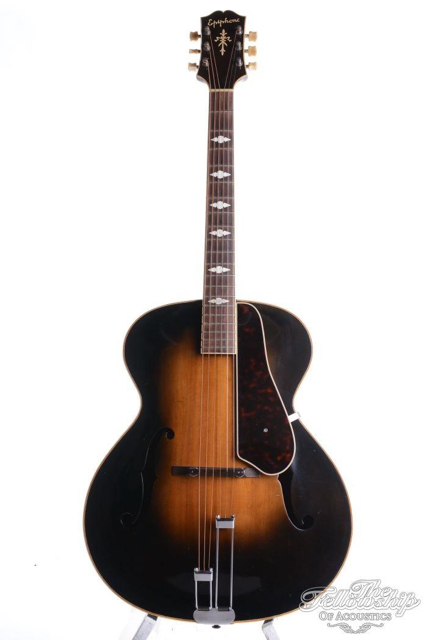 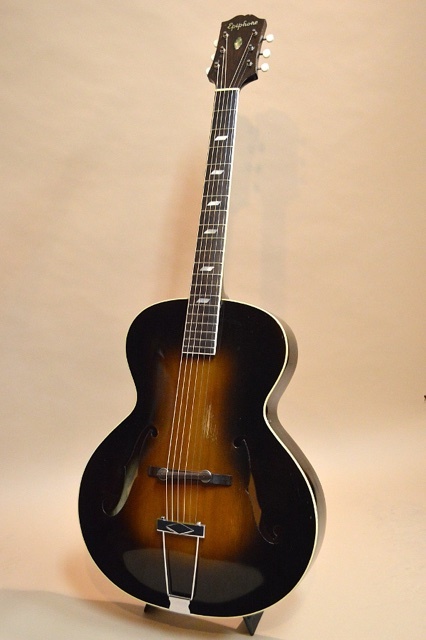 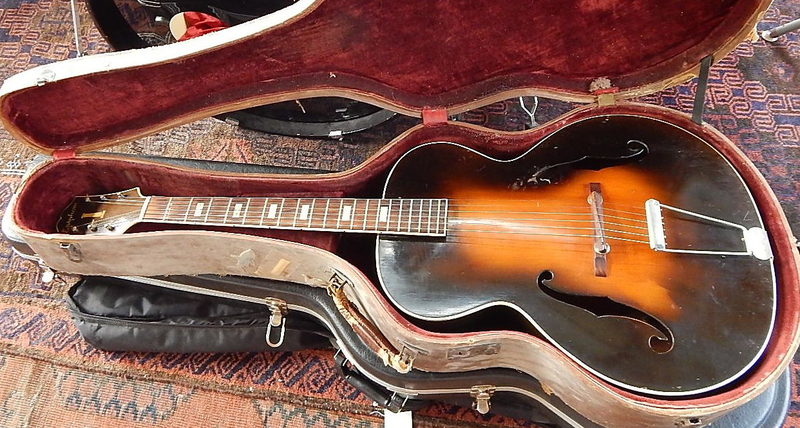 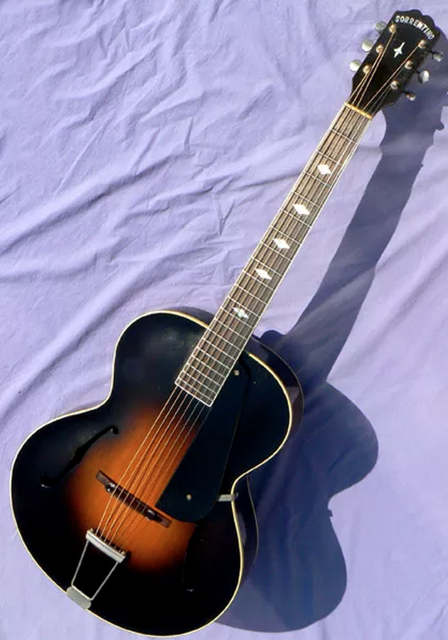 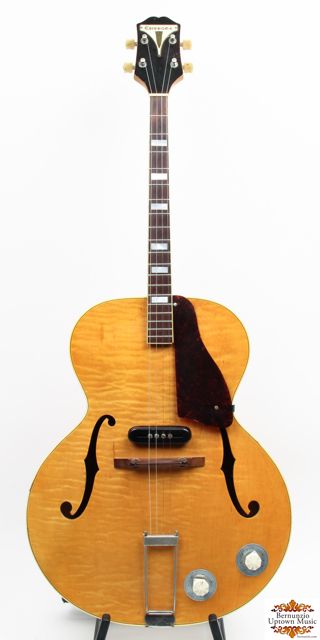 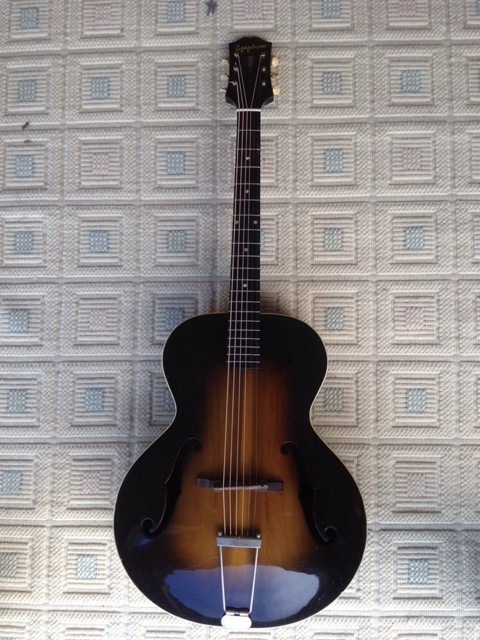 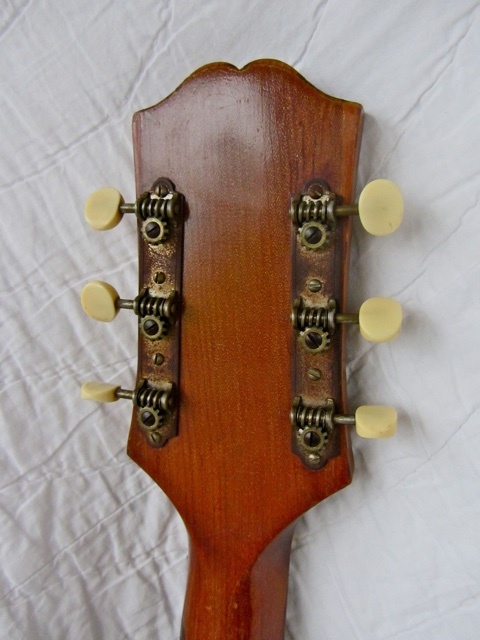 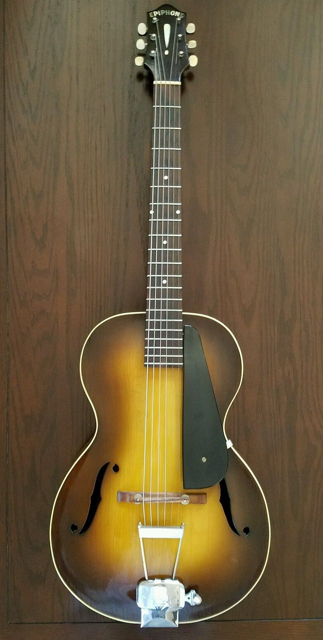 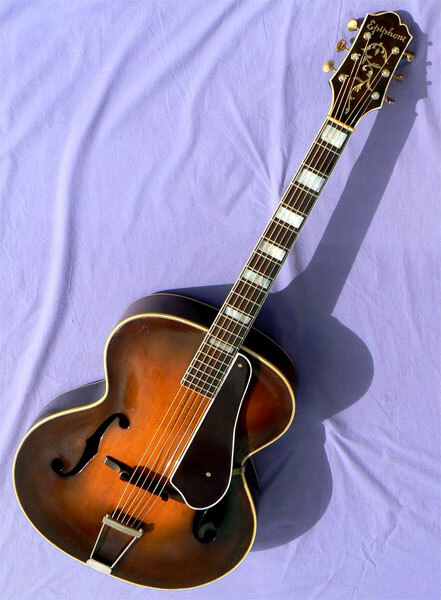 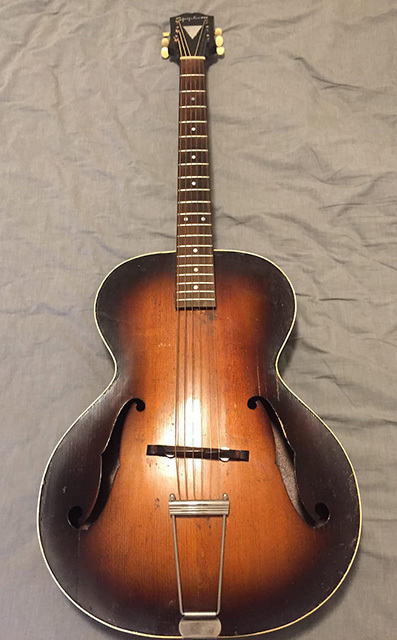 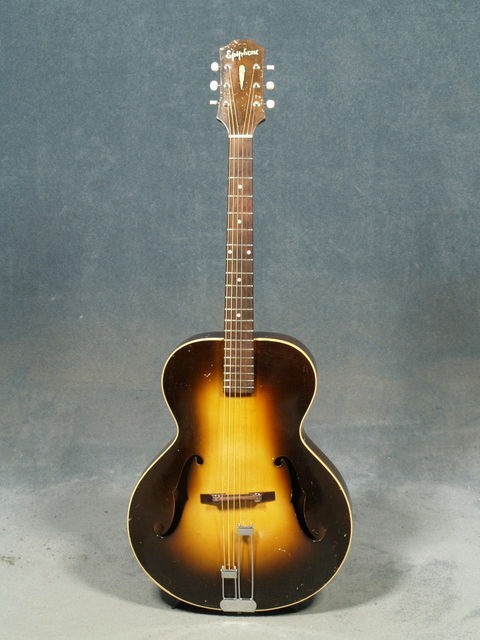 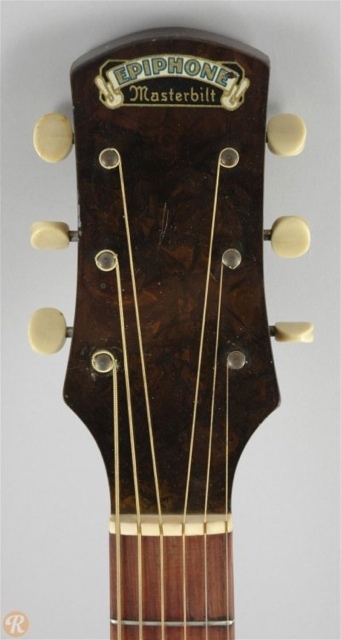 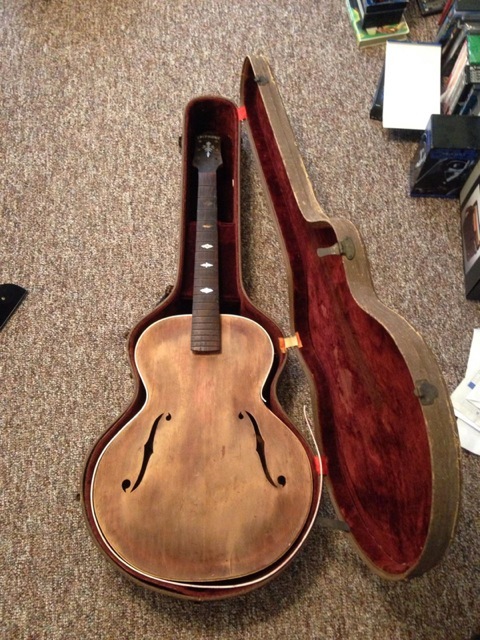 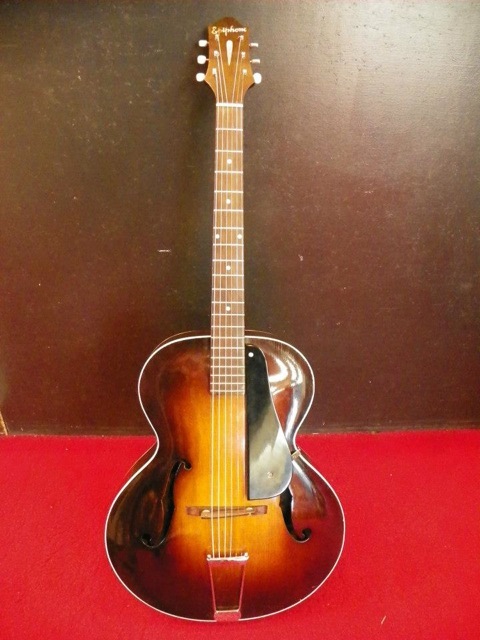 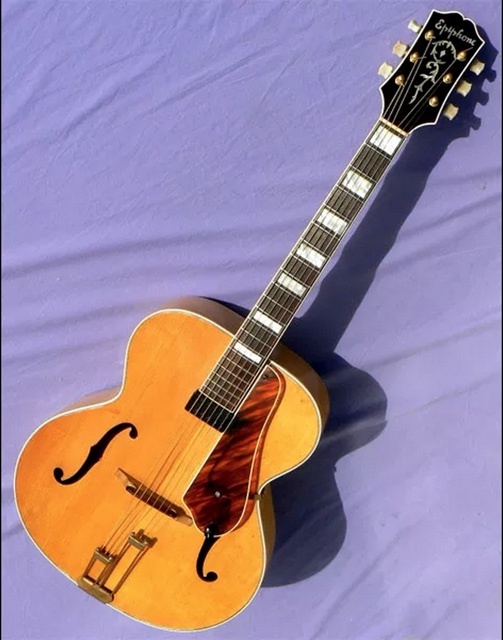 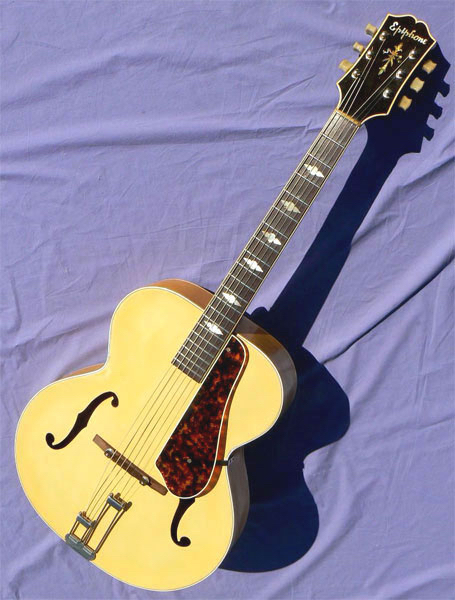 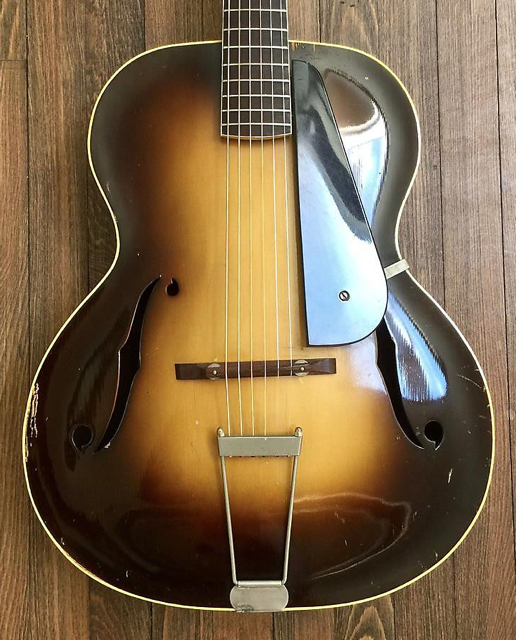 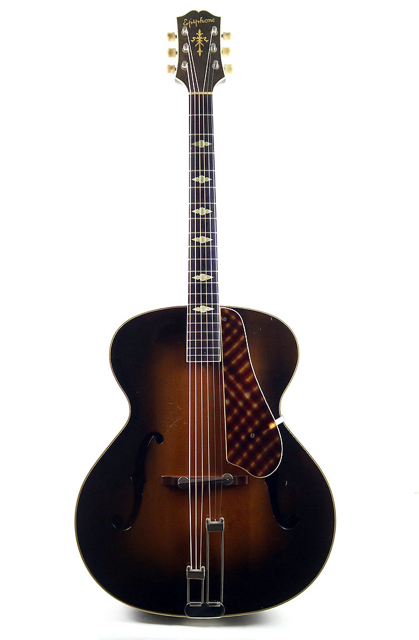 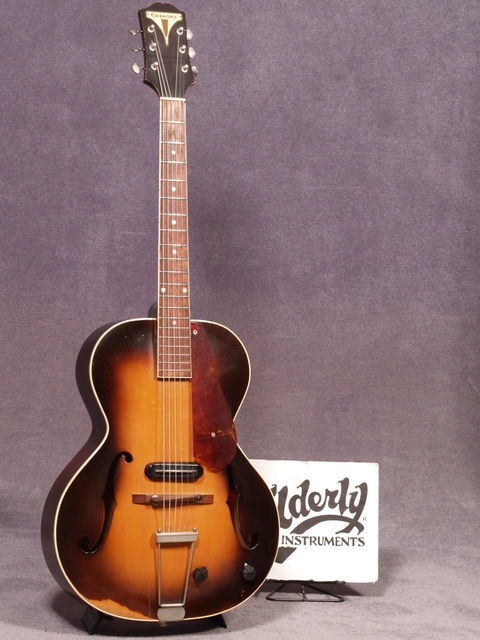 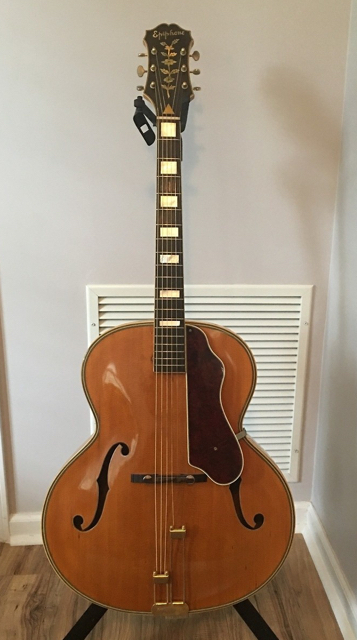 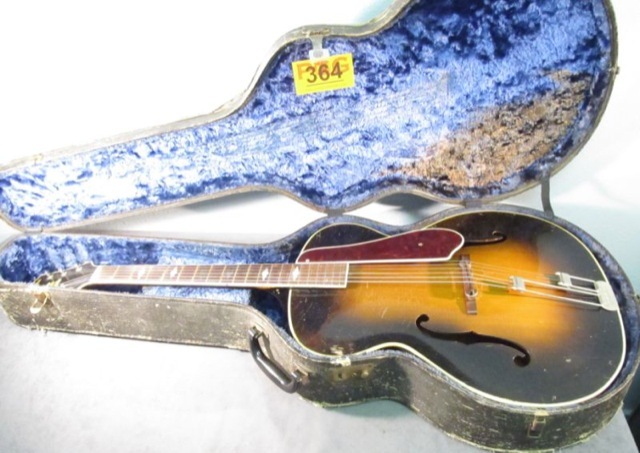 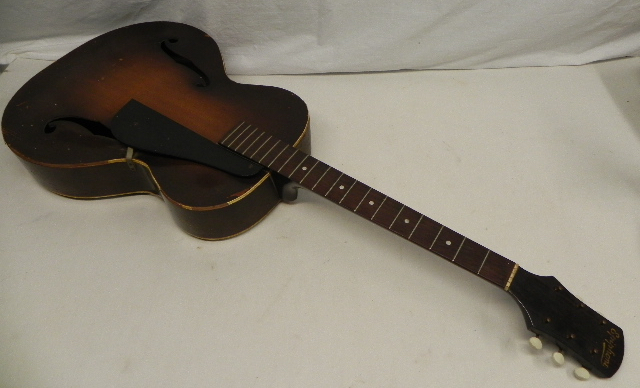 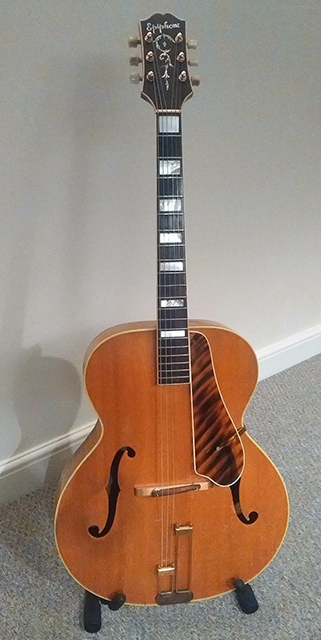 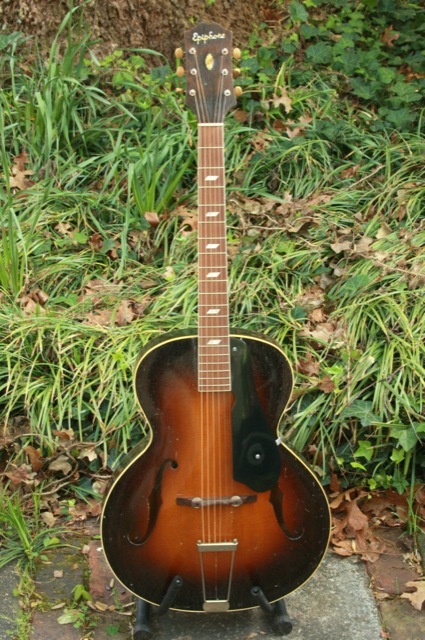 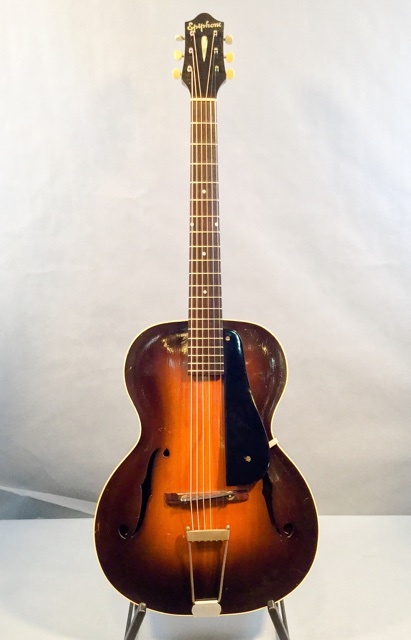 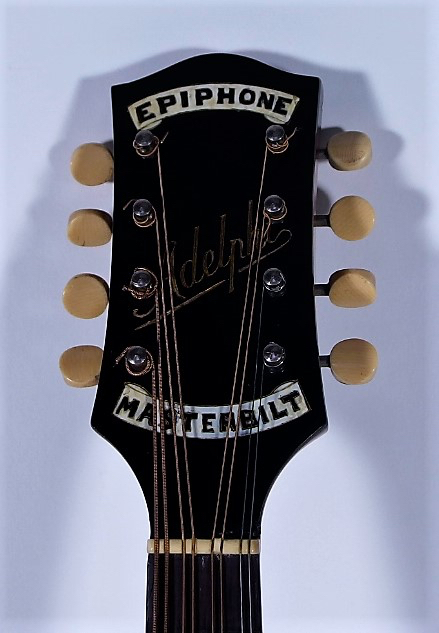 The catalog "Orchestral Guitars" by Selmer of London, 1939, p5, features this model as "Epiphone 8", obviously referring to its price of £8/8-. 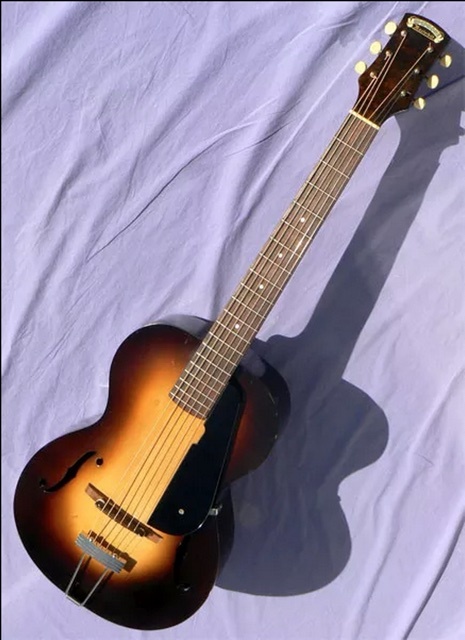 21) Excerpts of 1937 flyer reproduced in Fisch 1996: Model C Spanish (p117); Model M Hawaiian (p133); Model M Mandolin, "TruBalance" pickup with adjustable poles, no handrest, no soundholes (p179). 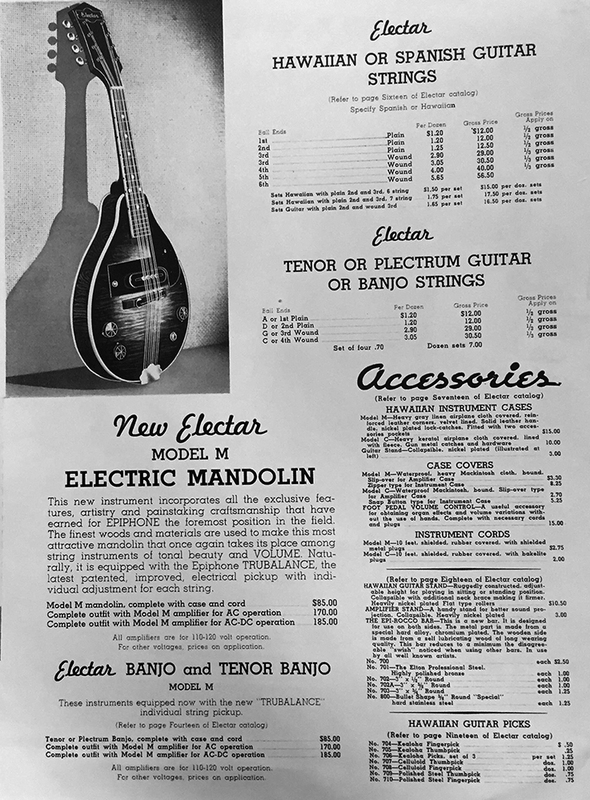 In an updated version of the 1937 "Electar" catalog, on p13 the Model M mandolin was added by stamp. 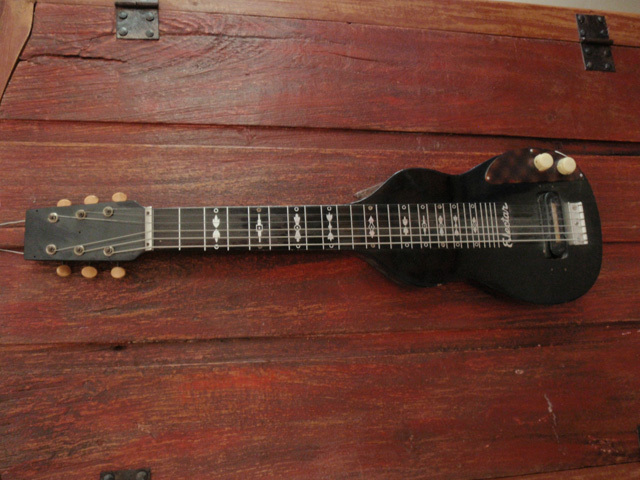 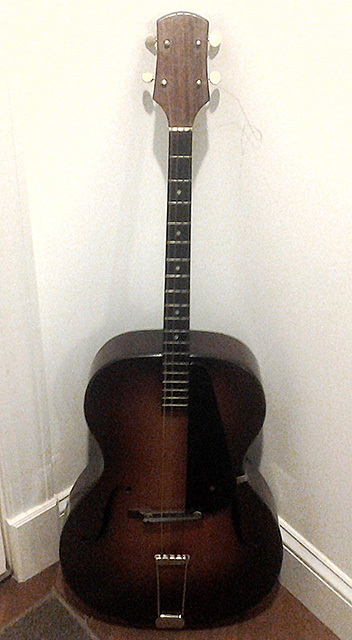 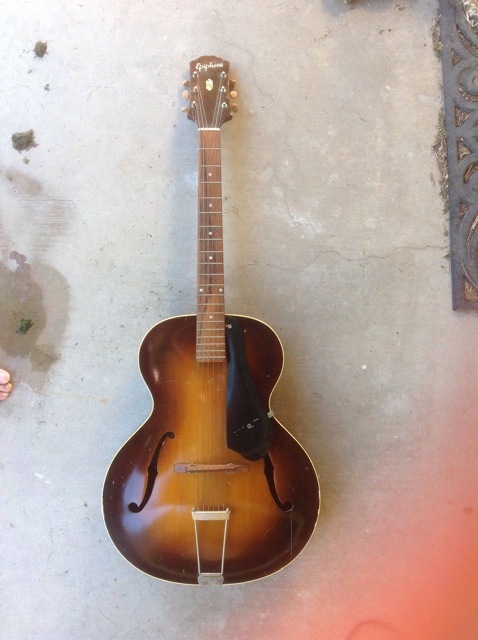 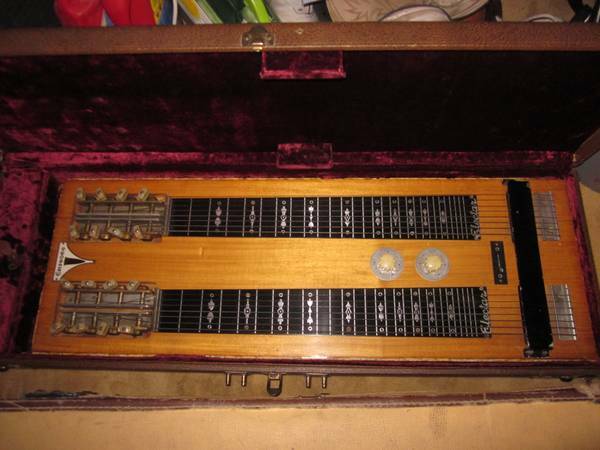 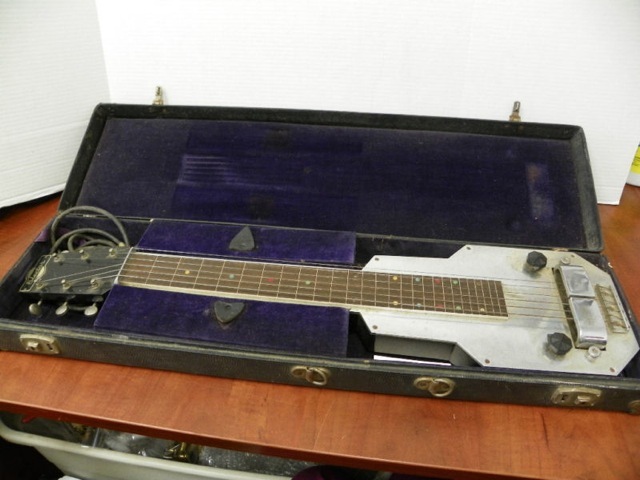 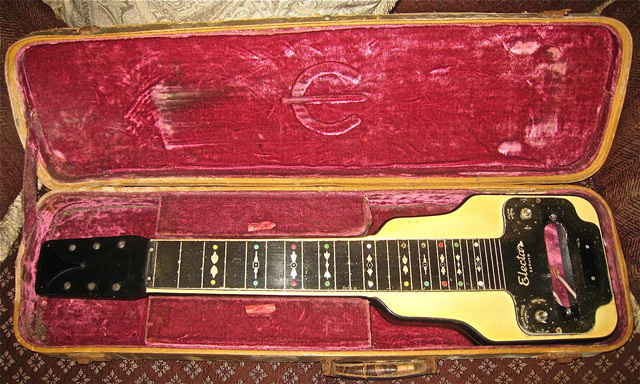 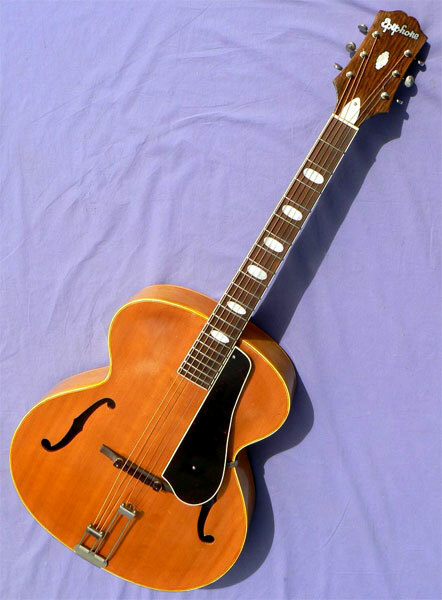 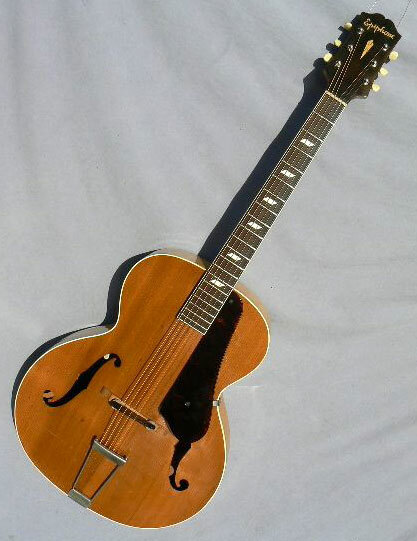 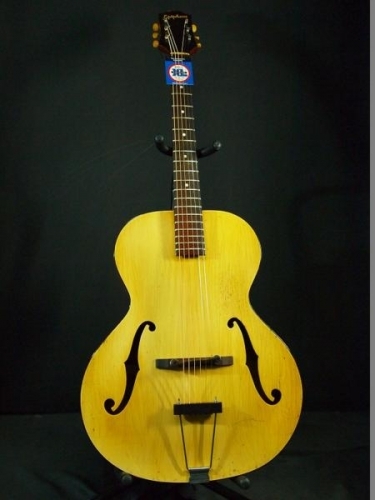 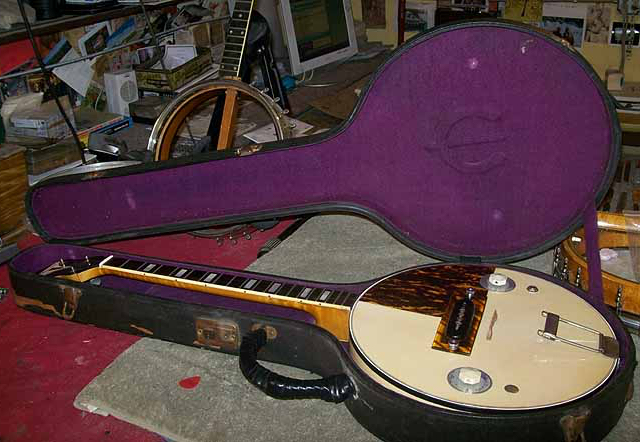 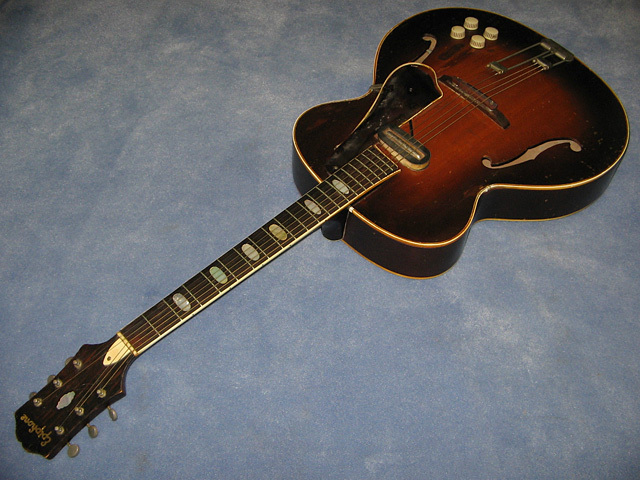 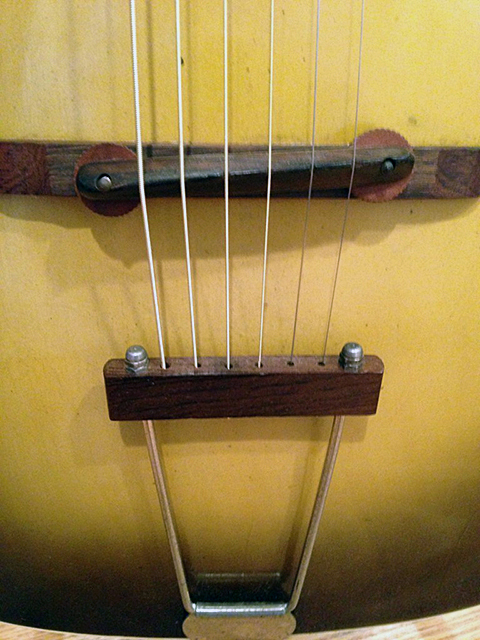 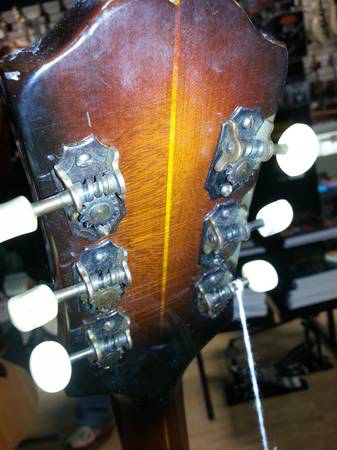 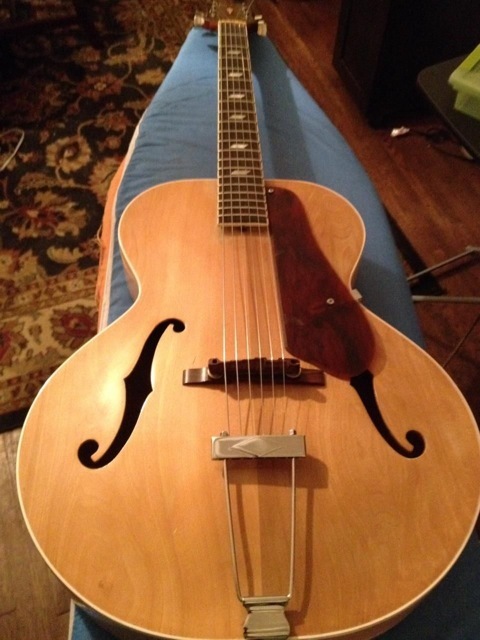 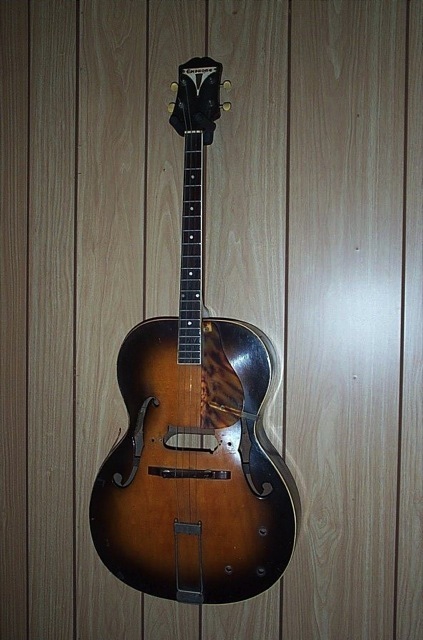 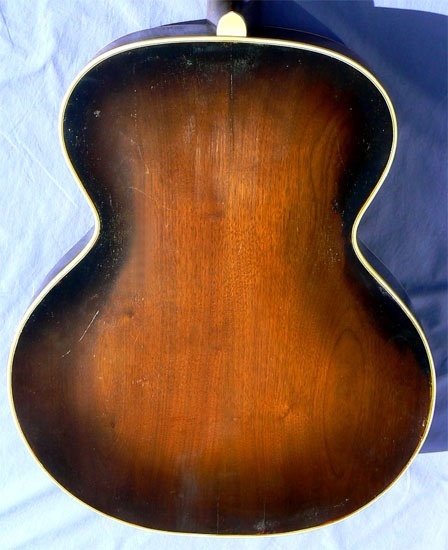 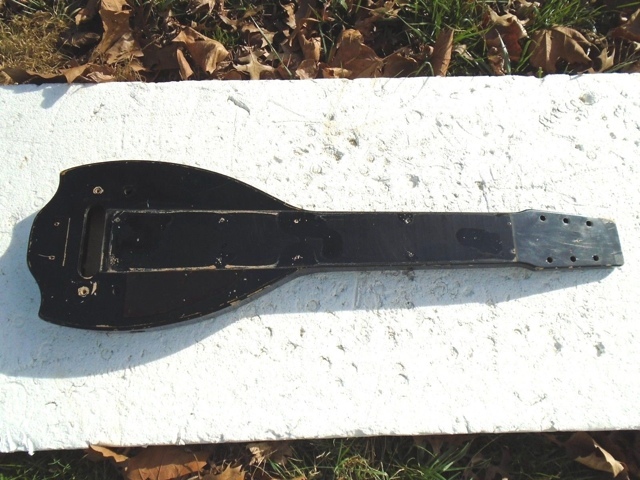 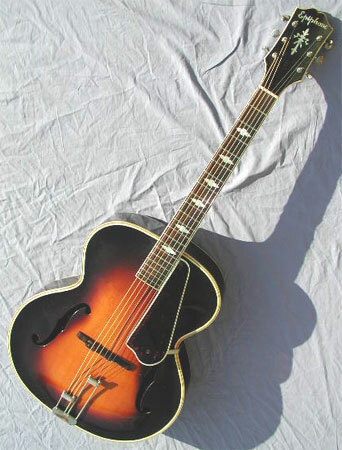 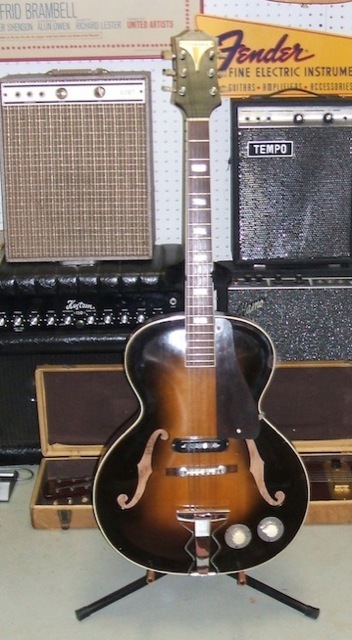 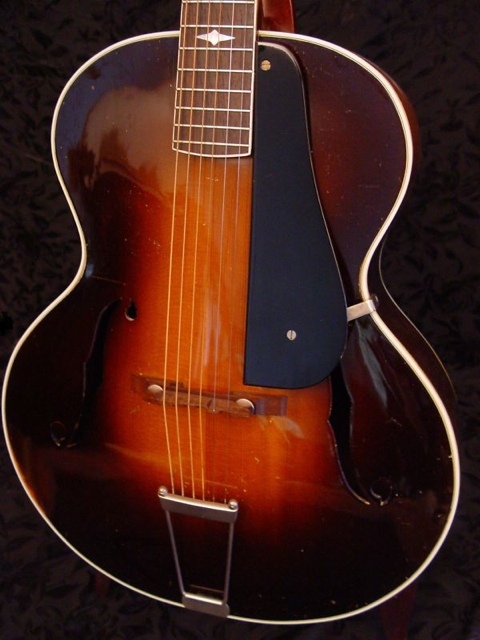 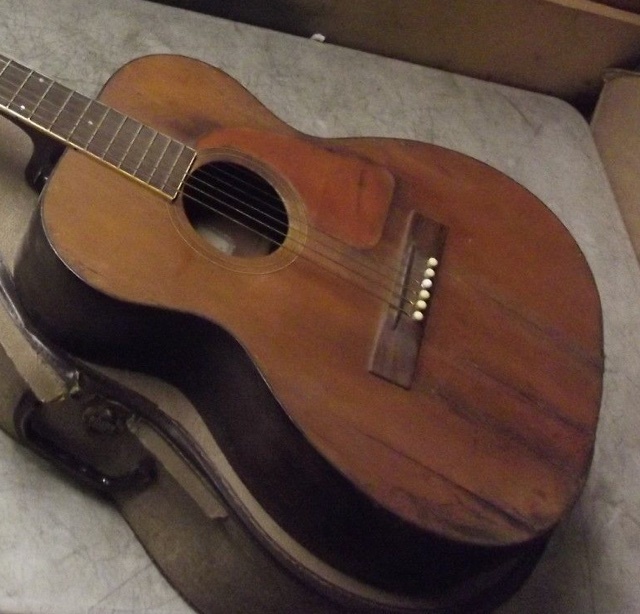 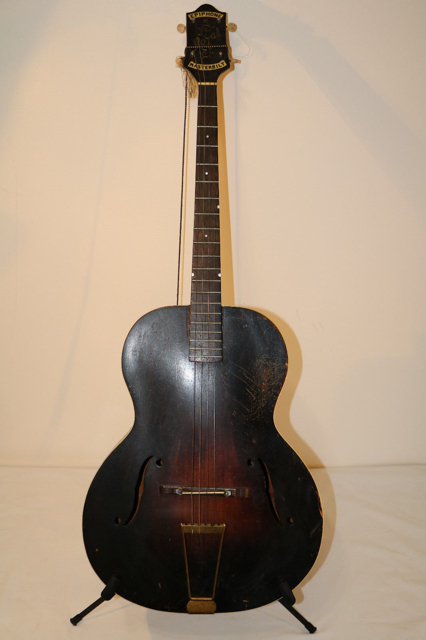 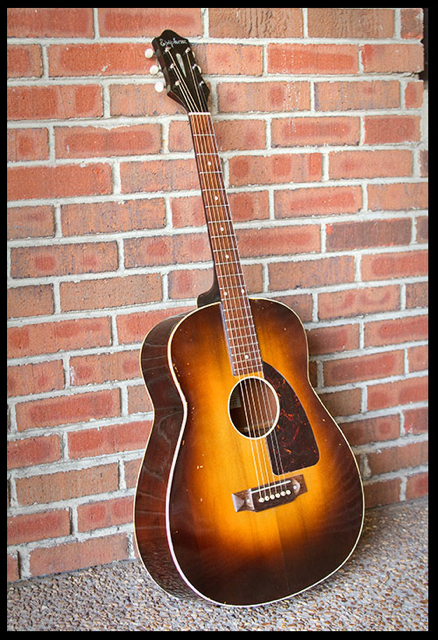 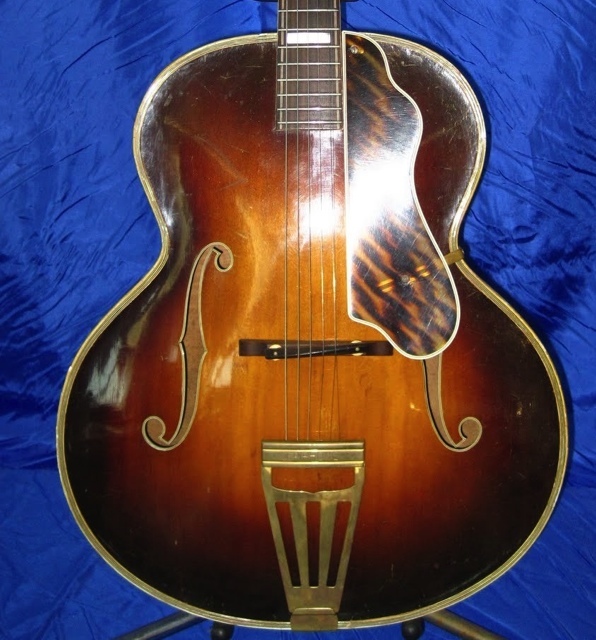 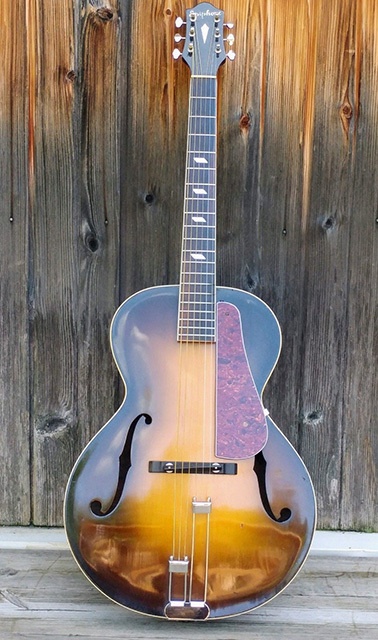 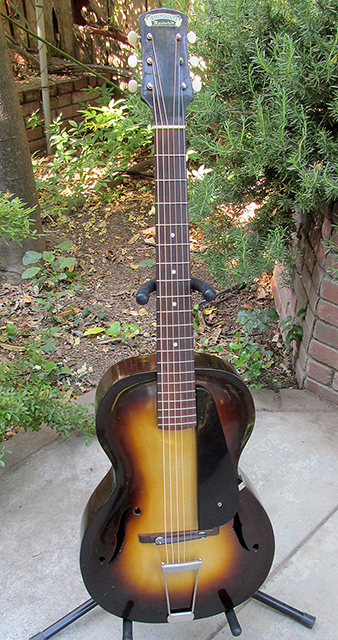 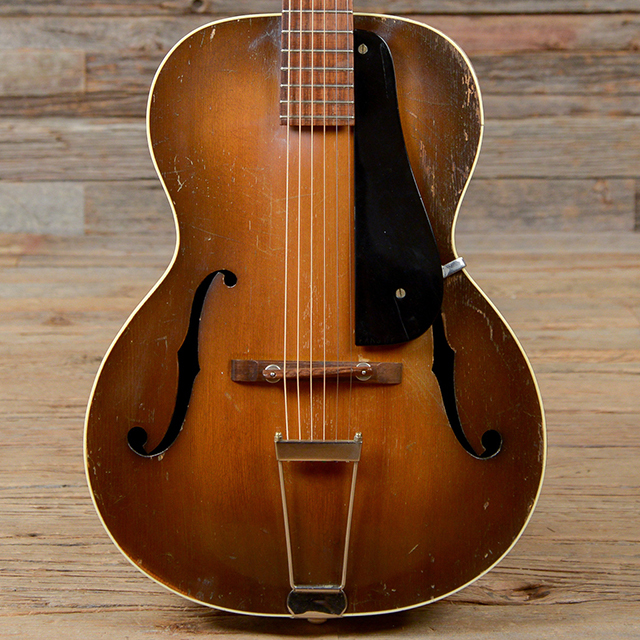 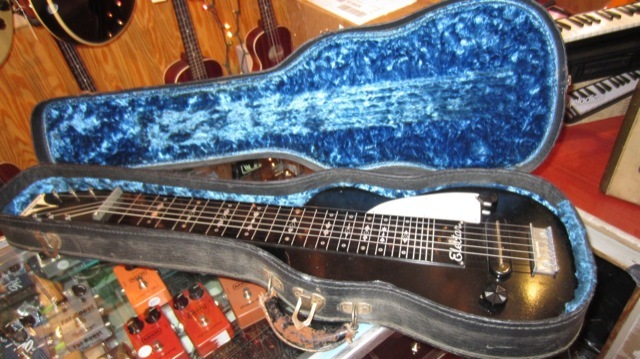 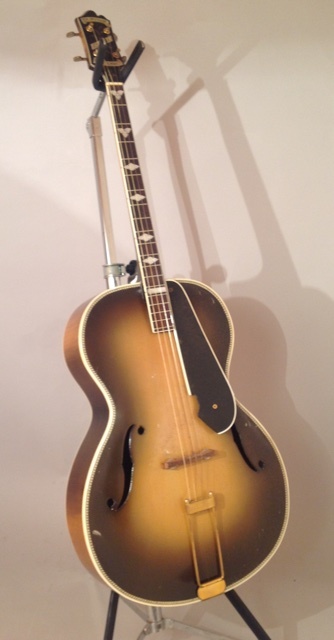 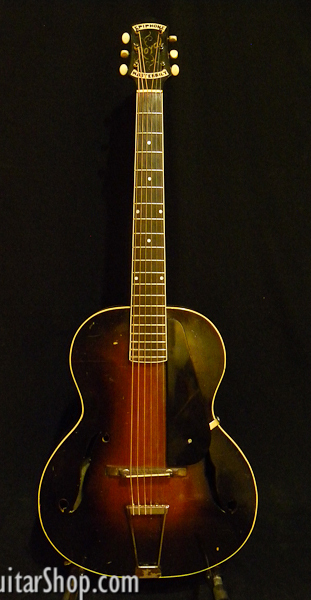 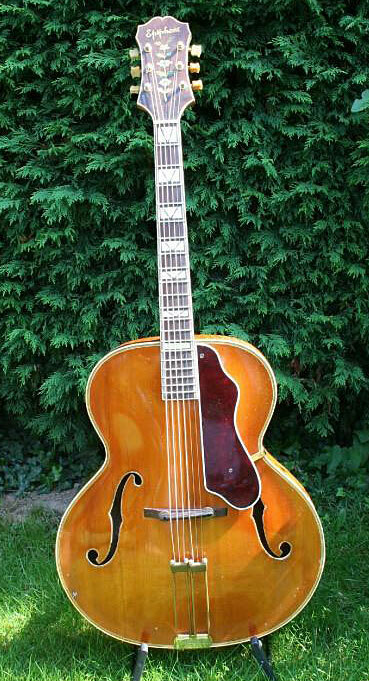 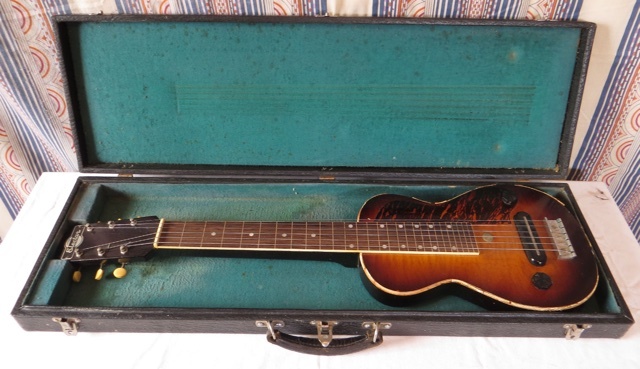 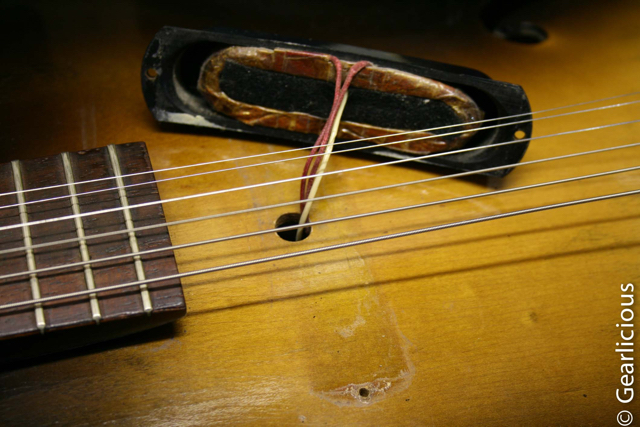 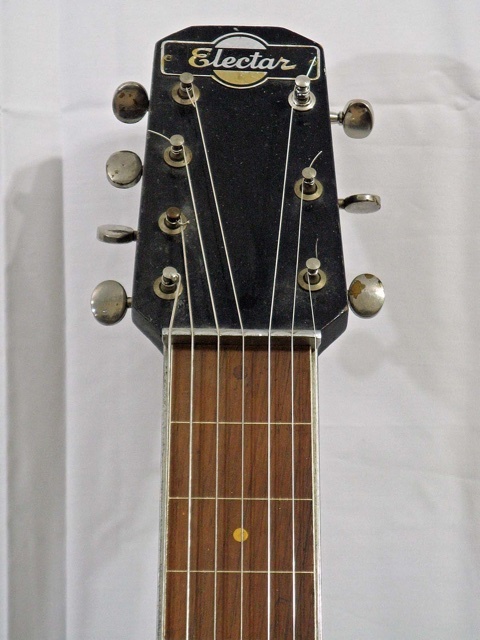 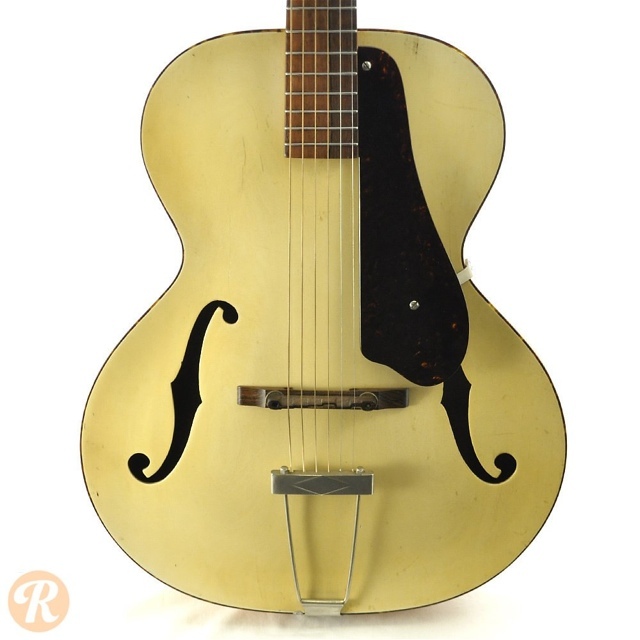 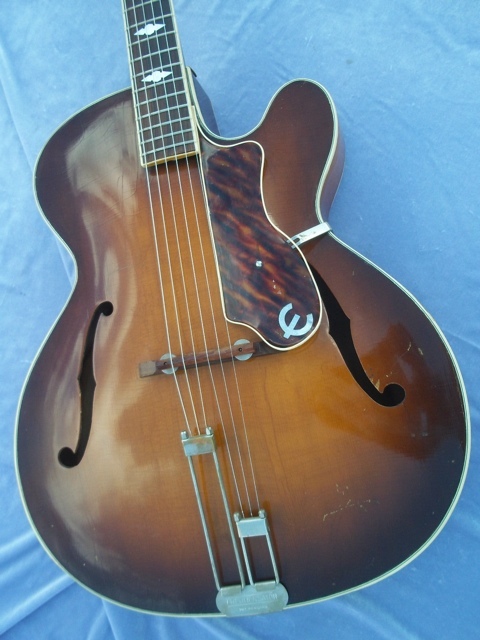 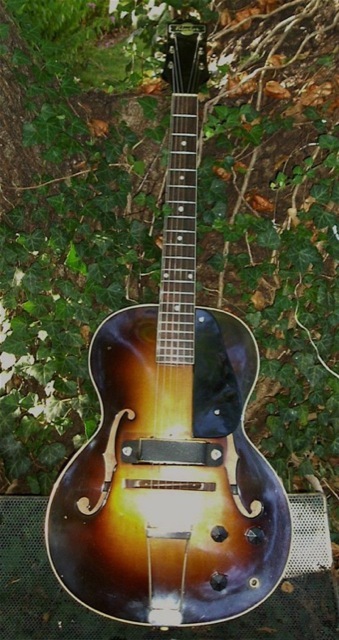 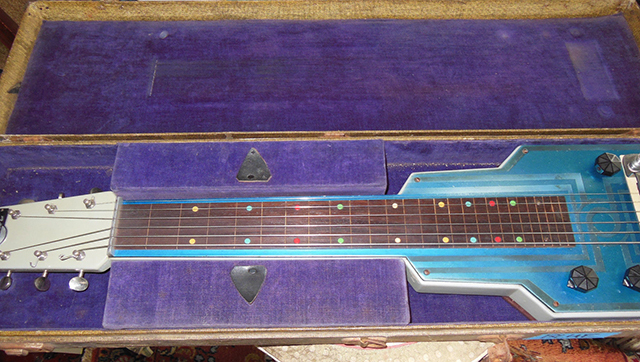 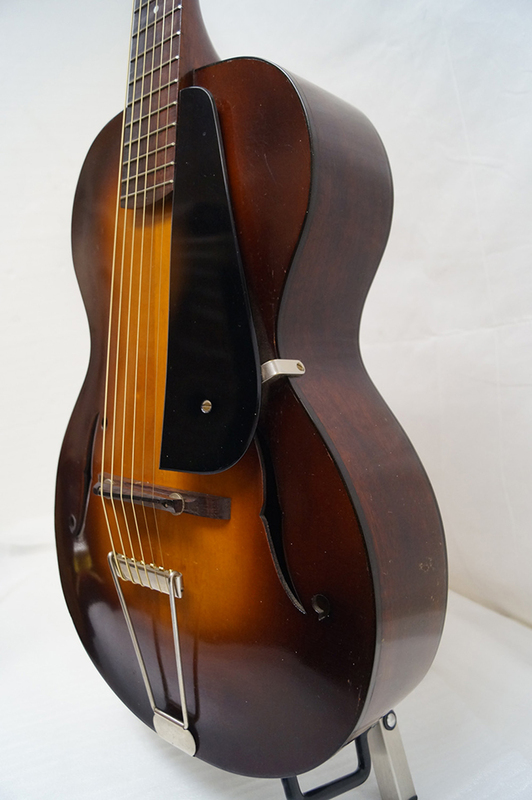 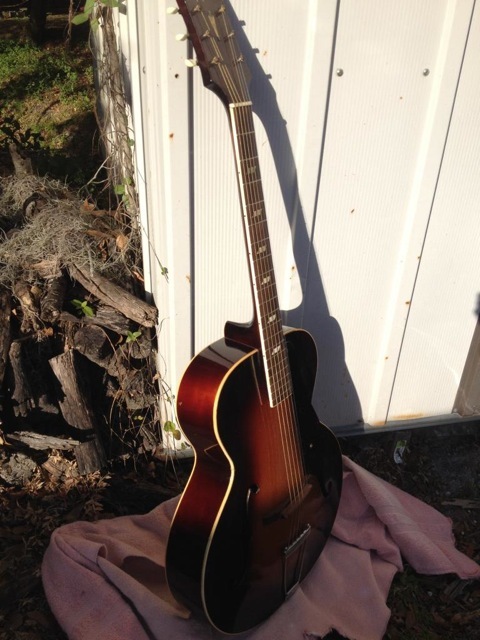 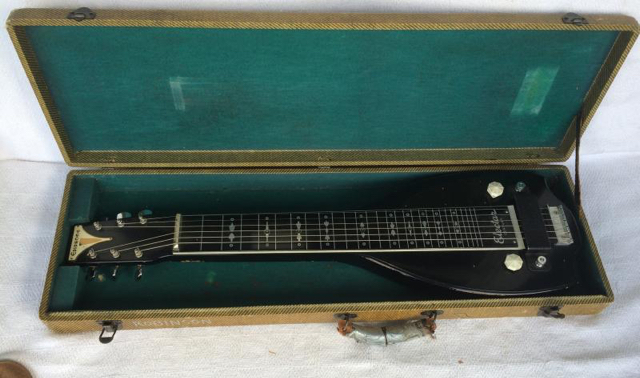 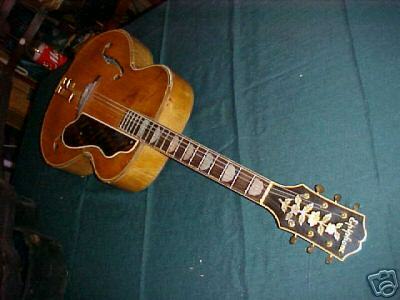 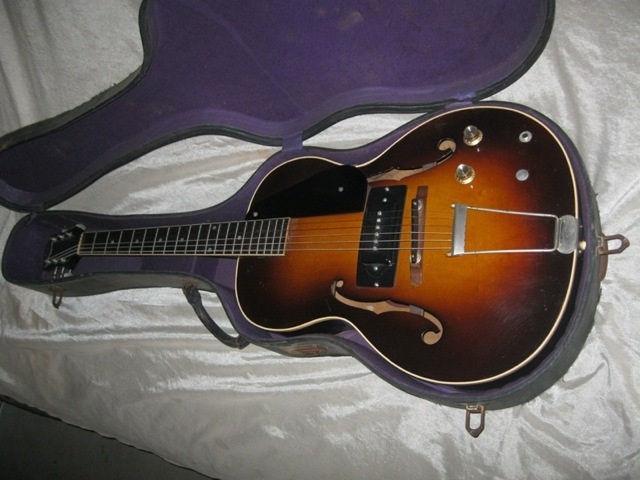 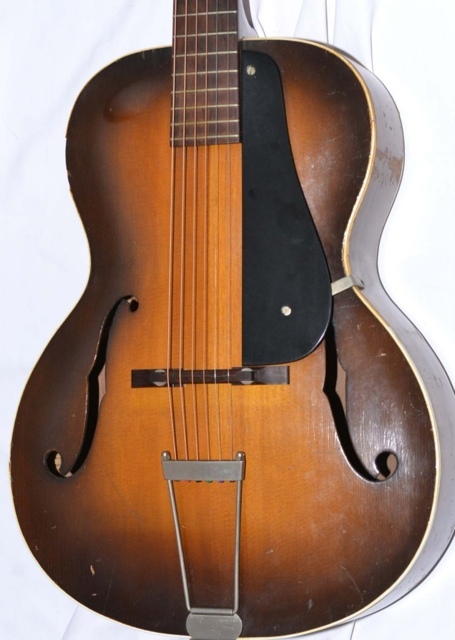 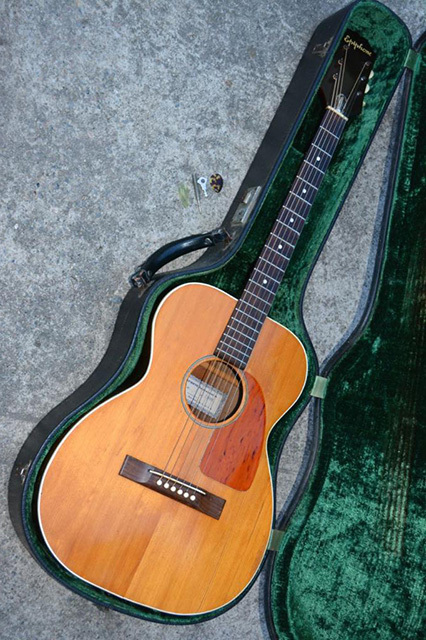 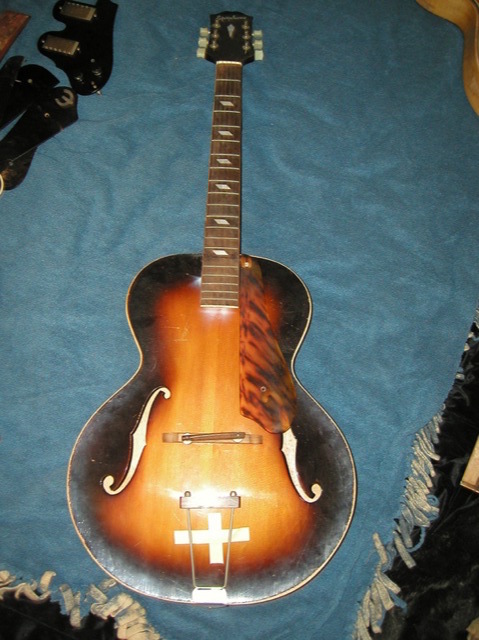 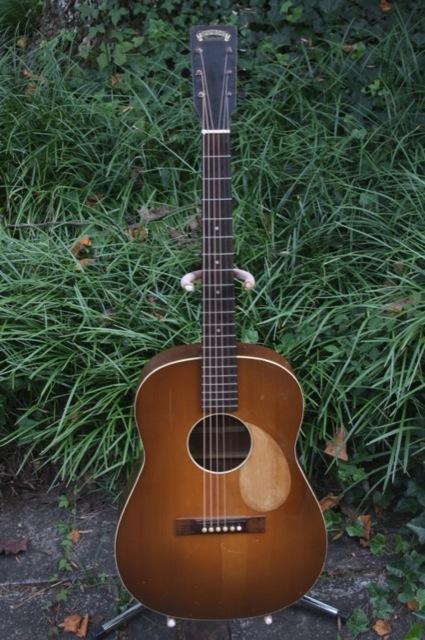 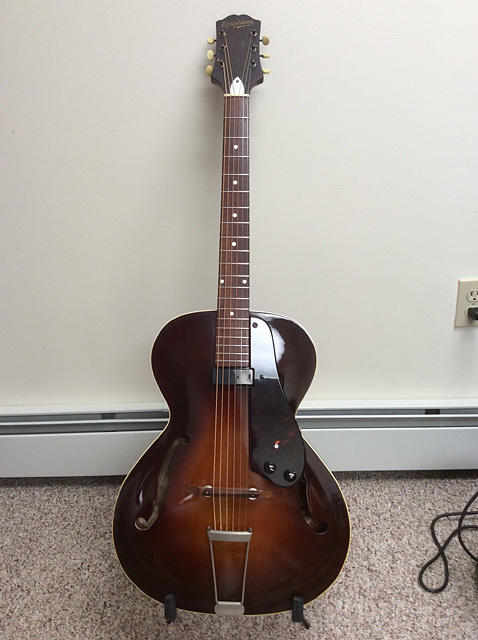 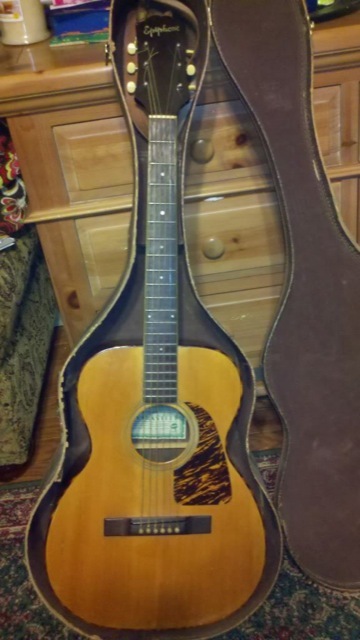 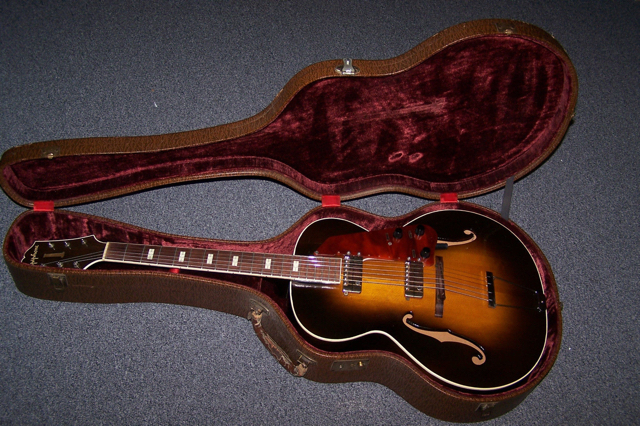 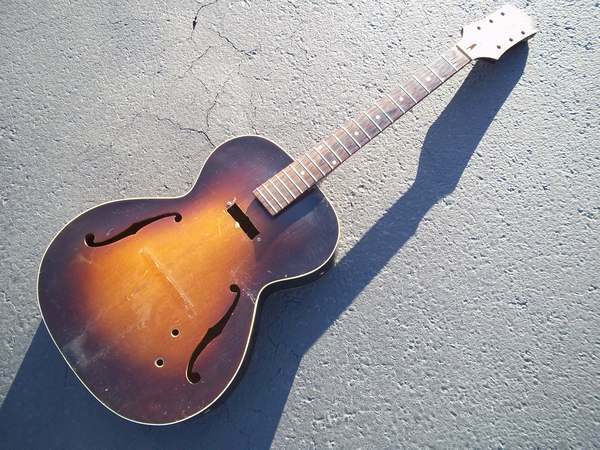 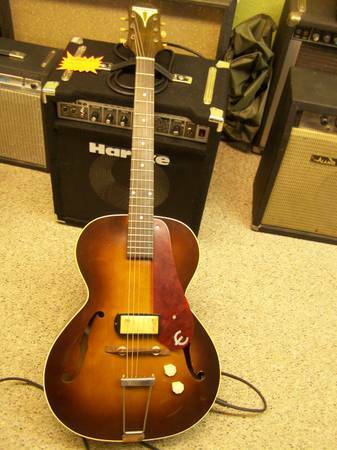 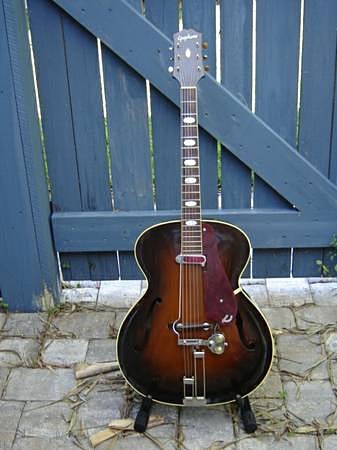 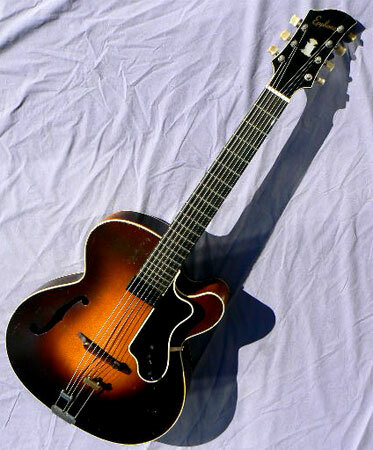 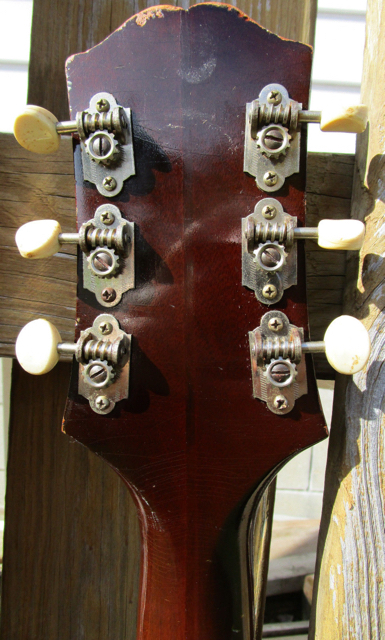 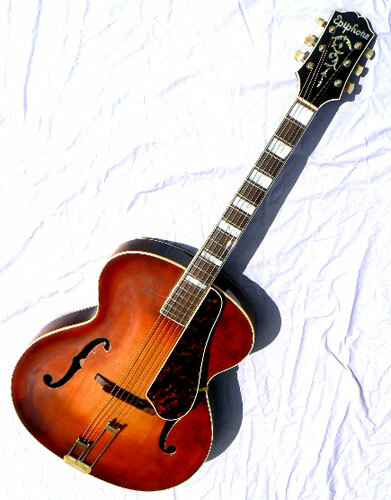 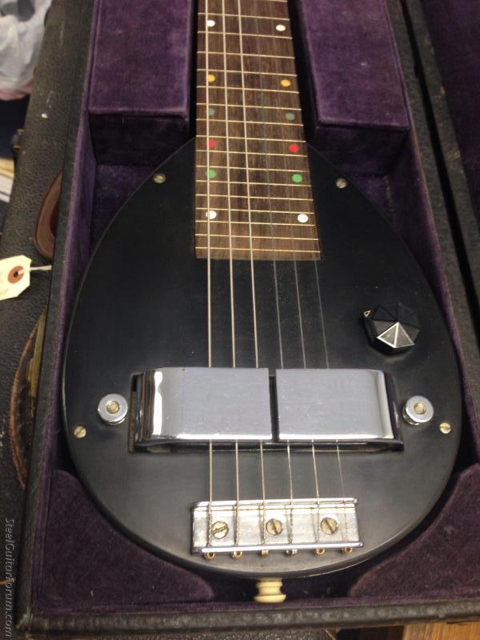 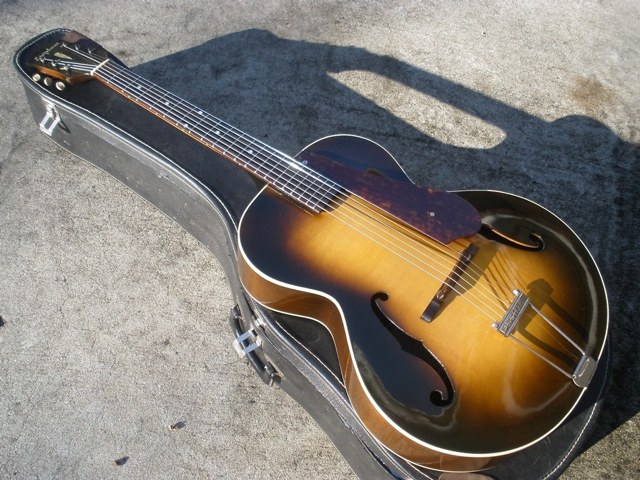 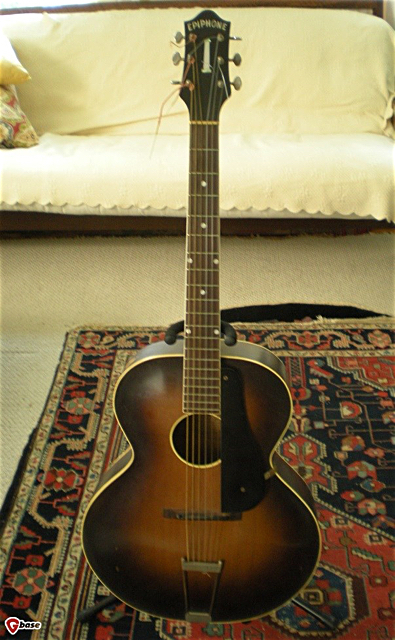 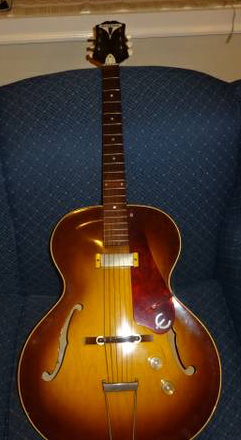 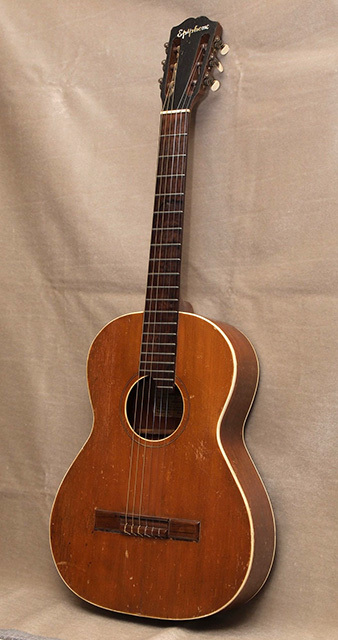 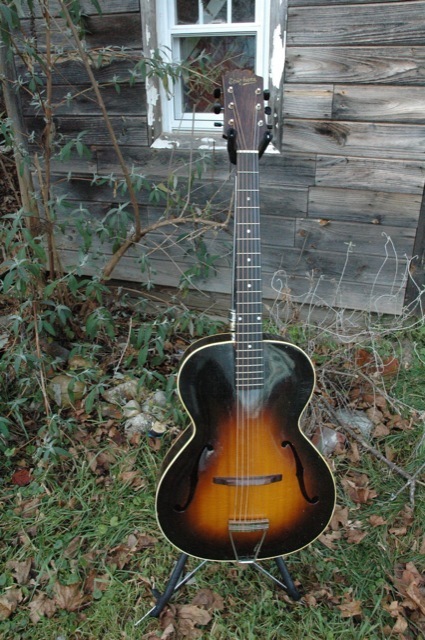 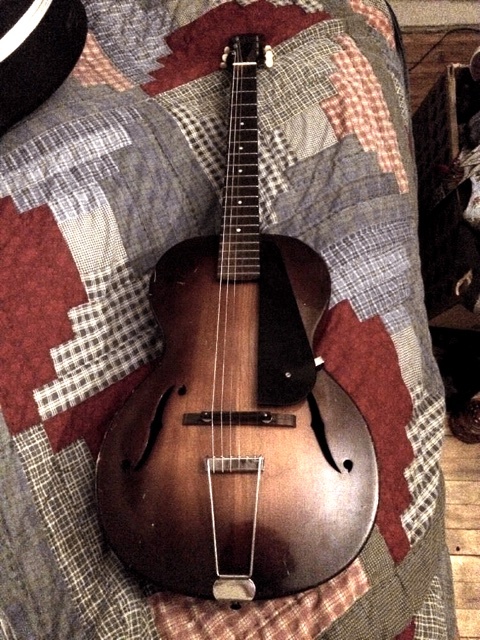 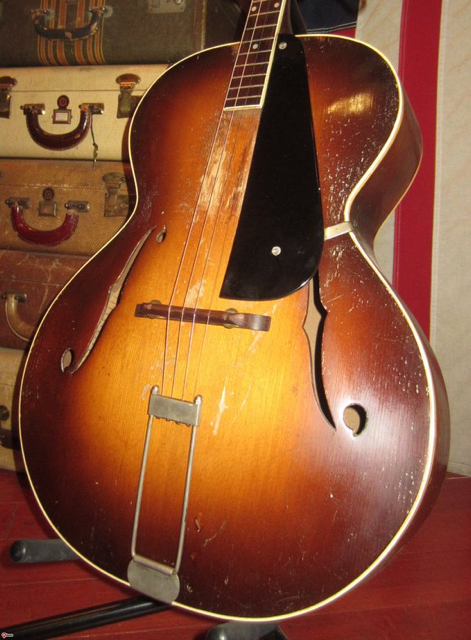 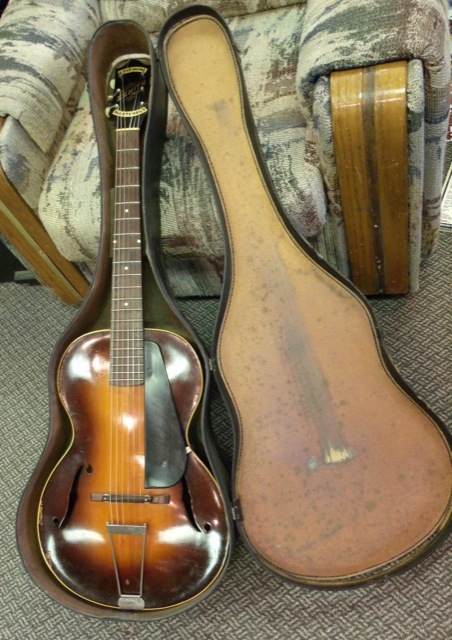 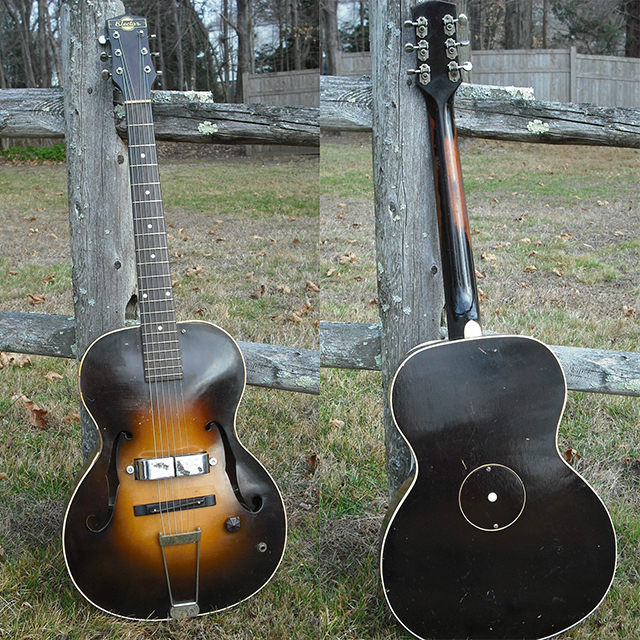 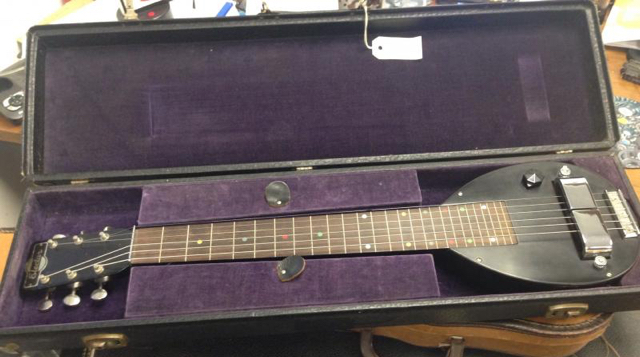 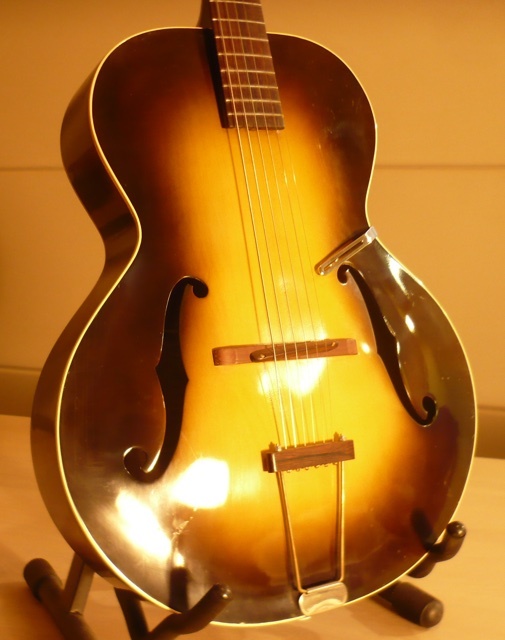 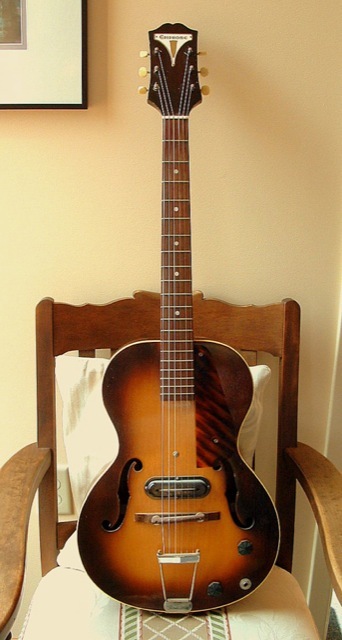 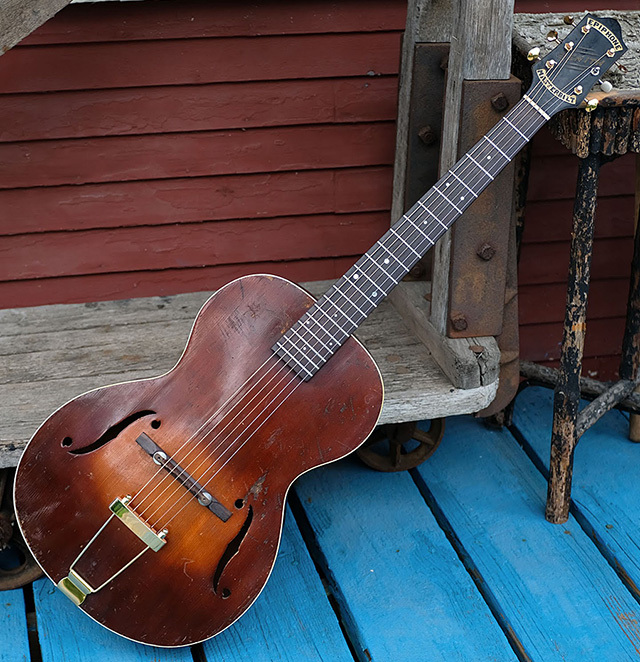 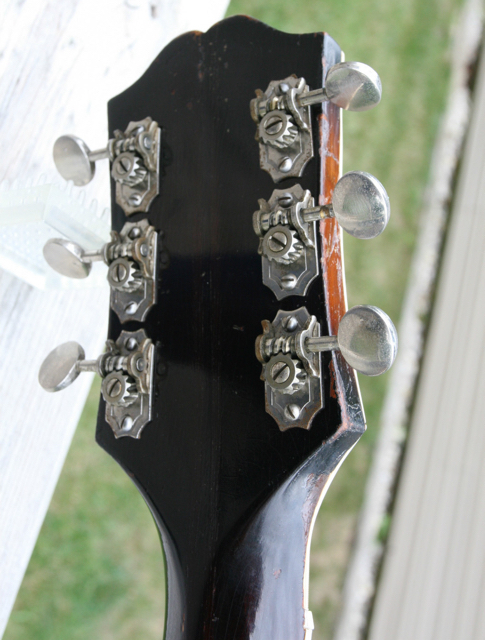 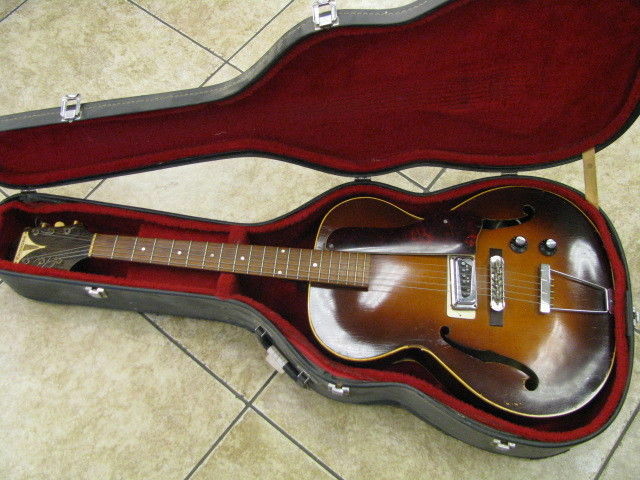 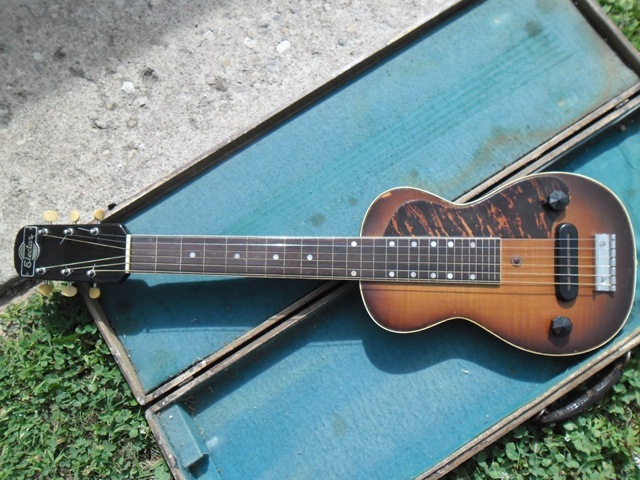 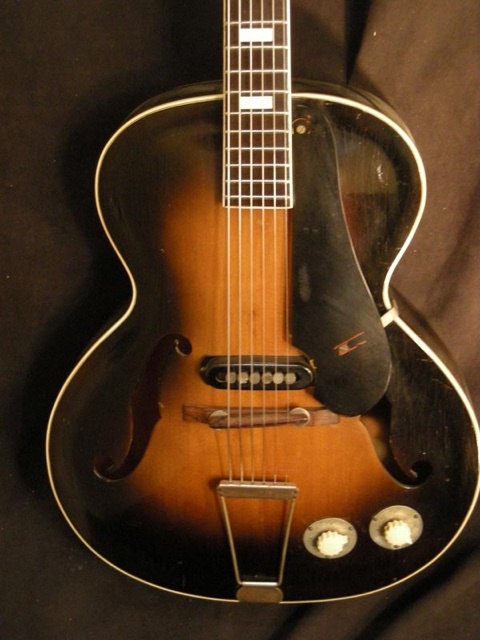 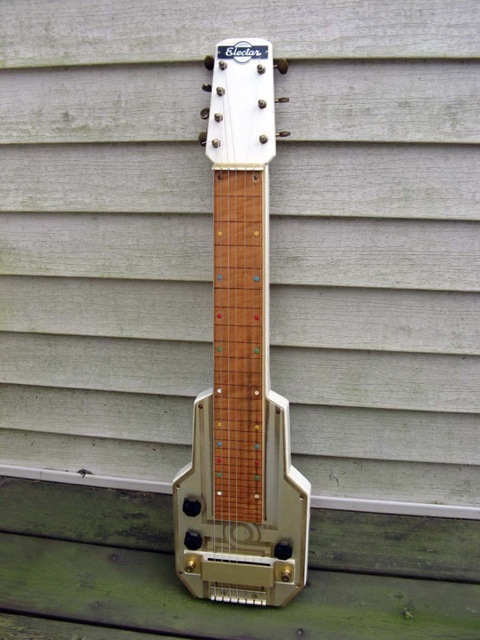 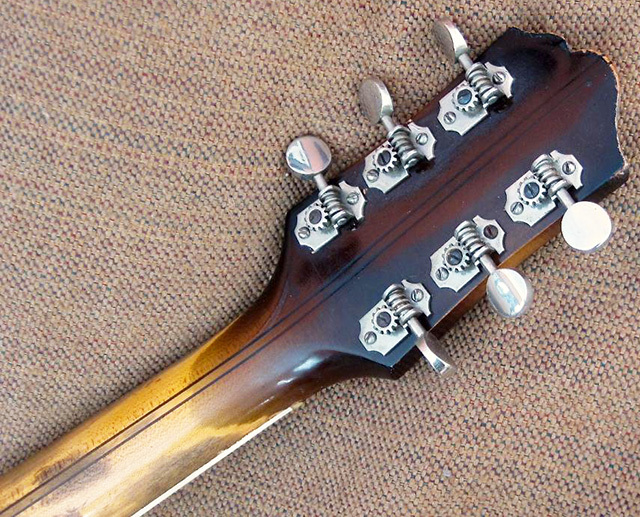 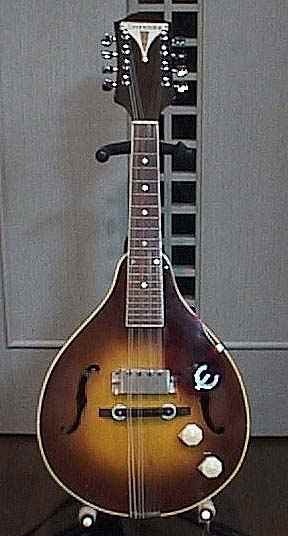 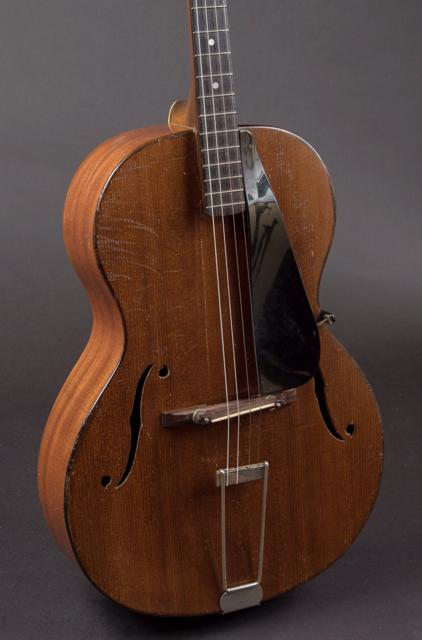 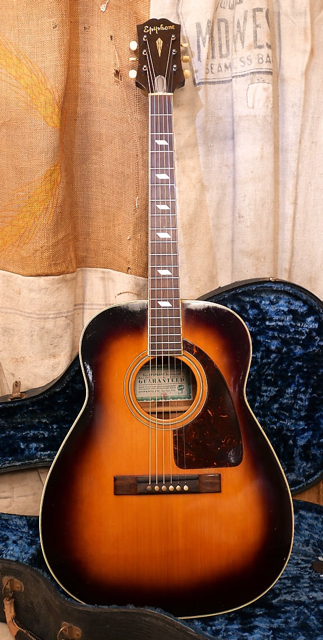 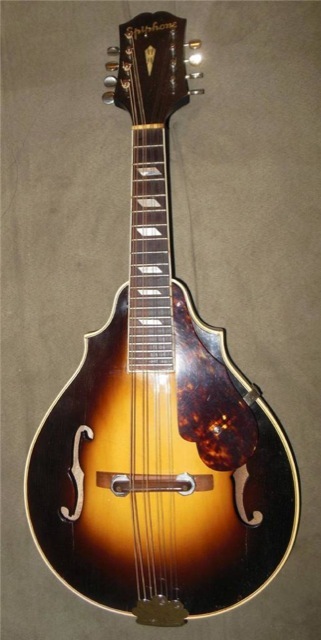 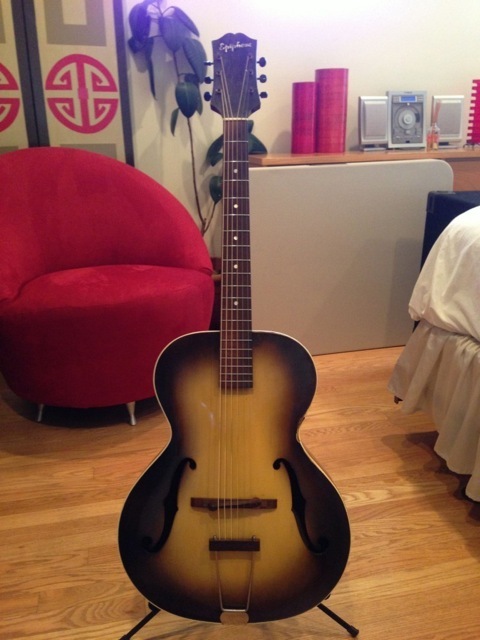 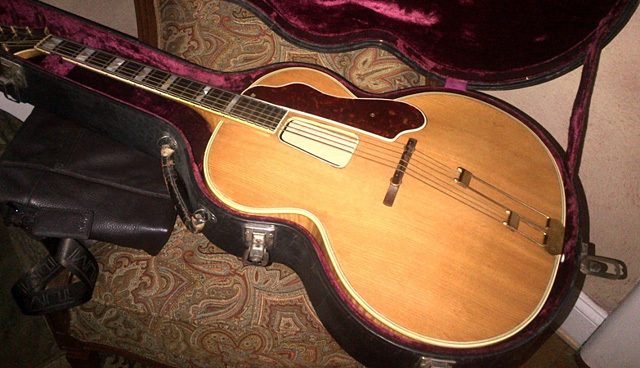 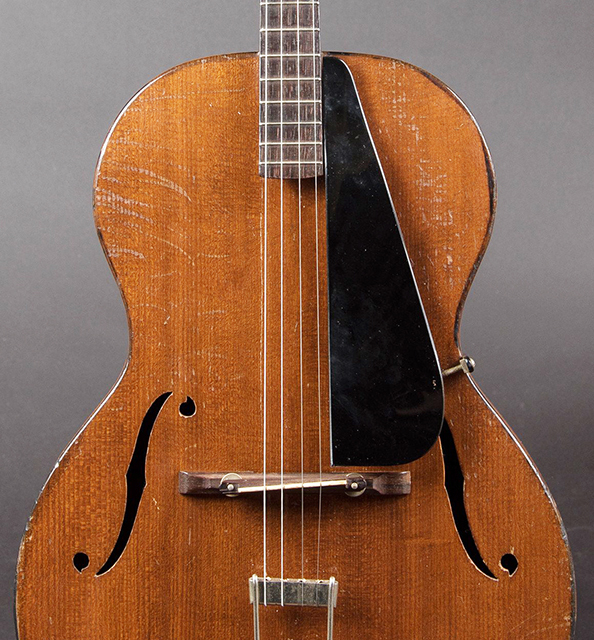 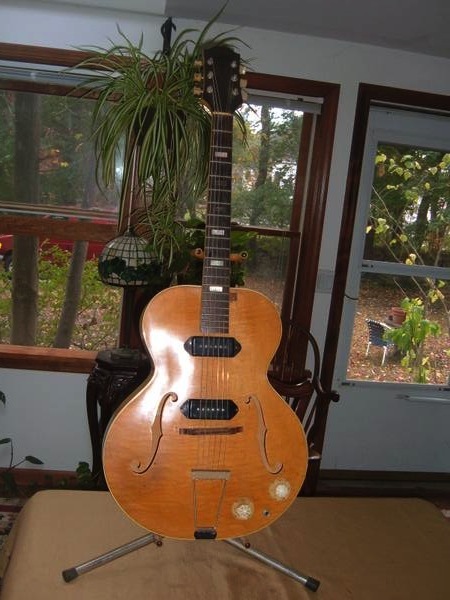 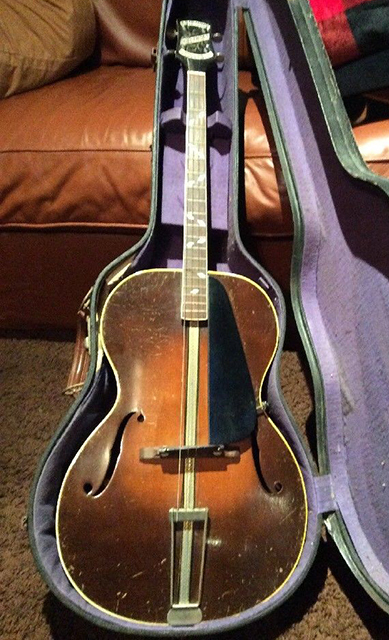 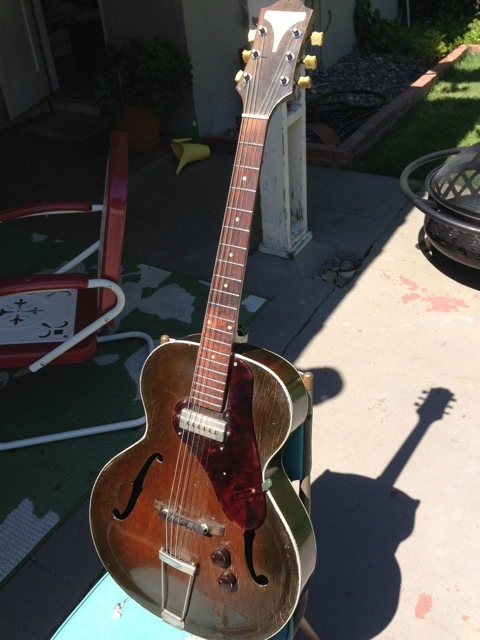 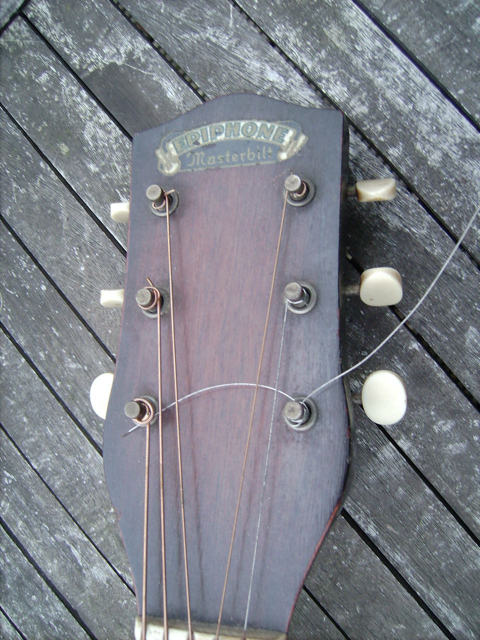 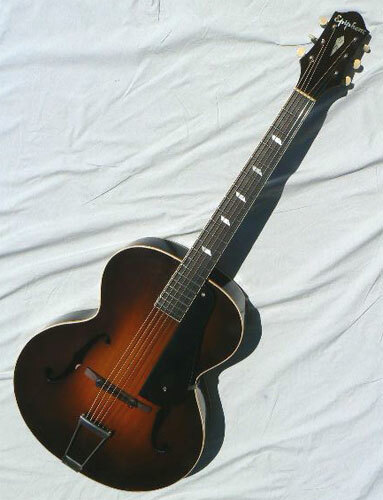 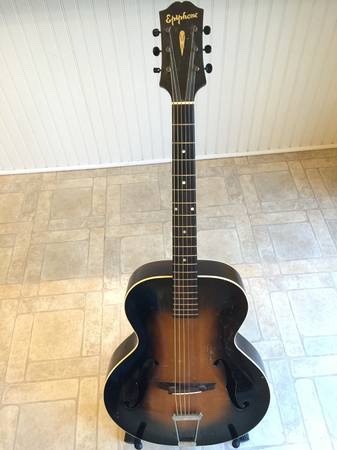 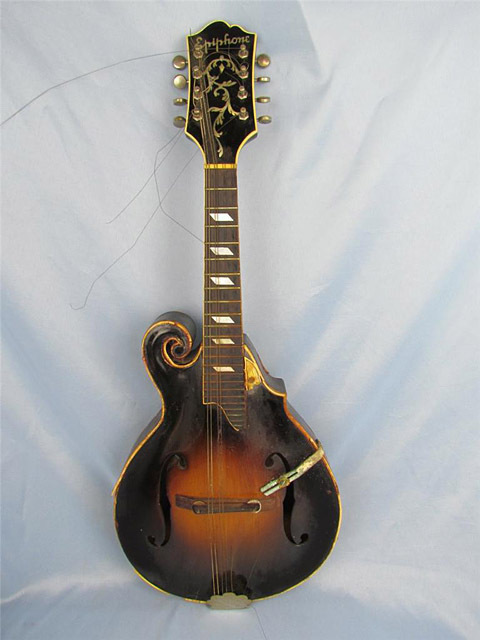 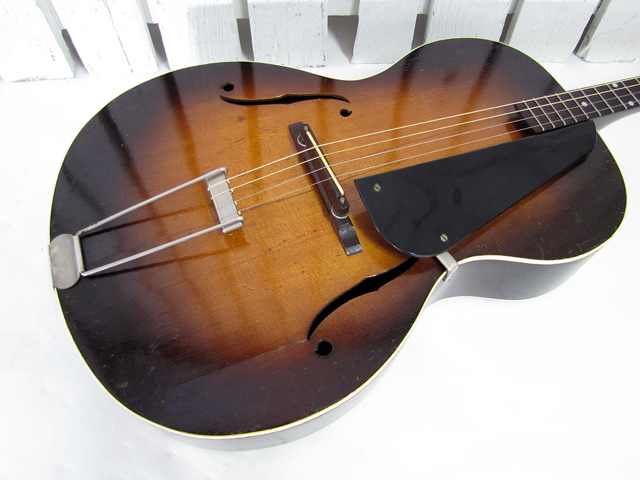 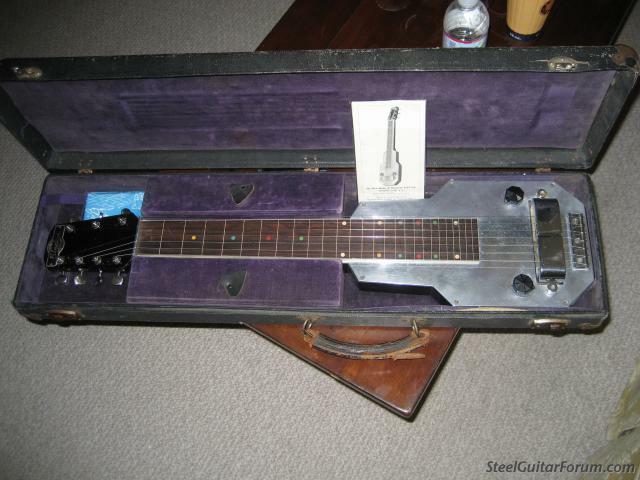 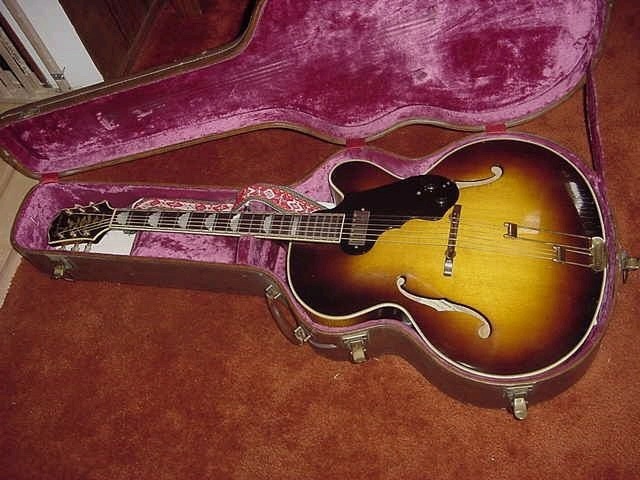 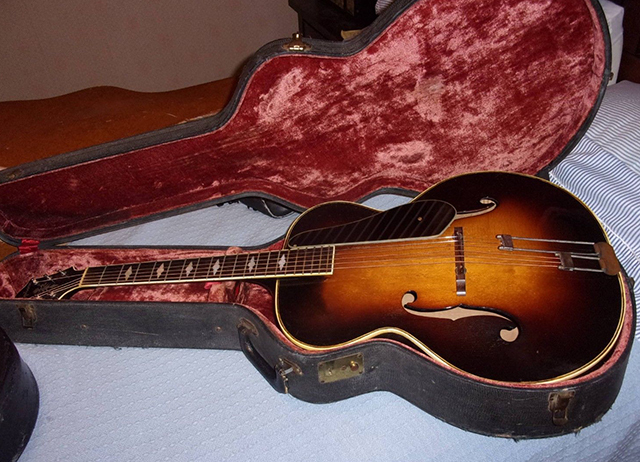 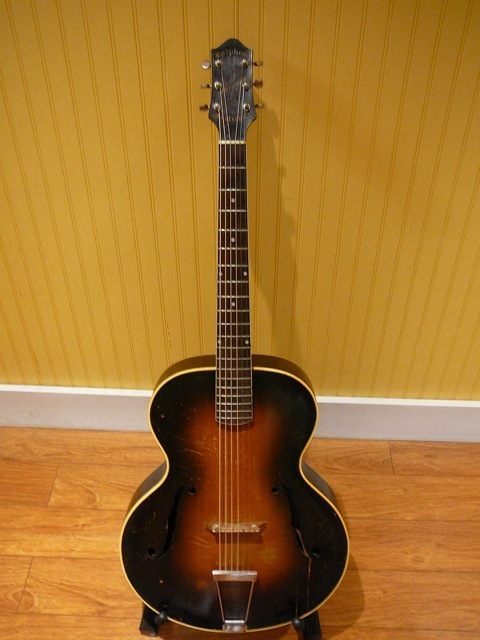 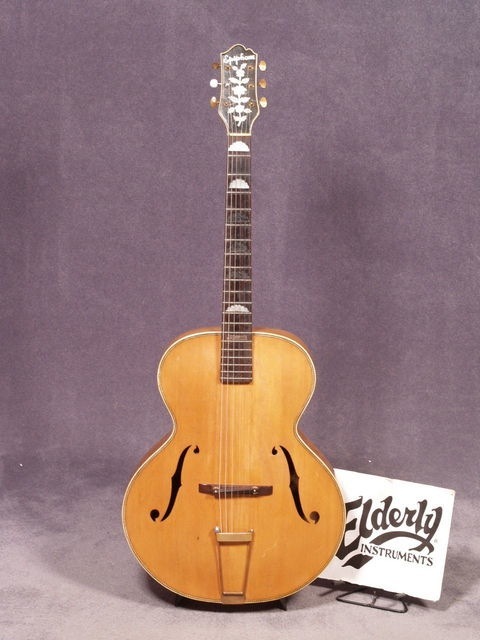 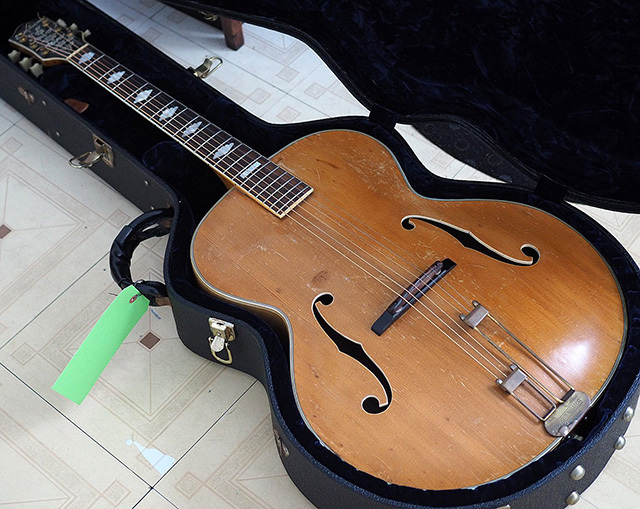 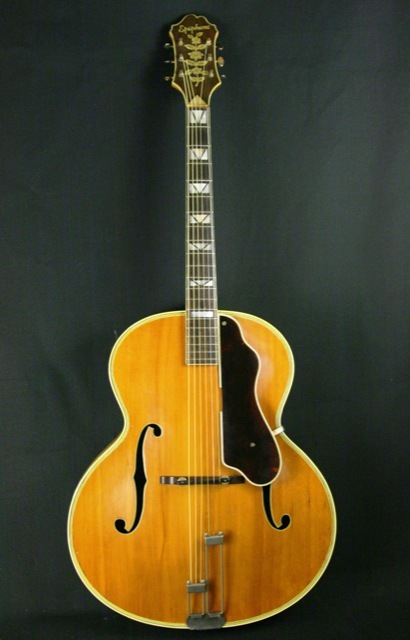 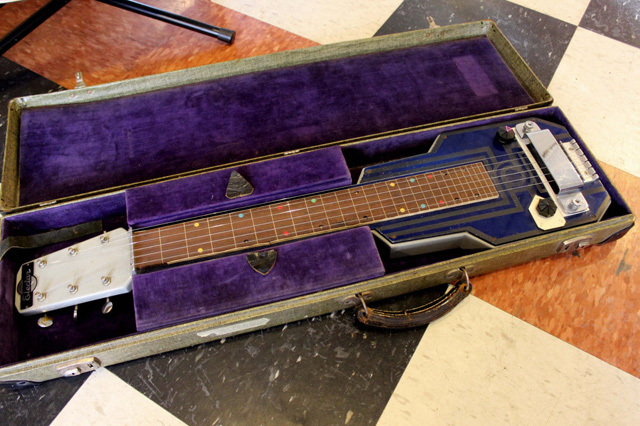 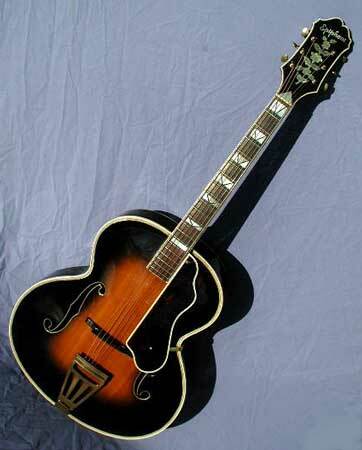 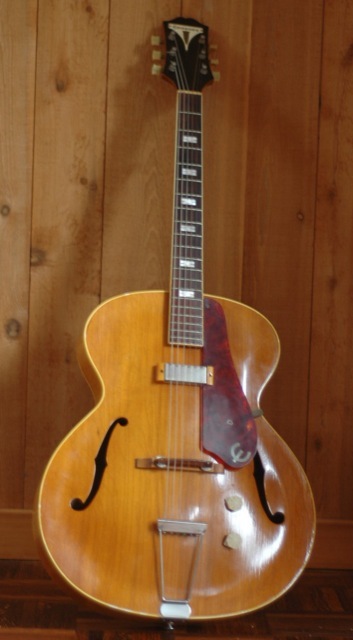 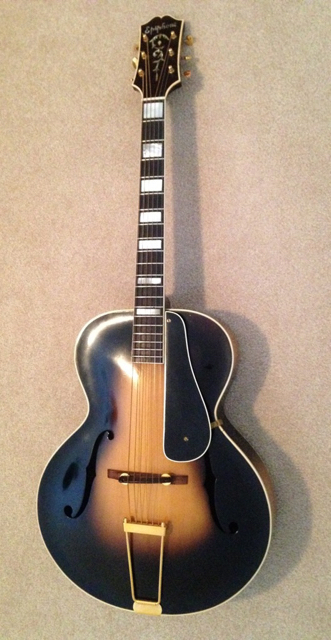 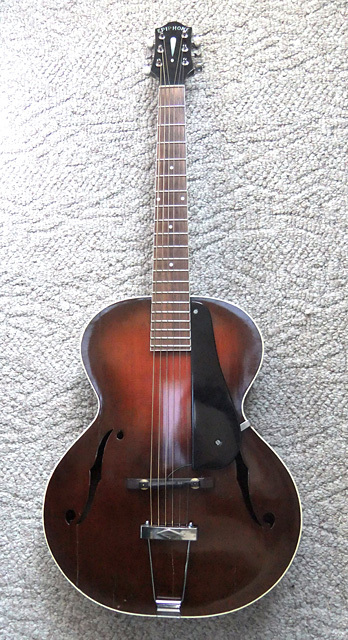 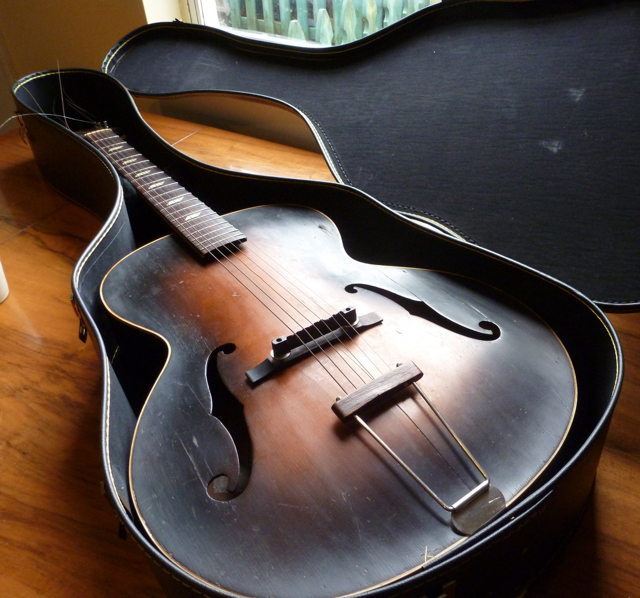 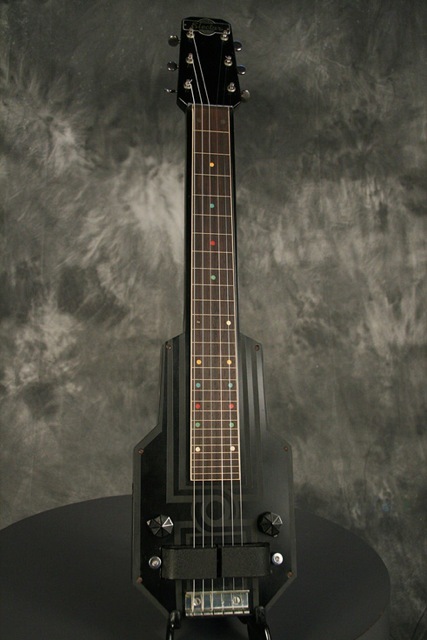 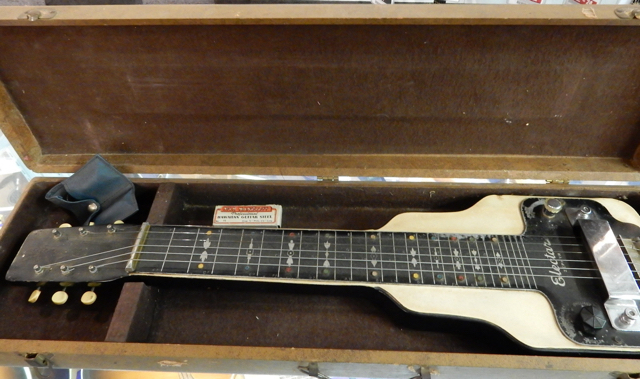 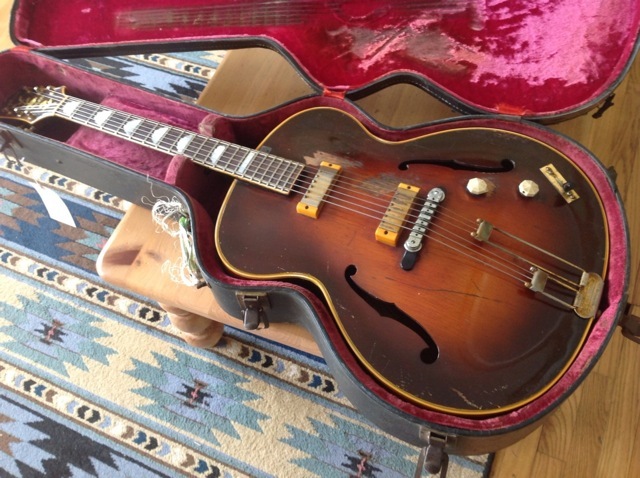 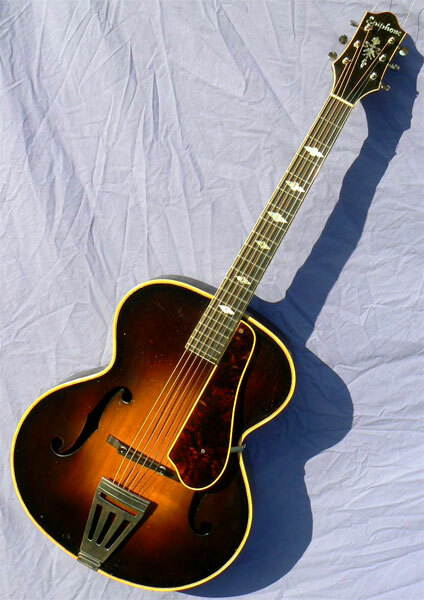 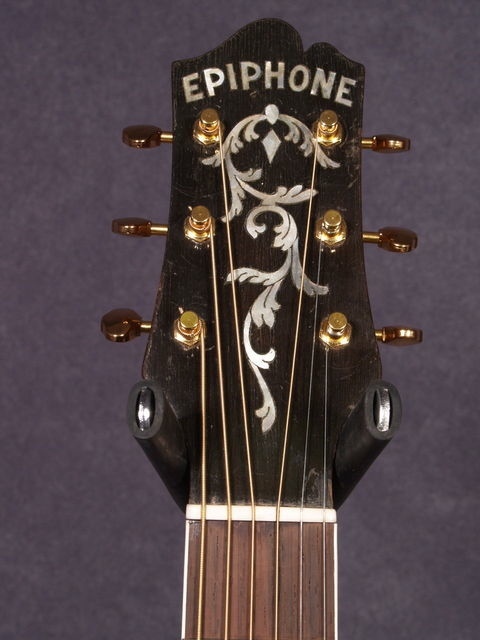 22) Wheeler 1982, p30: "in November 1938 (Epiphone) formally introduced a line of gut-string guitars ($75-225)." 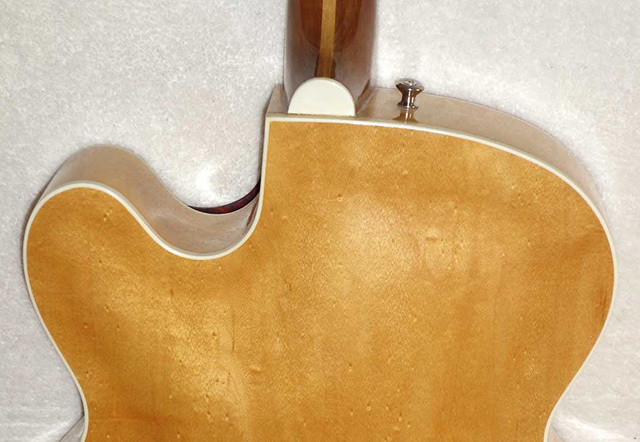 23) Fisch 1996, p35/p38. 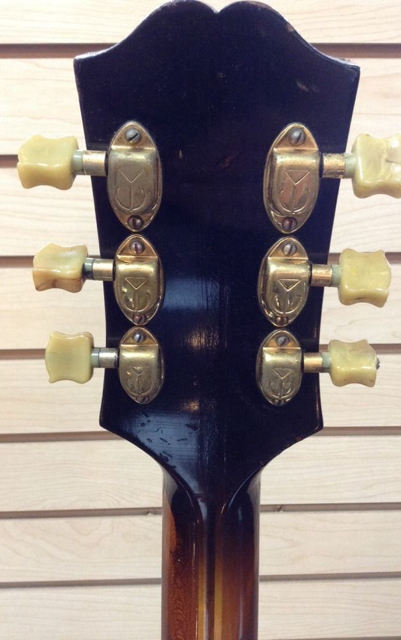 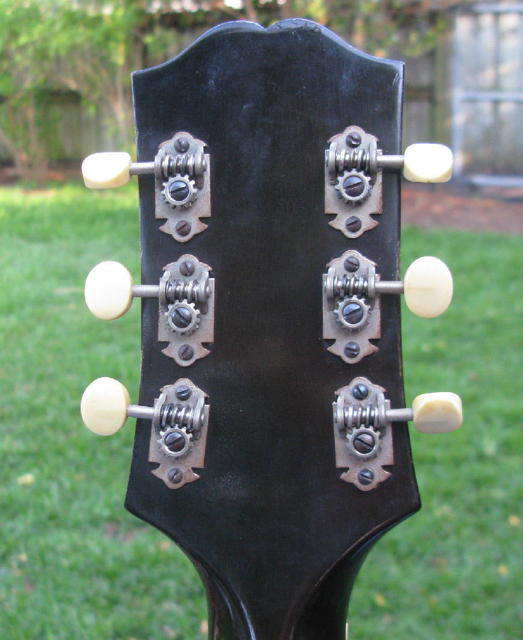 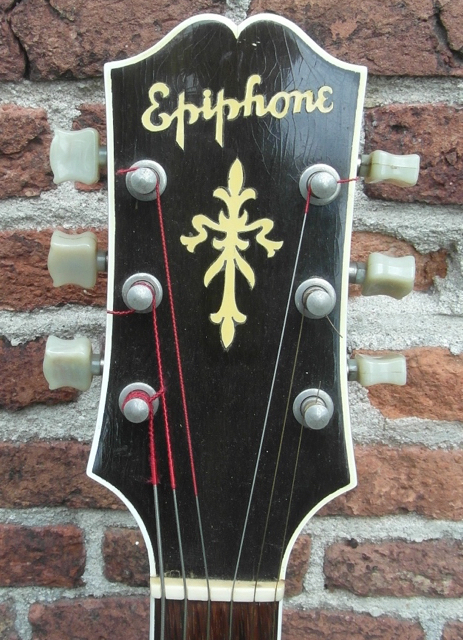 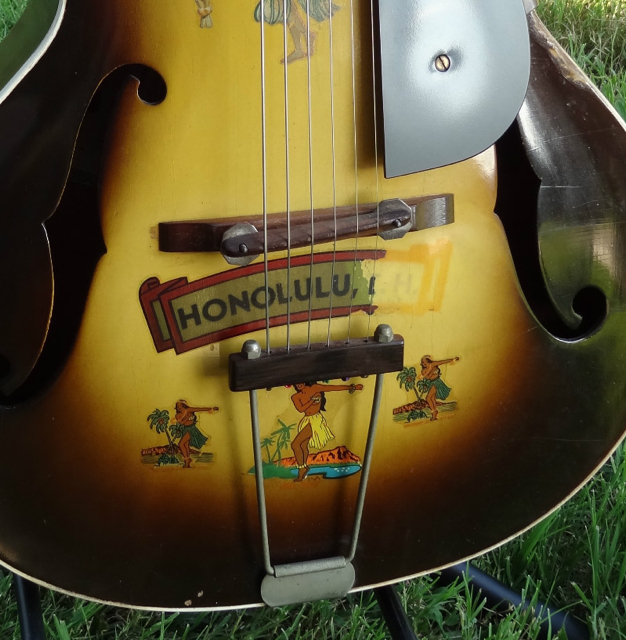 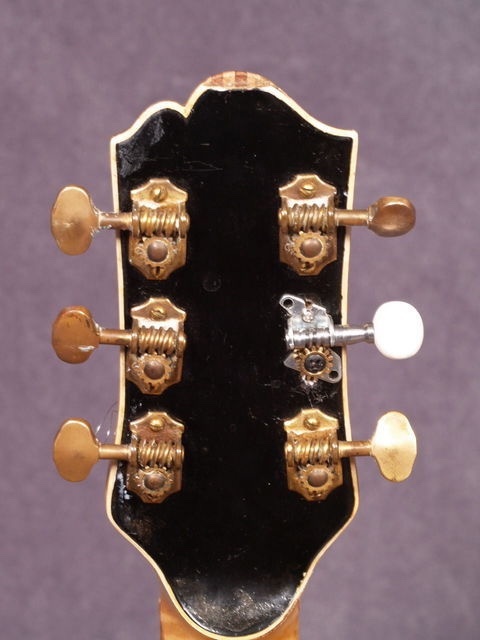 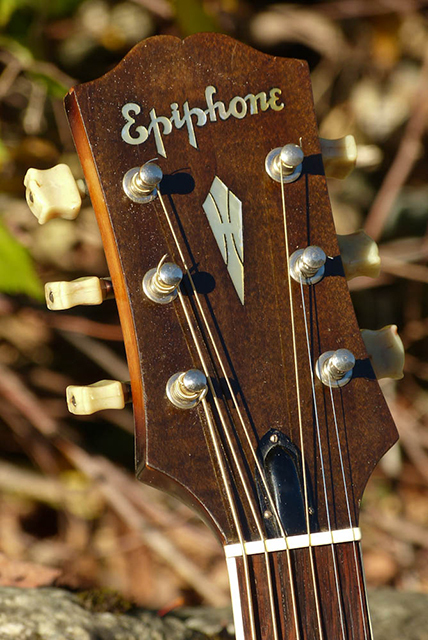 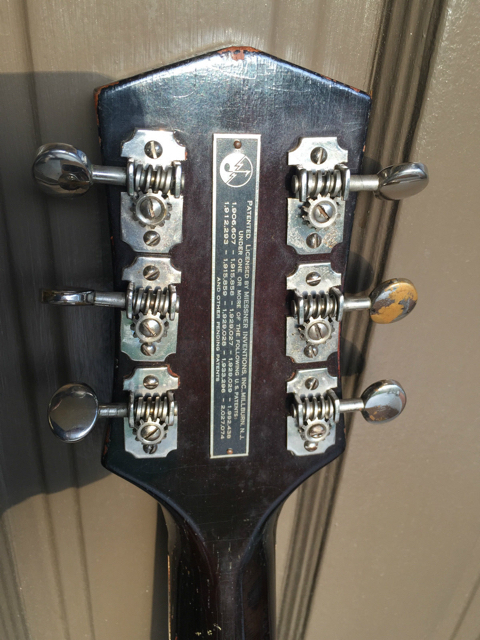 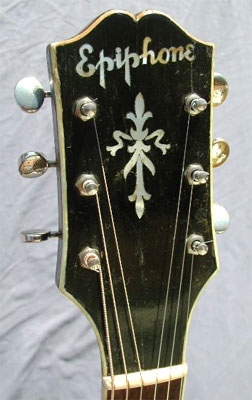 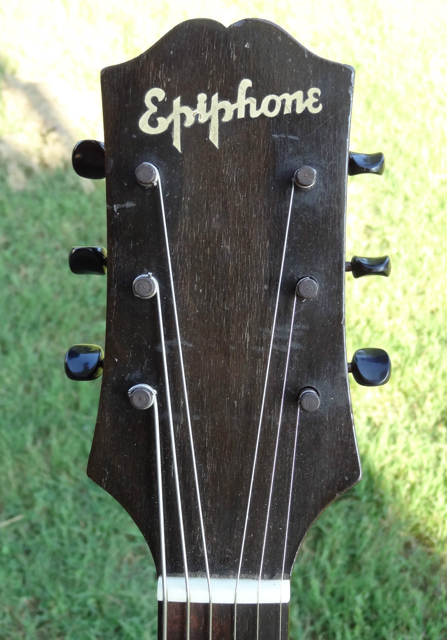 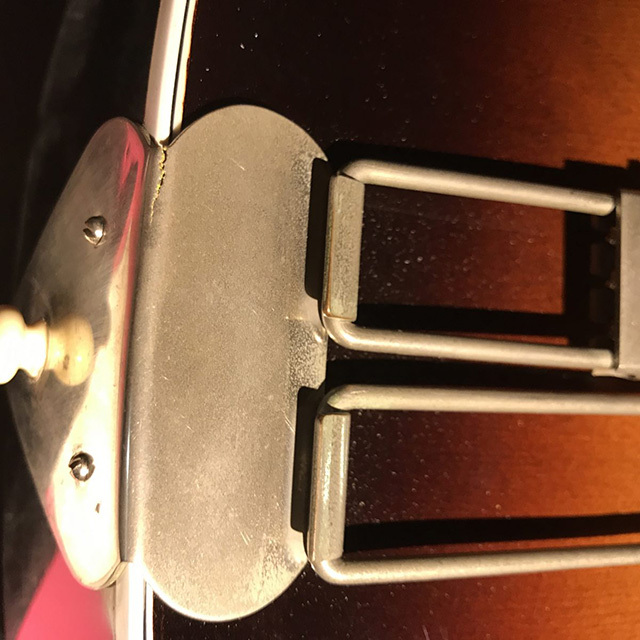 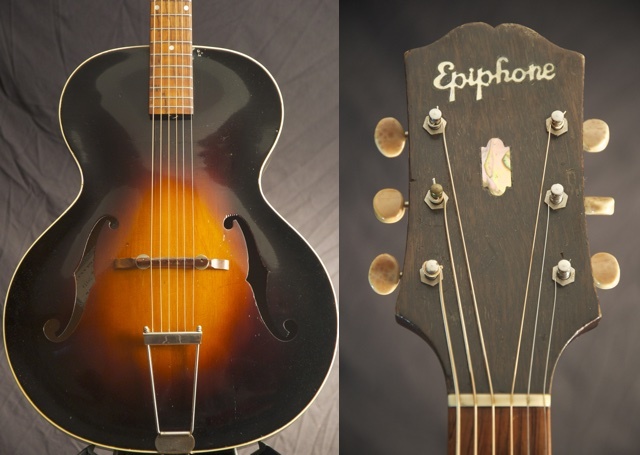 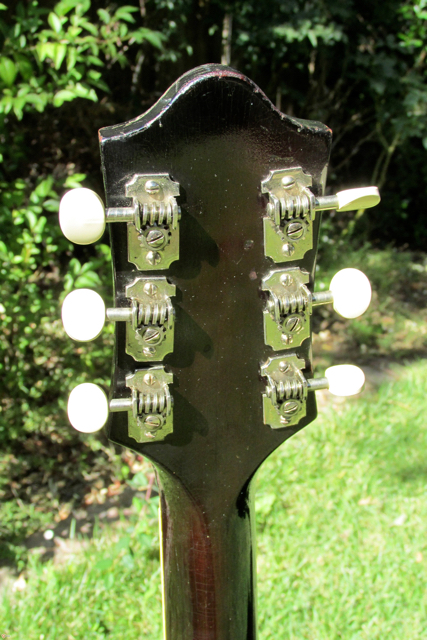 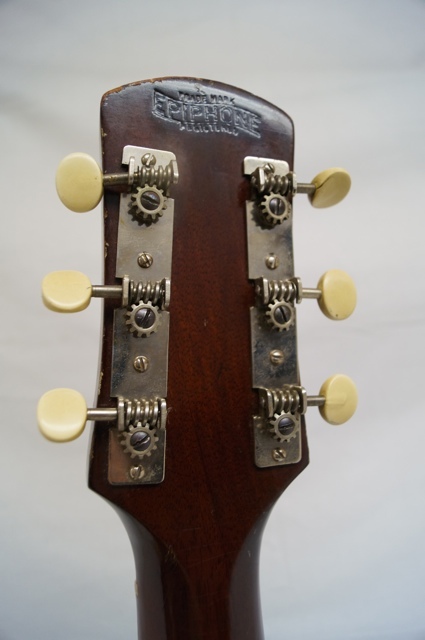 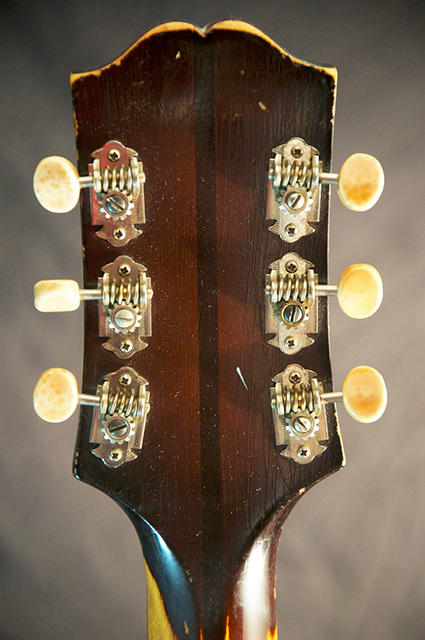 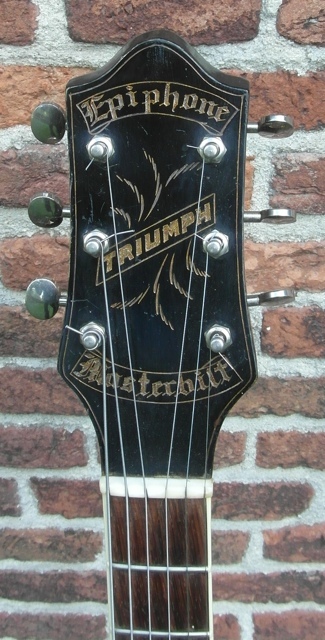 The 1939 catalog introduced Epiphone's "E" logo, shown on the new enclosed tuners and in the lining of case lids; the "E" logo was registered as trademark in 1941 with the statement "claims use since Apr 15, 1939" (Official Gazette of the U.S. Patent Office", July 15, 1941, p539). 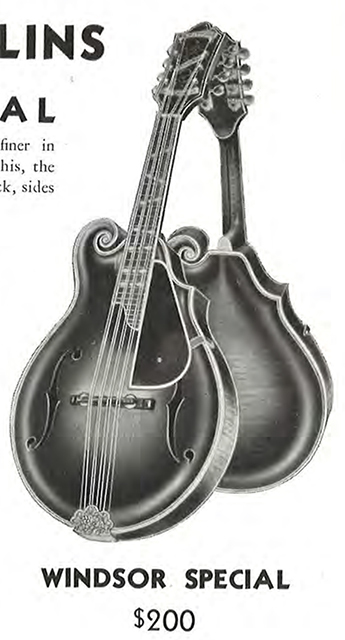 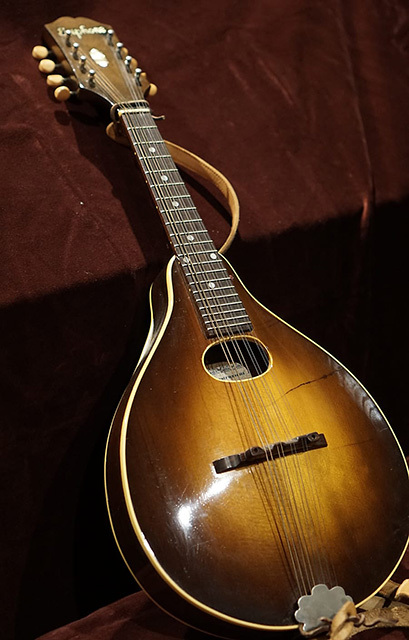 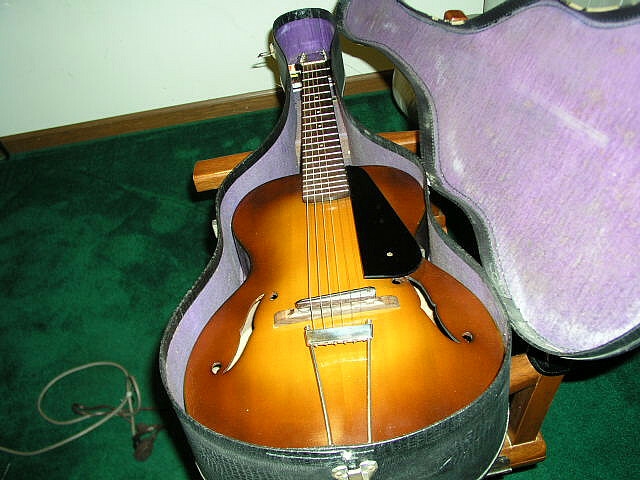 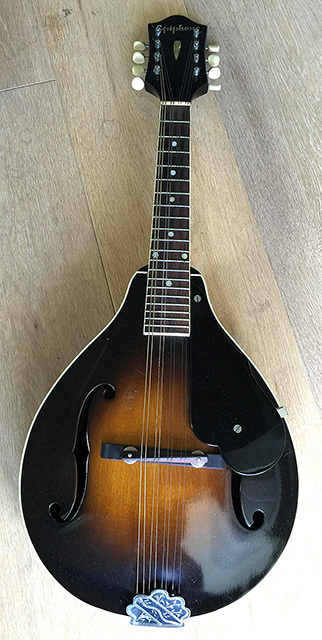 The Century Mandolin on p31 was illustrated with a retouched image of the Model M Mandolin as shown in the 1937 flyer. 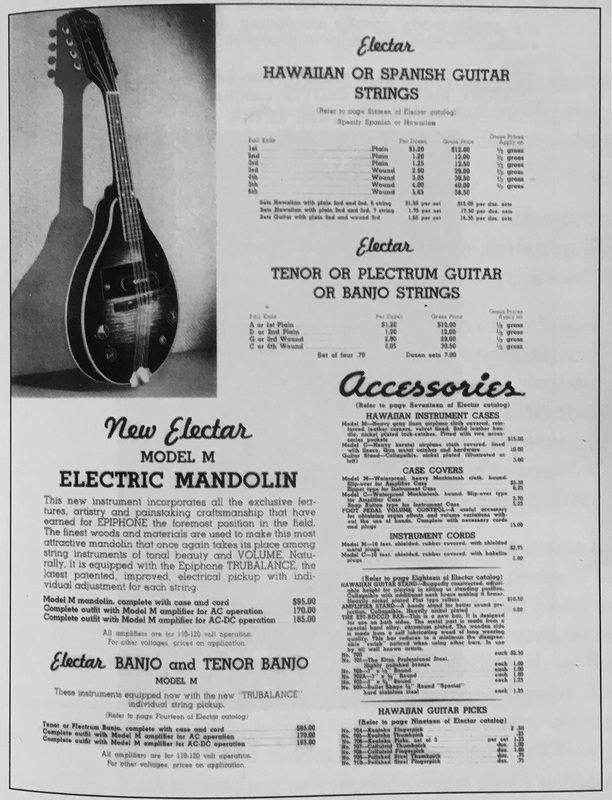 24) Advert "Down beat", Feb 1939 (Fisch 1996, p35/p38). 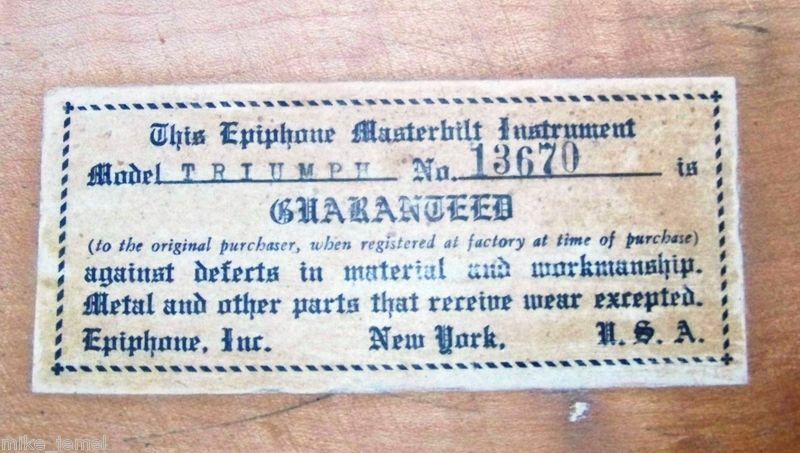 25) Announced in flyer "Blondes"; this flyer introduced the new natural finish options for the Triumph, Spartan, Blackstone, and Broadway models; the flyer also mentioned the FT 30 + FT 50 as "new additions" (prices $30/$50, raised in October 1940 list to $35/$57.50). 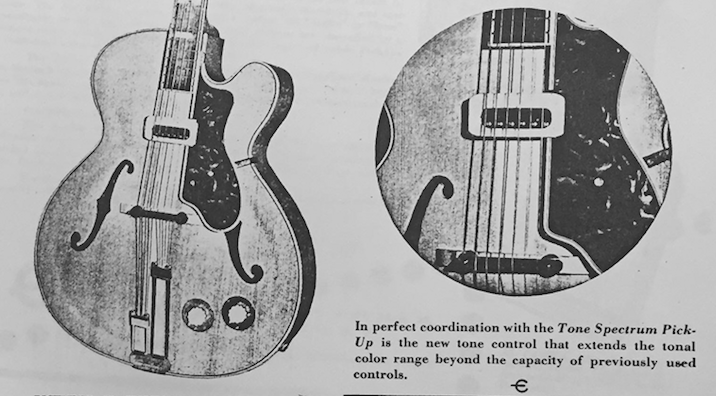 26) Bass models announced in "The Music Trades", June 1940 (Fisch 1996, p172). 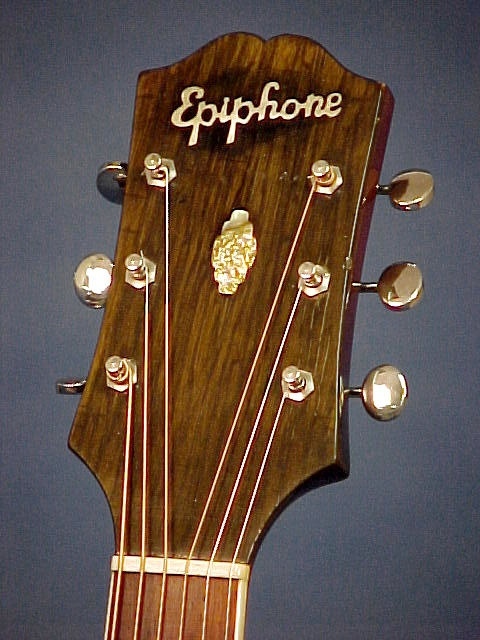 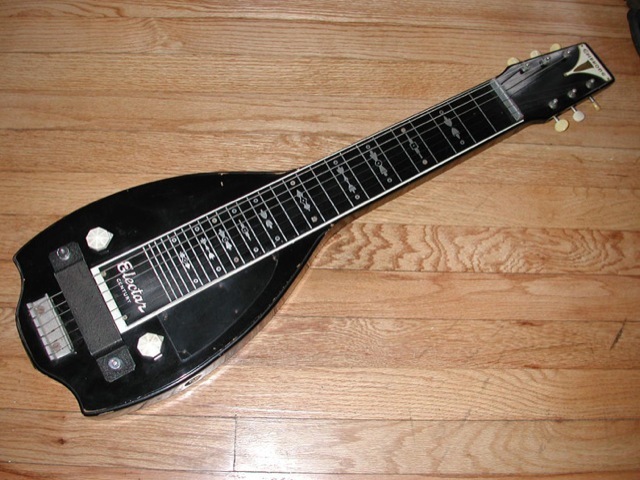 27) Fisch 1996, p165: quoting a letter dated August 18, 1941 sent to Epiphone dealers: "We are discontinuing the Gut String Guitars as there isn't a sufficient market for this type of instrument in the Epiphone price range." 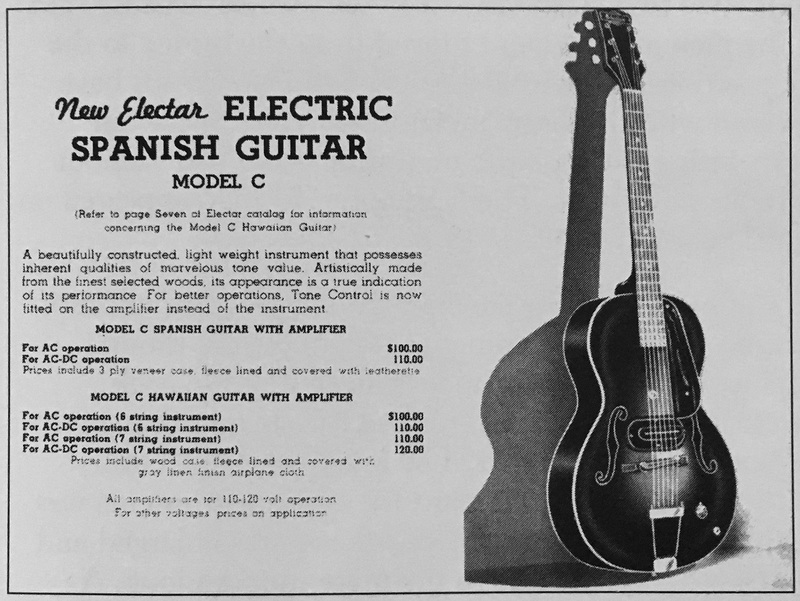 28) Price Changes list, Dec 1, 1941: "Announcing a new model: De Luxe Zephyr Spanish Electric Guitar" (sic! 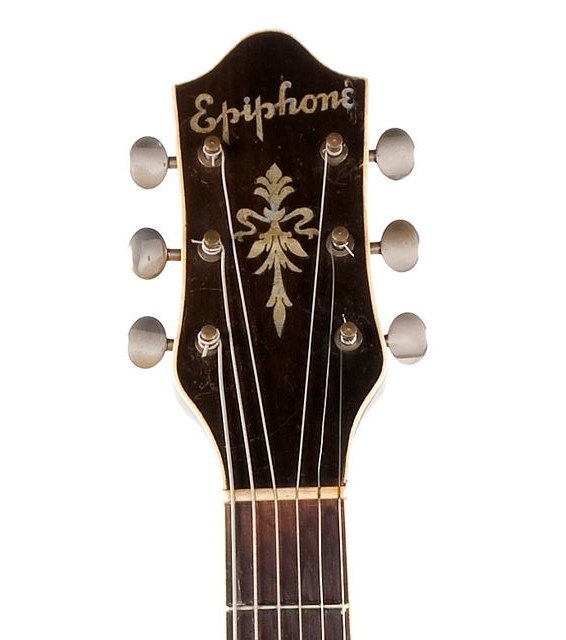 ); this Price Changes list contains no reference to Catalog V, nor the FT 110 model. 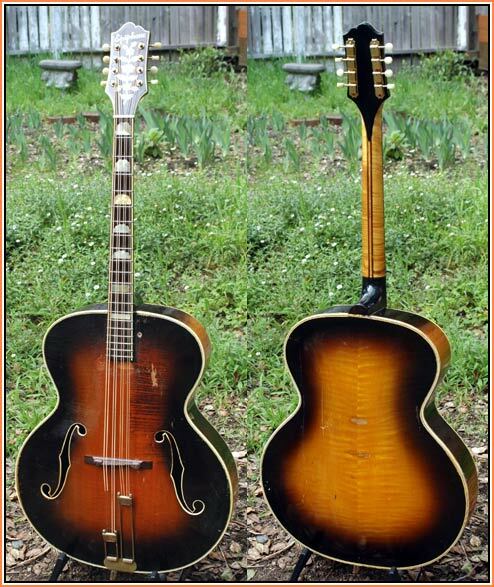 29) Catalog V was commonly dated 1941 (Fisch); however we conclude it was likely not released before early 1942, since it features the new FT 110 model (not included in the Price Changes list, Dec, 1, 1941; see note 28). 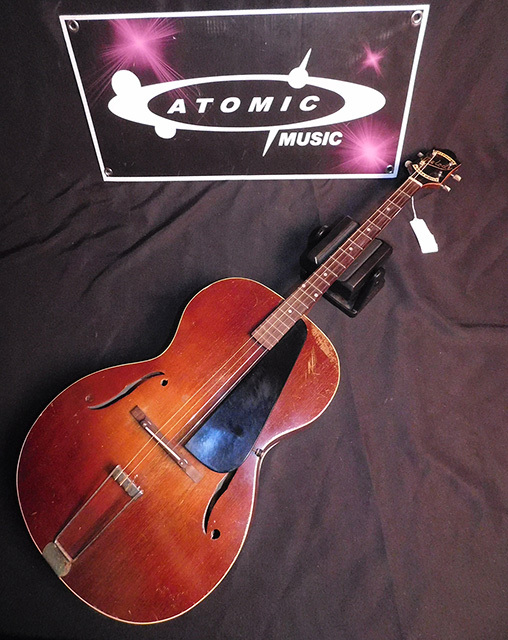 Price list, March 15, 1942 refers to Catalog V.
30) Quote from a letter to a customer, dated August 4, 1942, signed by Herb Sunshine: "Some of the instruments shown in the catalog, especially those in which there is a preponderance of metals or other strategic materials, are not available for the duration of the war. 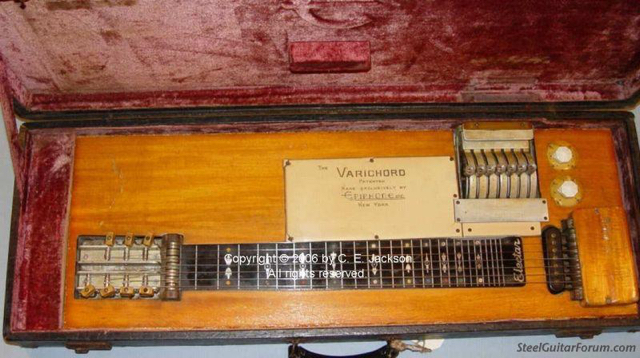 These include the VARICHORD." 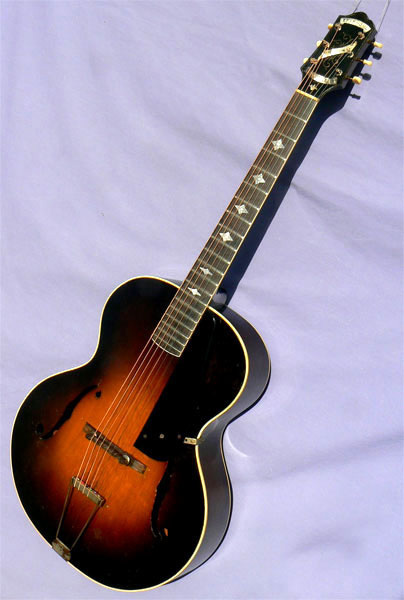 Note that other guitar manufacturers such as Gibson and Martin also discontinued their high-end models and electric instruments around 1942. 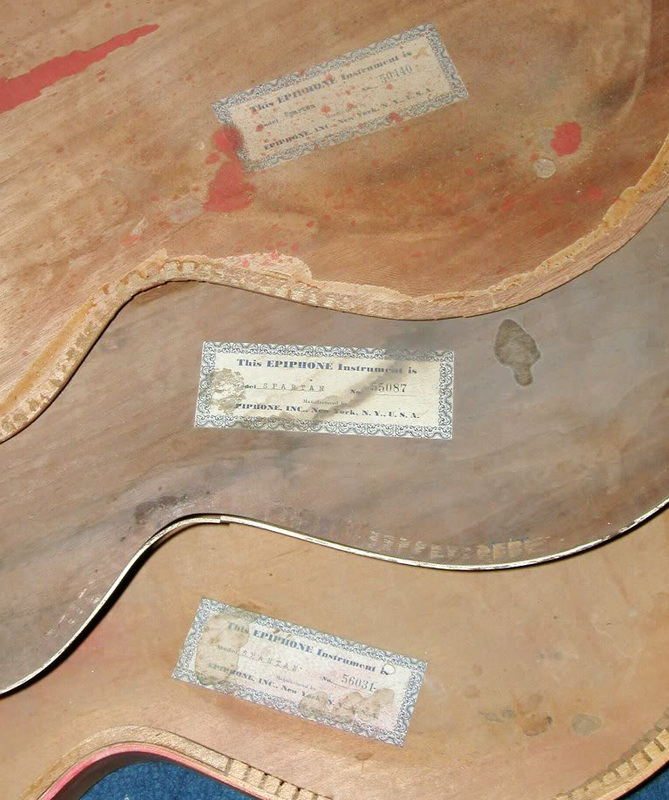 31) Fisch/Fred quote a letter Epi Stathopoulo sent to dealers in August 1941: "Owing to governmental restrictions on the use of certain materials, it has become necessary to use substitutes wherever possible. 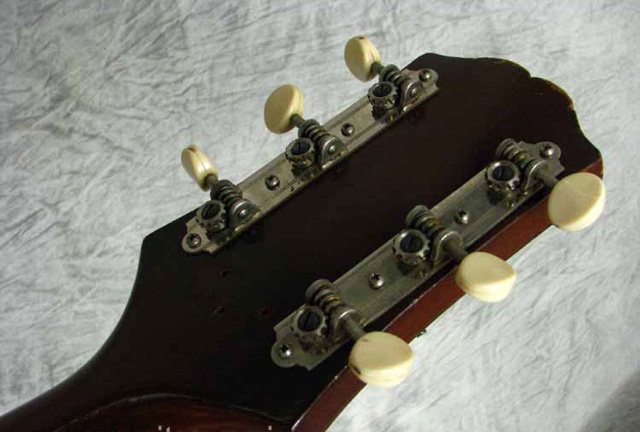 While the performance specifications of our instruments are not affected, substitute materials may be used. 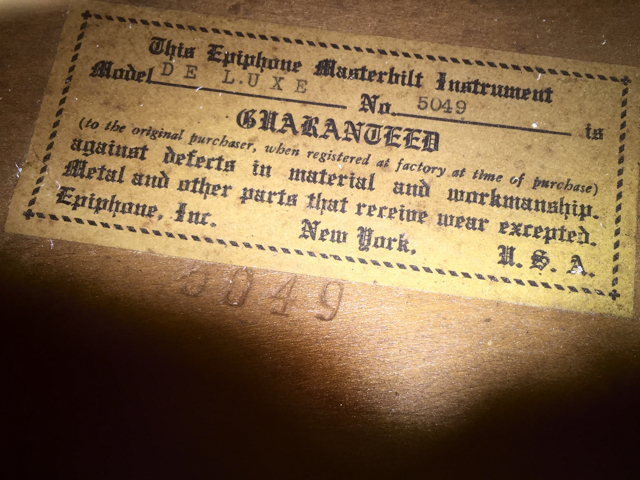 In accepting orders during the present situation brought about by the National Defense program, we reserve the right to make any necessary substitutions in the constructional features." 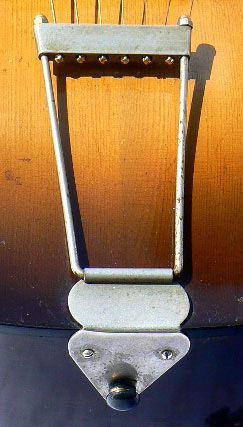 (Fisch 1996, p43). 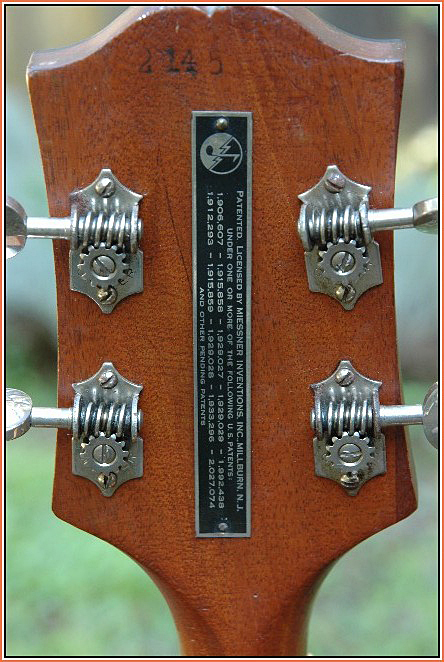 This exact notice is also included in the 1942 Catalog V (p42), and in the price list of March 15, 1942. 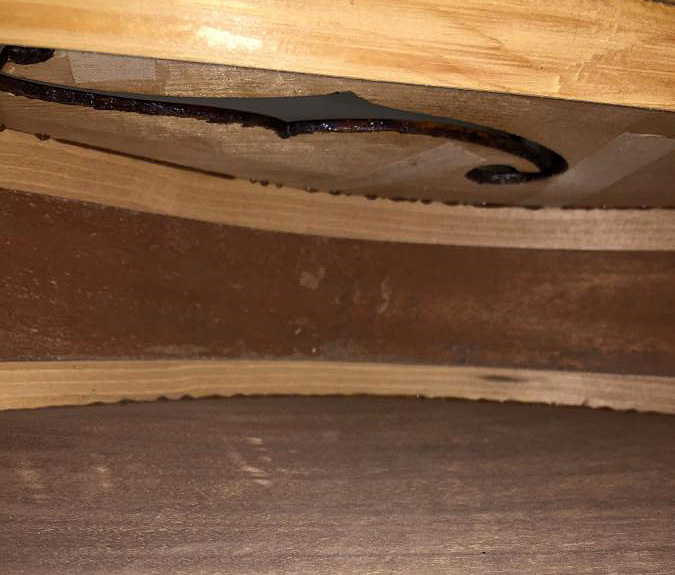 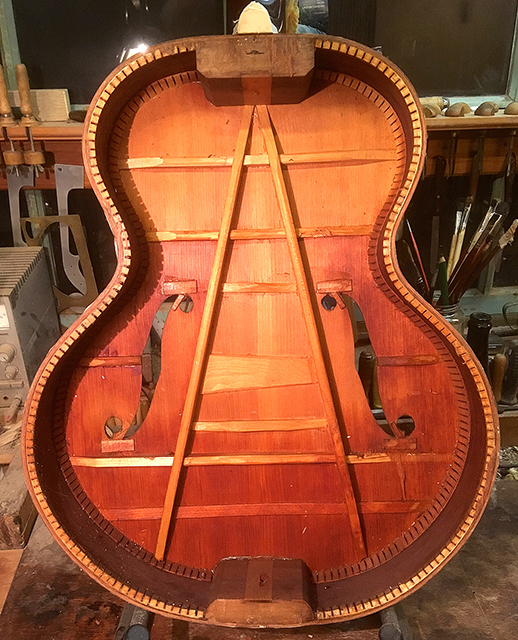 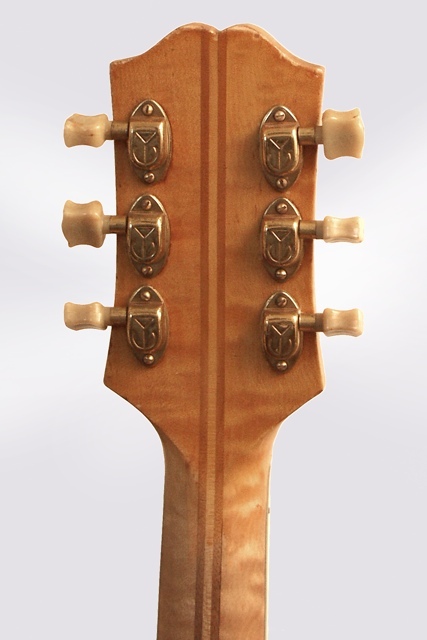 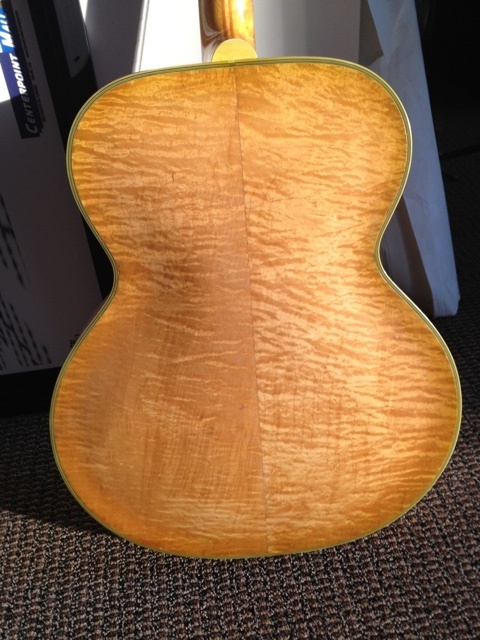 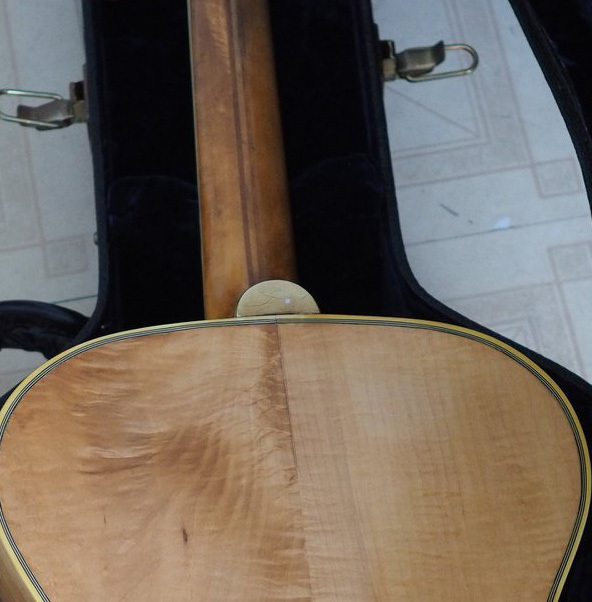 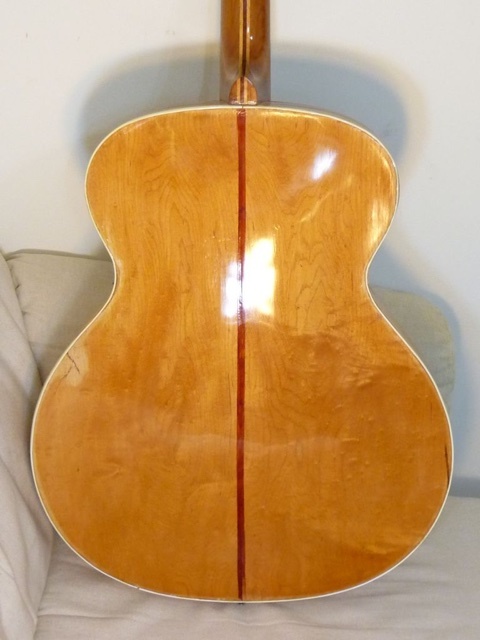 Regarding the substitute for spruce in carved tops: "Certain carved-top models were fitted with limed mahogany tops in place of the traditional spruce" (Fisch 1996, p43). 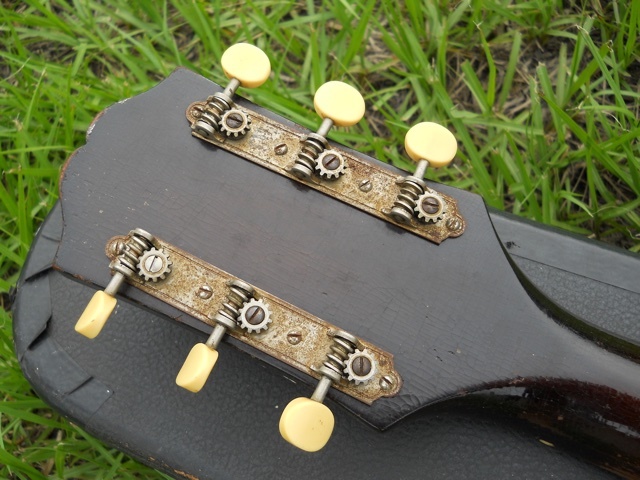 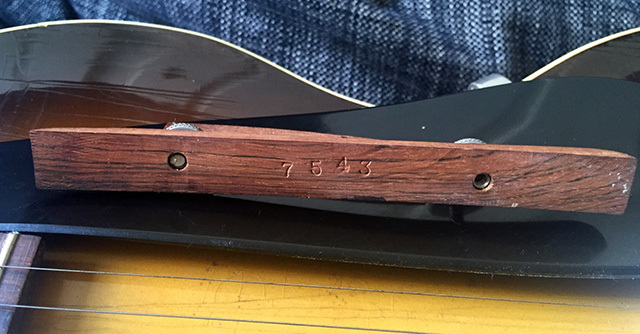 "Some other interesting wartime features of at least one Olympic from 1943 included a rosewood crossbar on the tailpiece and brown bakelite adjusting nuts on the bridge. 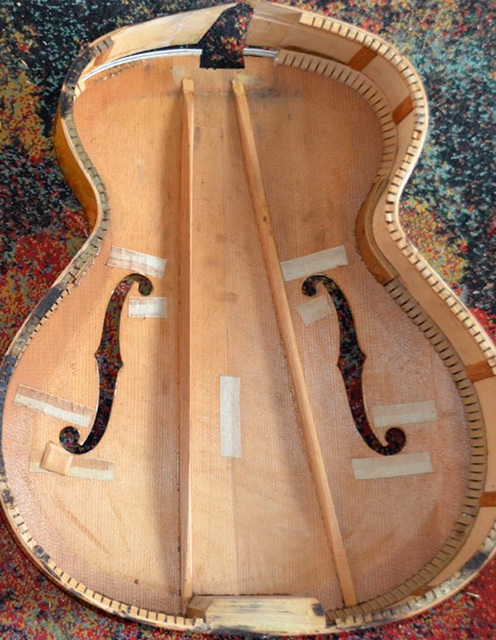 The top of this particular instrument was not spruce, but of some other not readily identifiable wood, possibly poplar" (Fisch 1996, p104). 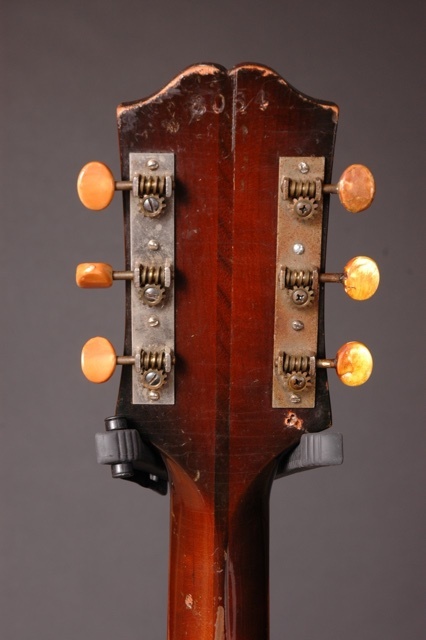 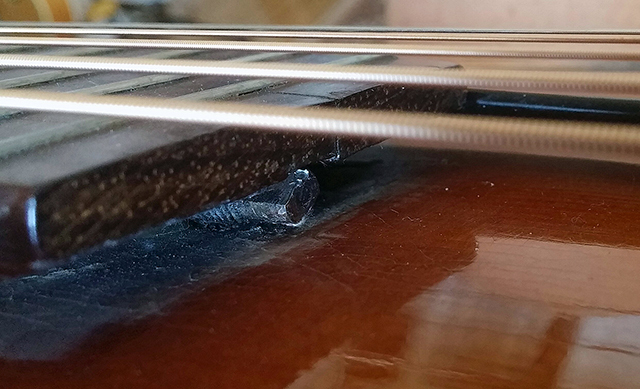 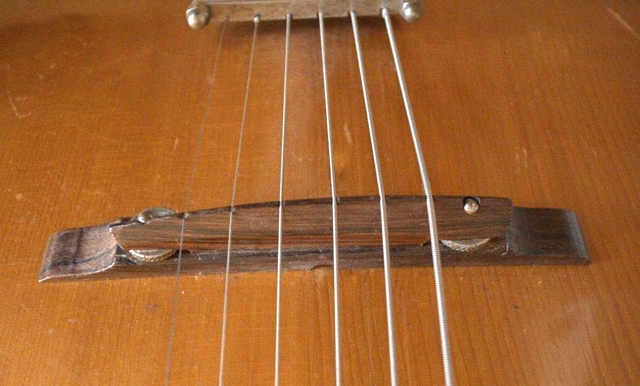 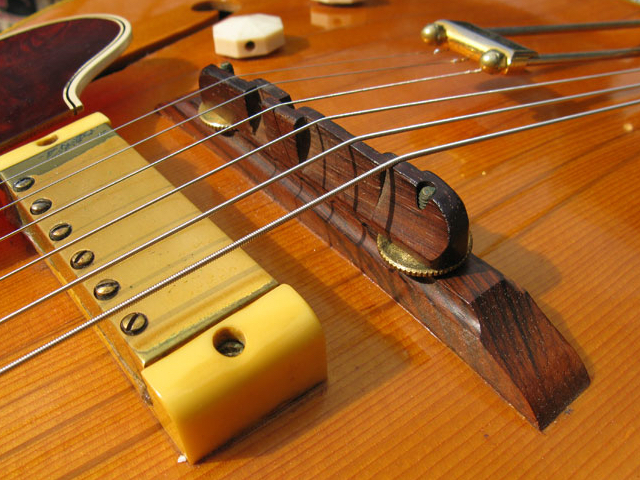 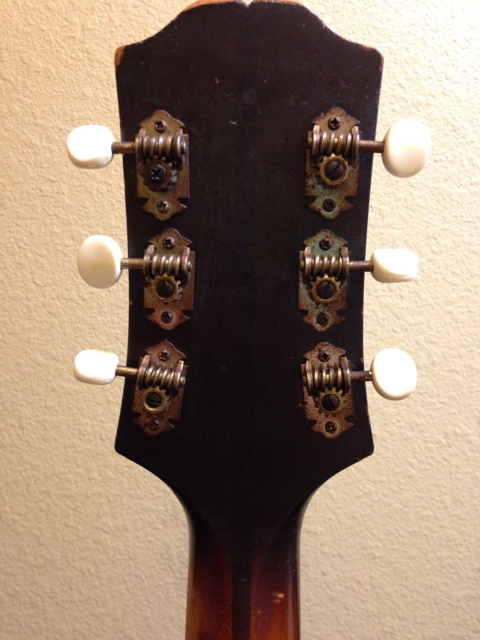 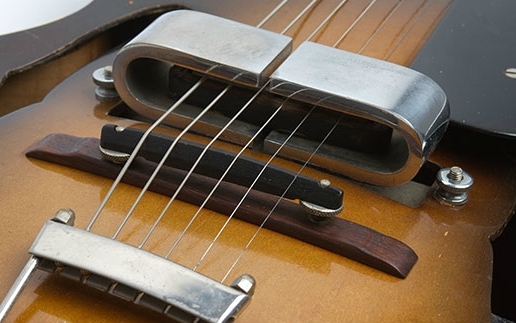 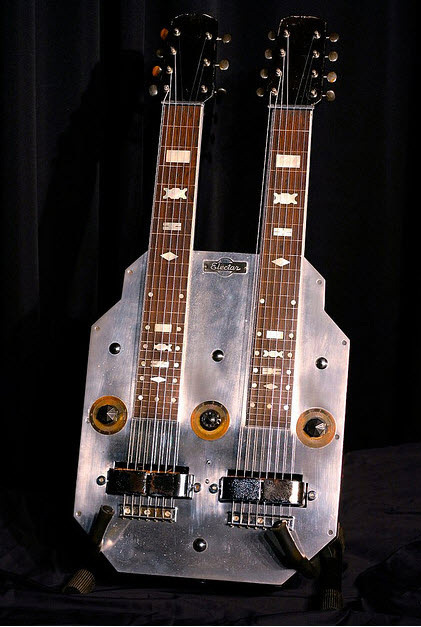 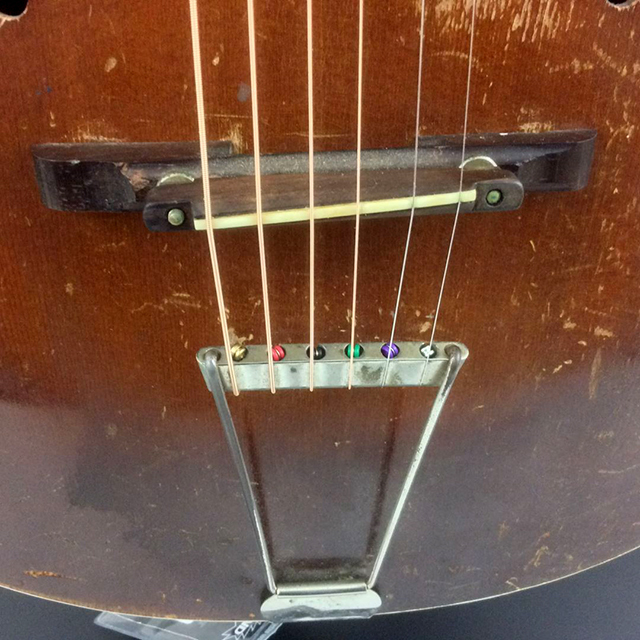 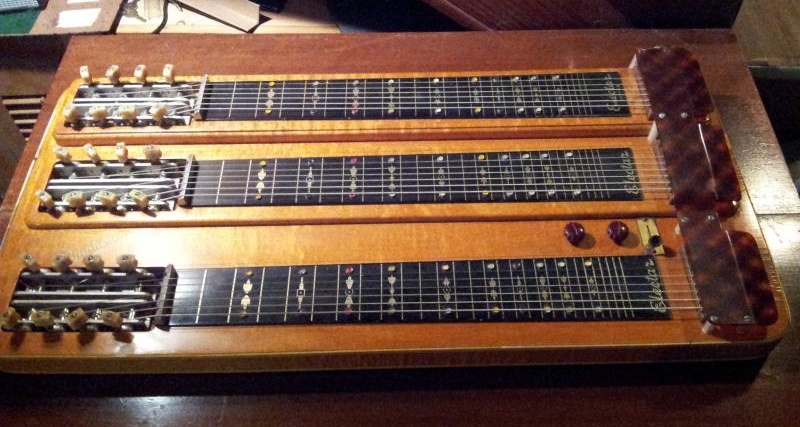 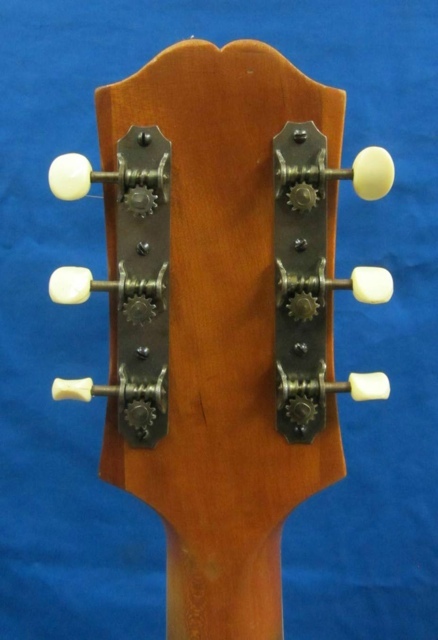 Interestingly, Epiphone continued using metal neck reinforcement rods during the war years, while both Gibson and Martin replaced metal rods with wooden bars. 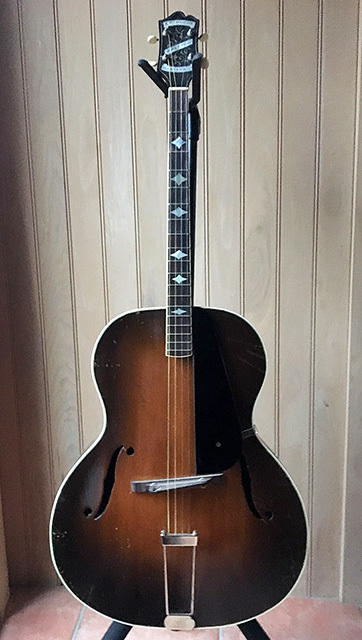 32) The price lists 1946–48 are still referring to Catalog V from 1942; in the 1946 price list, discontinued items are listed with asterisks (***) instead of price. 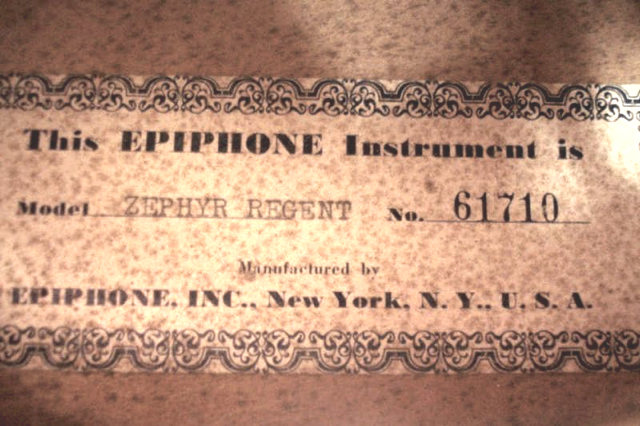 The 1946 notice sheet lists all discontinued items, with Zephyr and Century models marked "distribution expected late spring". 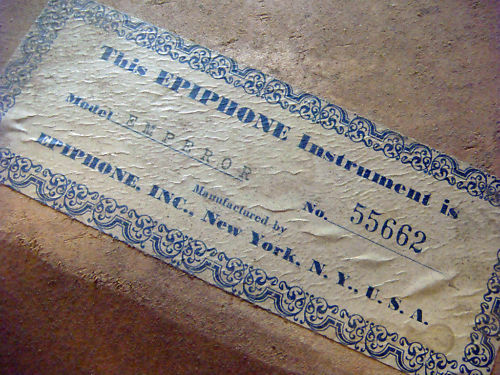 34) This 1948 price list included under "new models" also "Advanced" (=cutaway) versions of the Emperor, DeLuxe + Broadway, and "Concert" versions of the Emperor + DeLuxe (earliest documented example SN 58809, c. 1949). 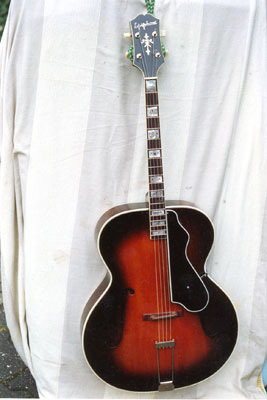 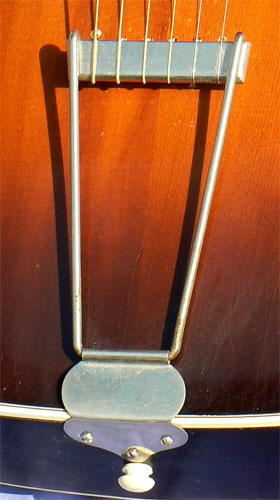 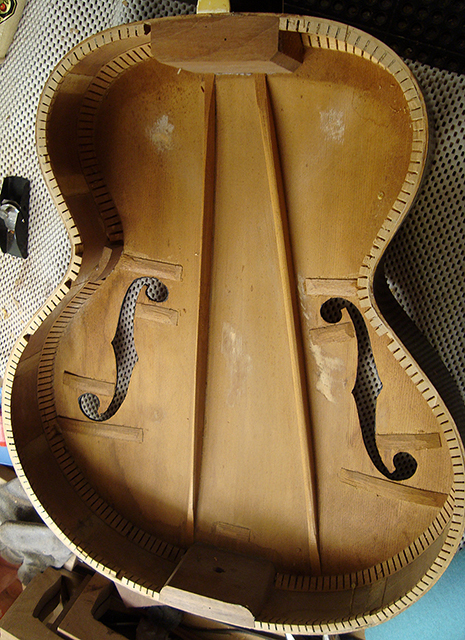 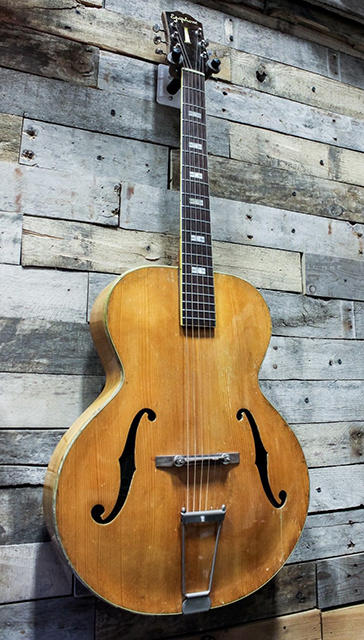 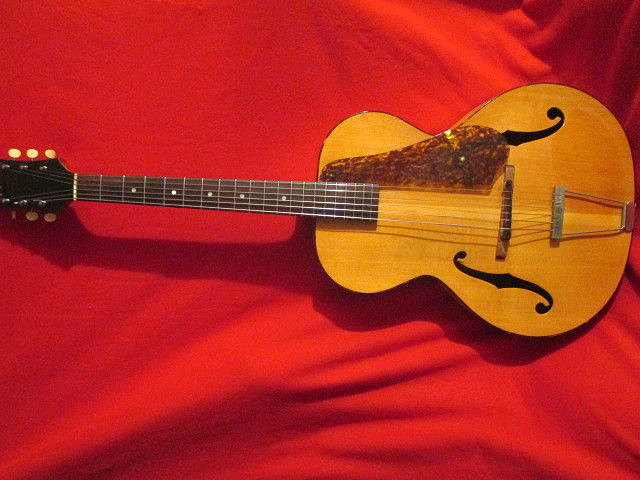 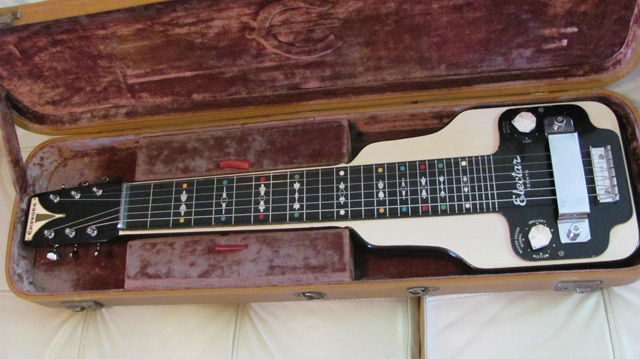 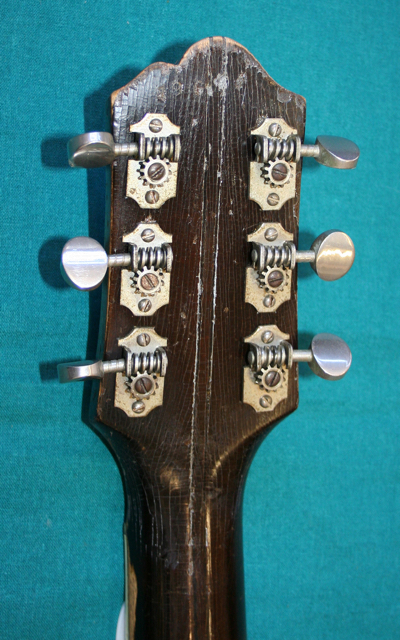 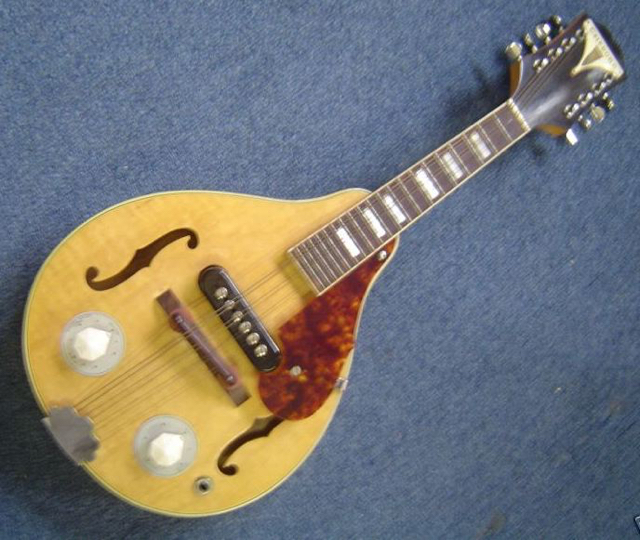 The short-lived Concert models disappeared from the price list by 1949. 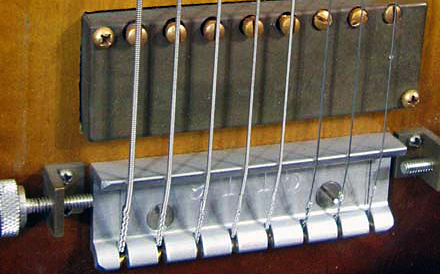 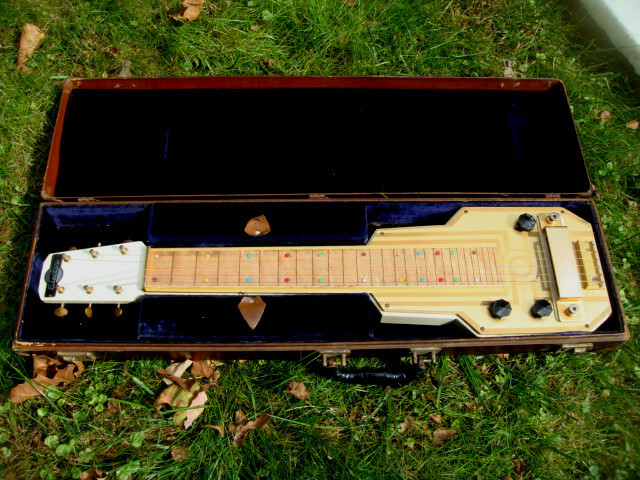 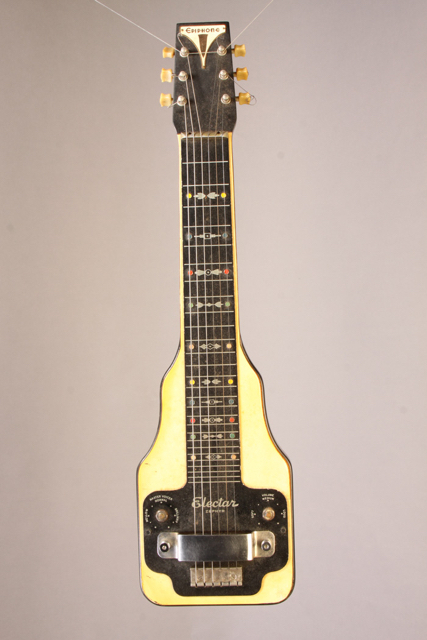 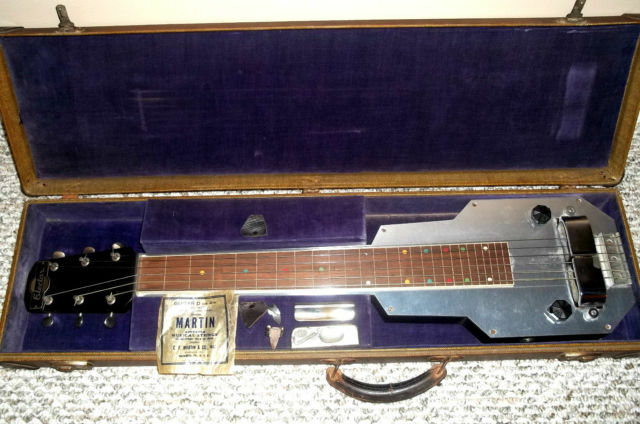 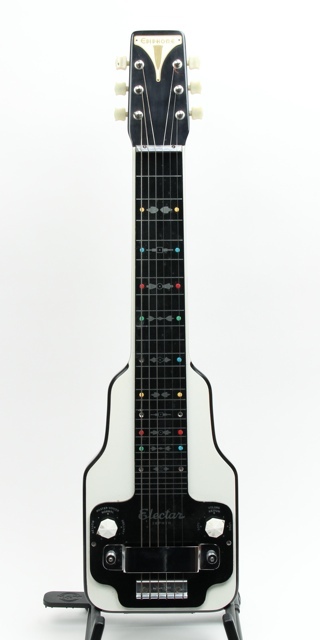 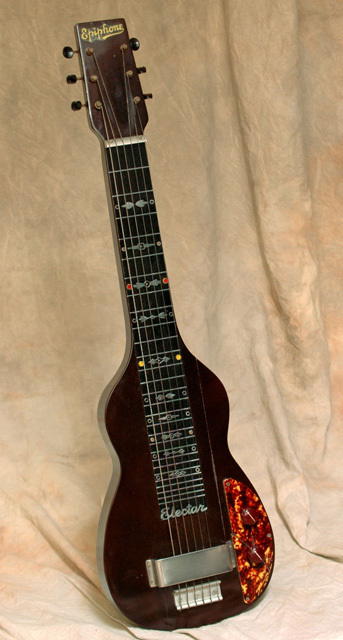 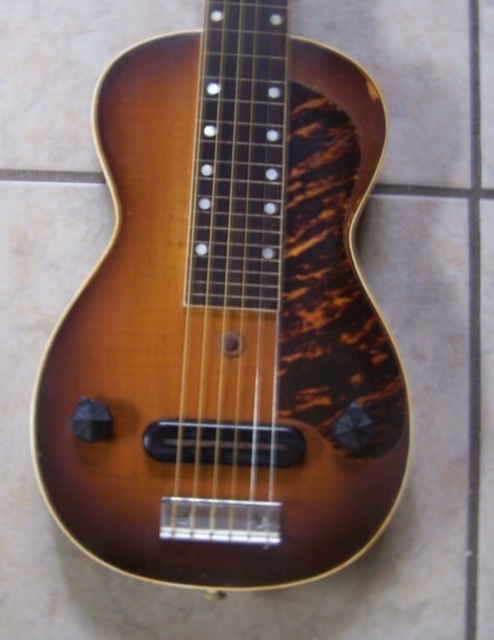 35) Tone Spectrum pickup shown on Zephyr DeLuxe Cutaway model, adverts in "Music Dealer", May 1948, and "Down beat", June 16, 1948 (Fisch 1996, p124); this pickup type underwent several changes (see Fisch 1996, p15). 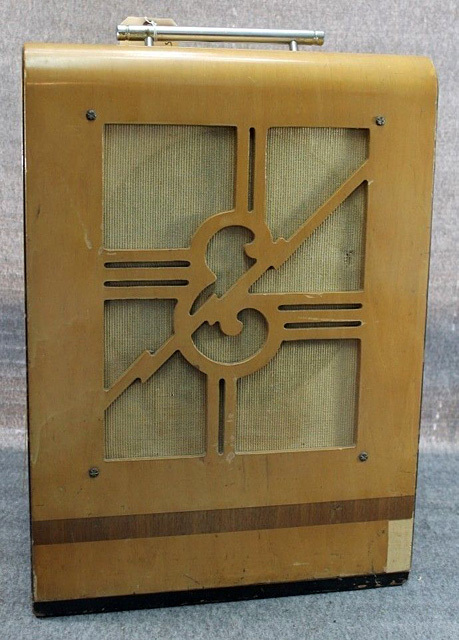 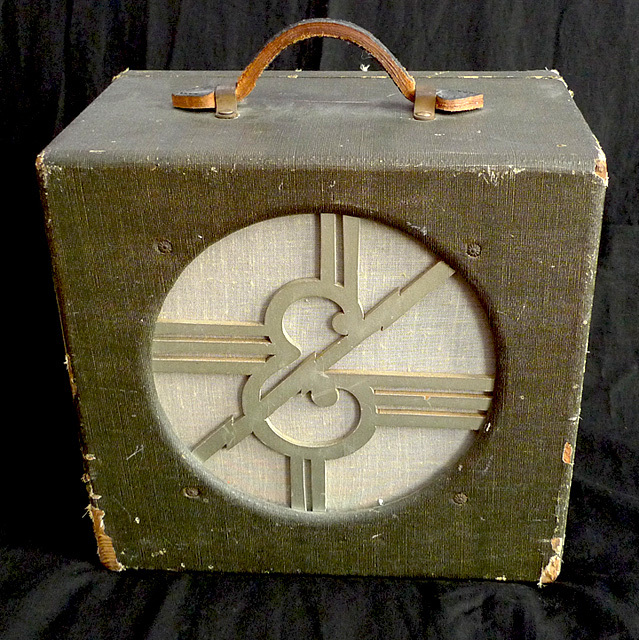 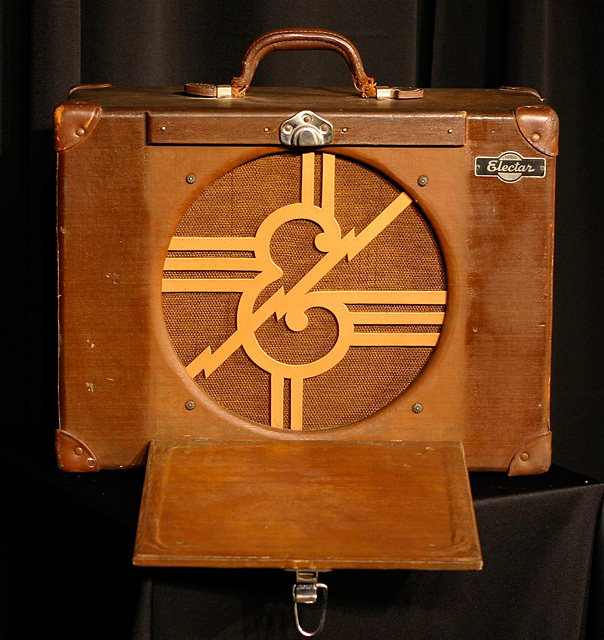 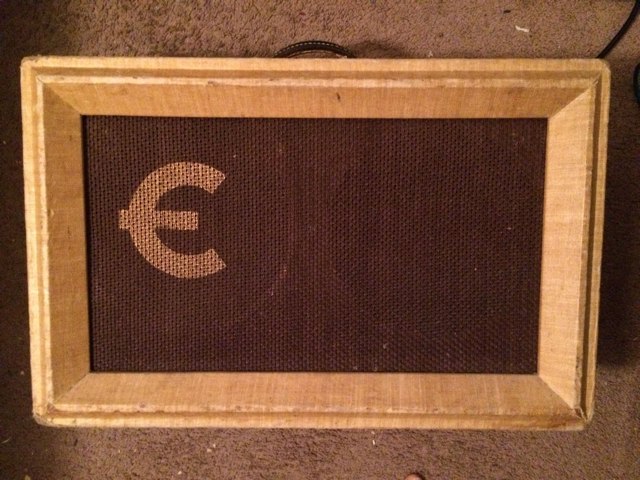 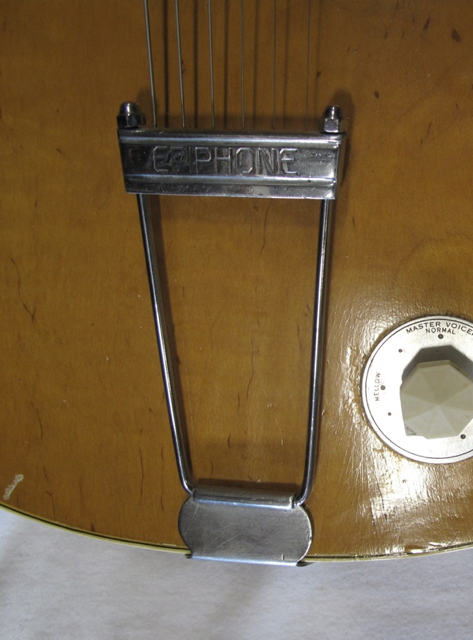 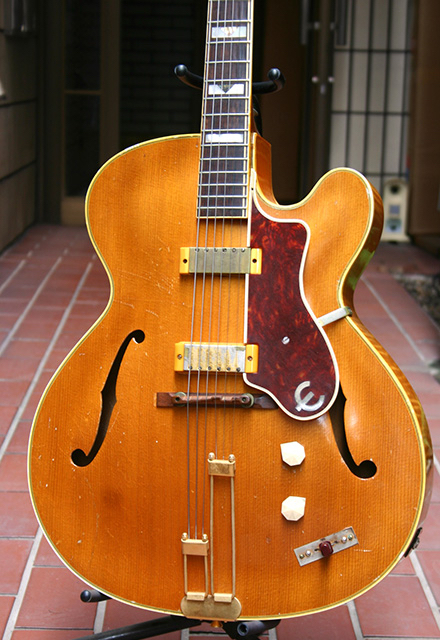 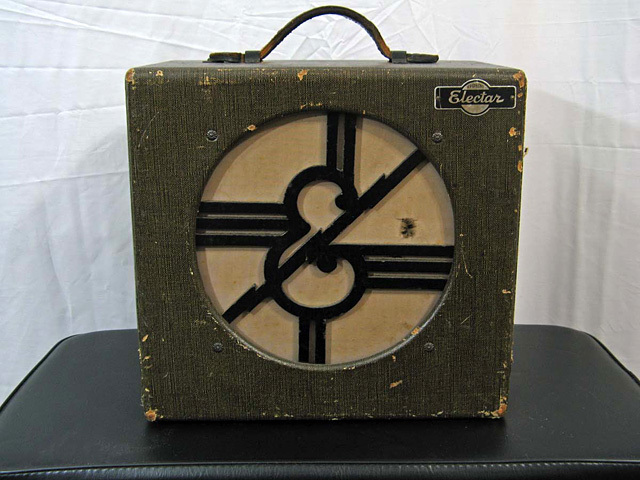 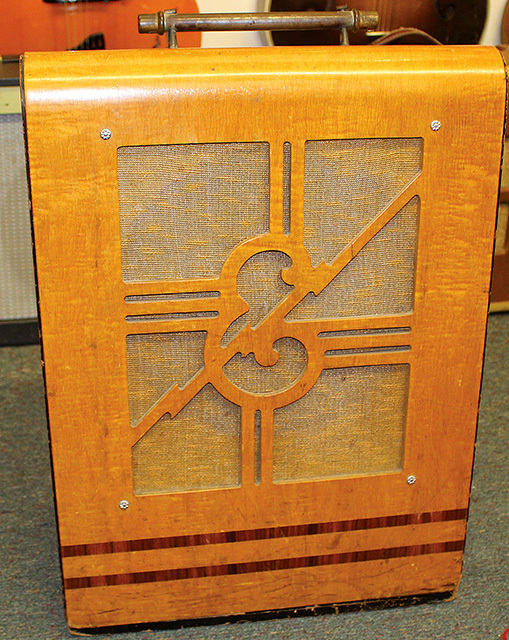 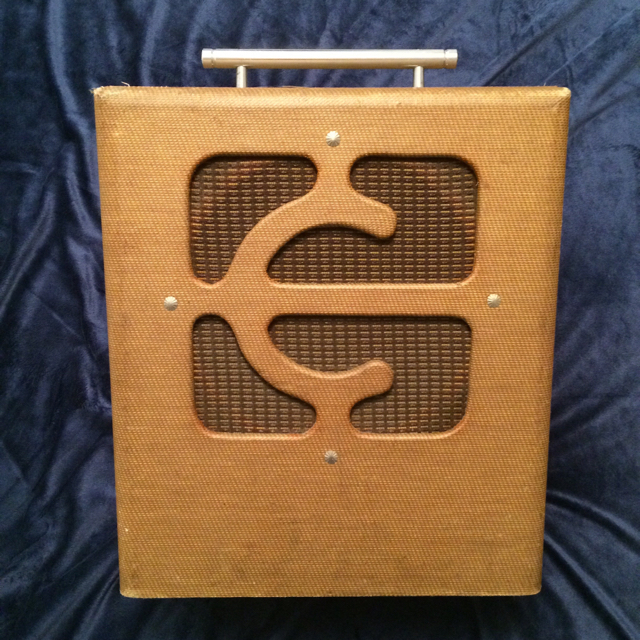 36) All early Epiphone amps were built with circuitry designed and manufactured by Nathan "Nat" Daniel (who later founded the Danelectro company); after the exclusive cooperation with Daniel allegedly ended around 1947, Epiphone amps featured new circuitry with "Harmonic Vibrato" option (see Fisch 1996, p143ff). 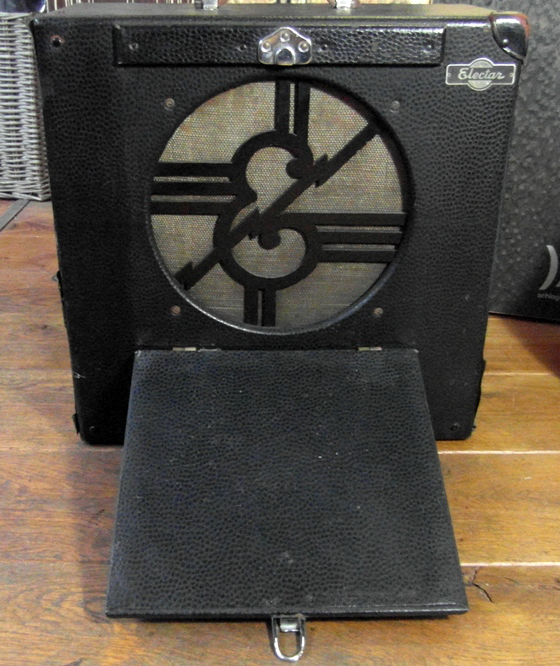 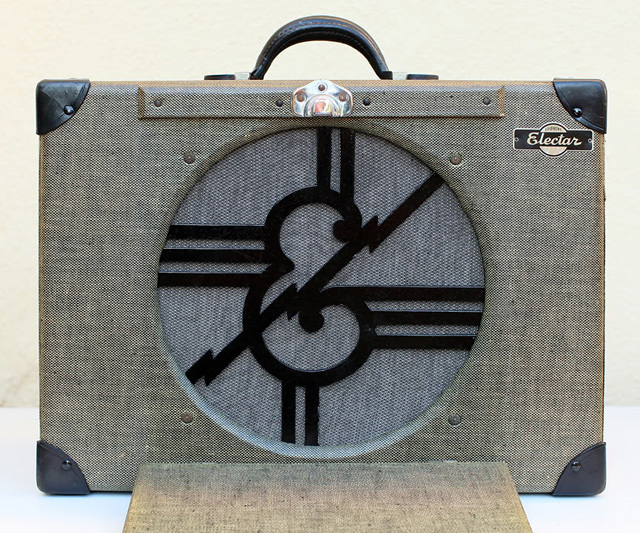 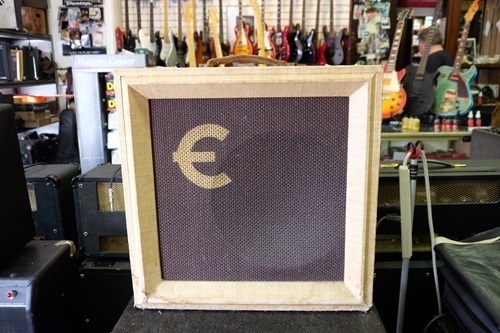 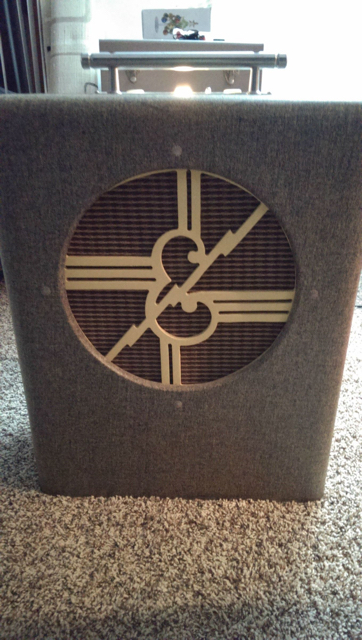 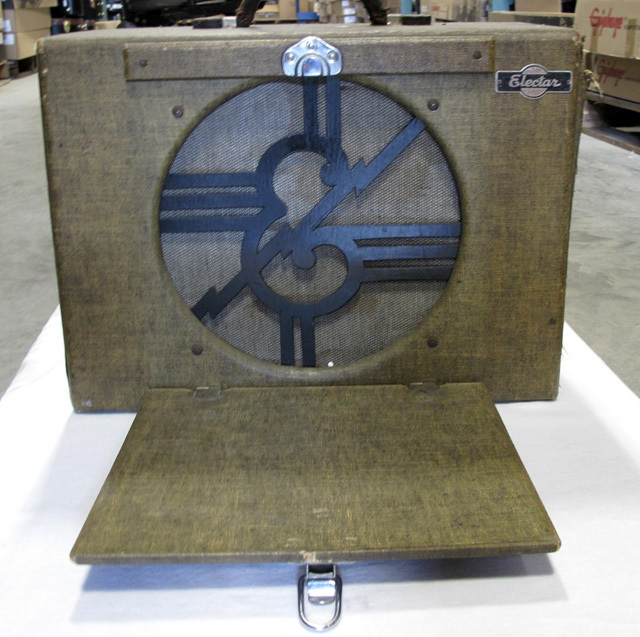 At least some of Epiphone's 1950s amps appear to be made by Danelectro. 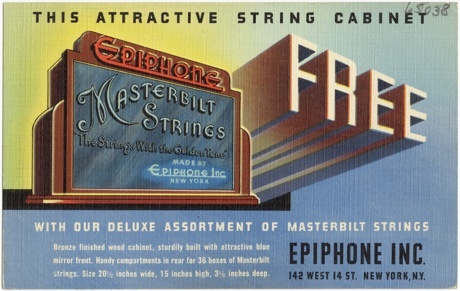 37) Price list, March 1, 1949, still refers to the old Catalog V; the 3 new catalogs basically list the same prices with some additional options, so likely published later in 1949 or early 1950; prices increased in price list, July 15, 1950. 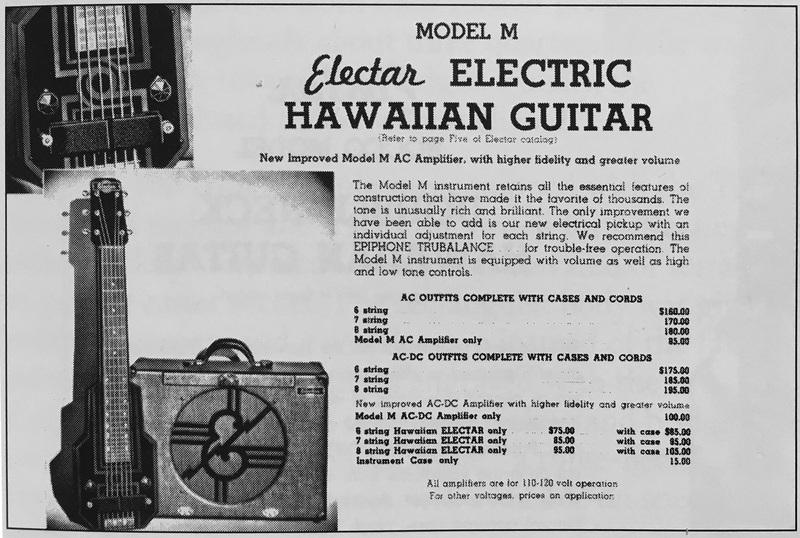 38) Advert in "Metronome", Nov 1950 (Fisch 1996, p126); the model also appears in the price list, Nov 15, 1950. 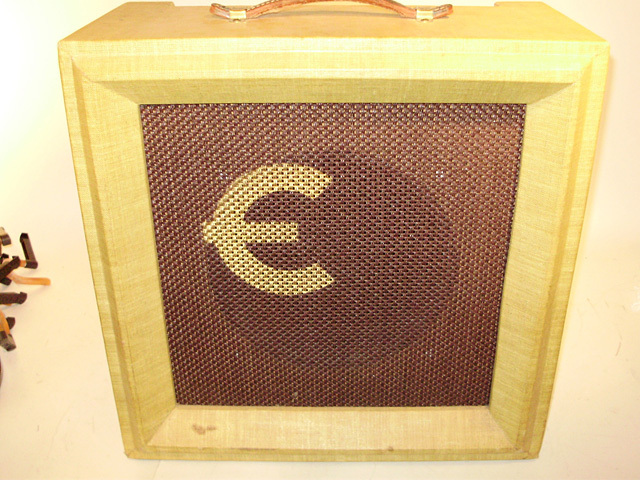 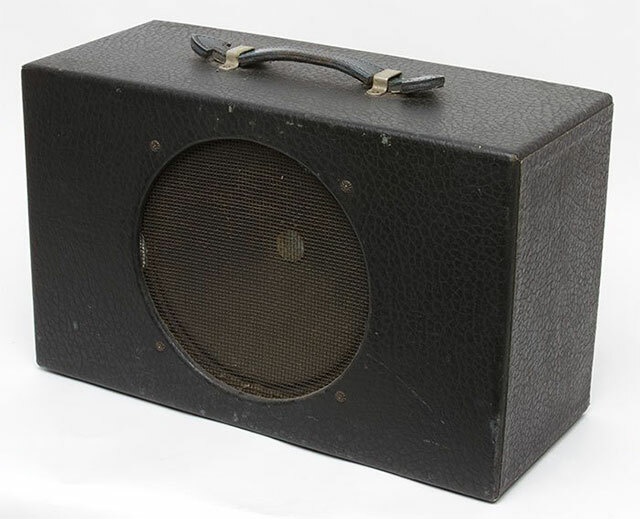 39) Asta Amplifier: price list, July 15, 1950; not mentioned in price list, Nov 15, 1950; we haven't found any picture of this short-lived amp model in Epiphone sales literature; however examples of an obscure amp model with E logo style grille have surfaced which we assume to be the Asta model (first SN 2027); Fisch 1996, p270. 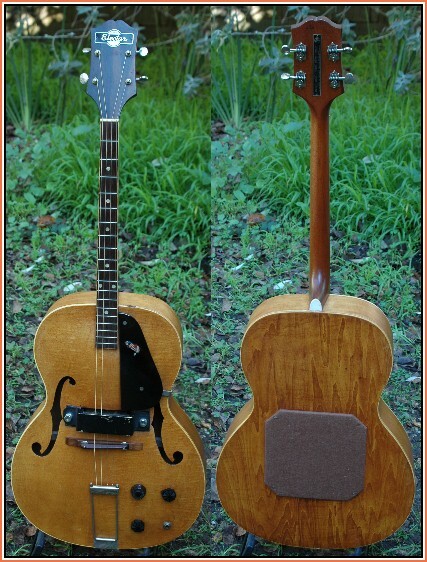 40) Article in "The Music Trades", April 1952 (Fisch 1996, p53ff). 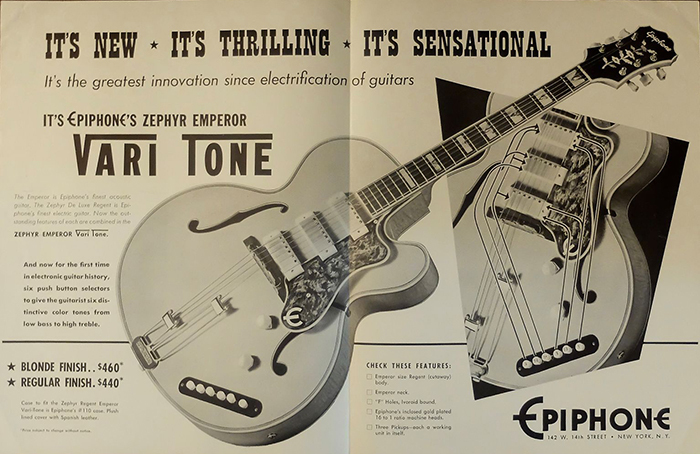 41) Advert “Fretted Instrument News”, March/April 1955 (Fisch 1996, p214).